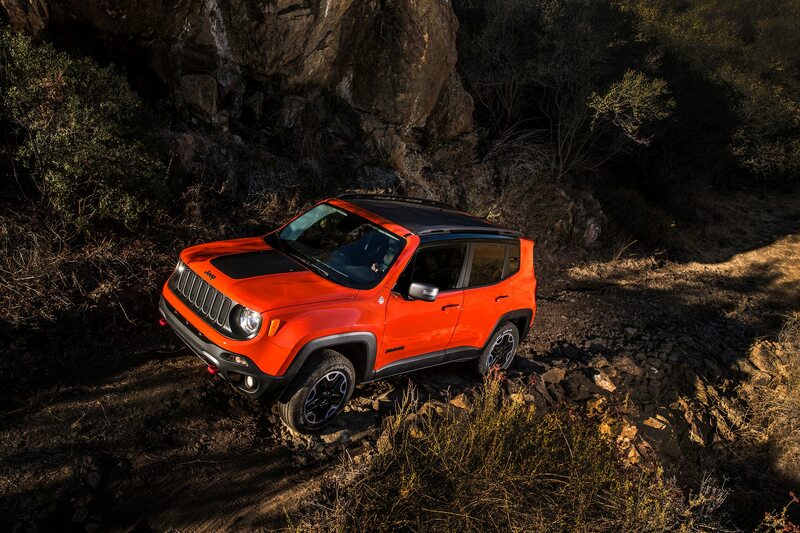 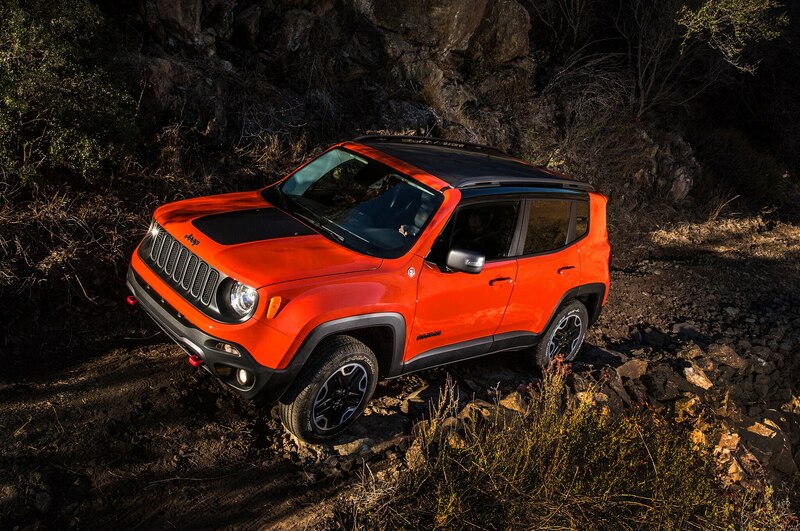 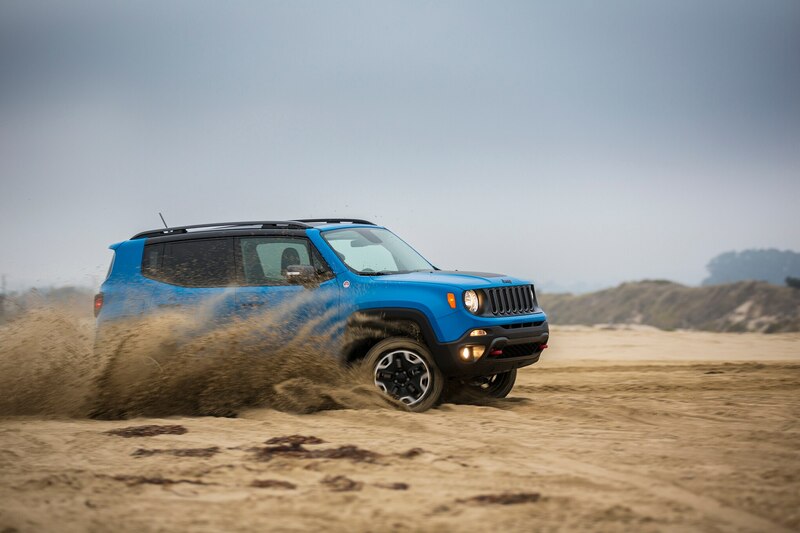 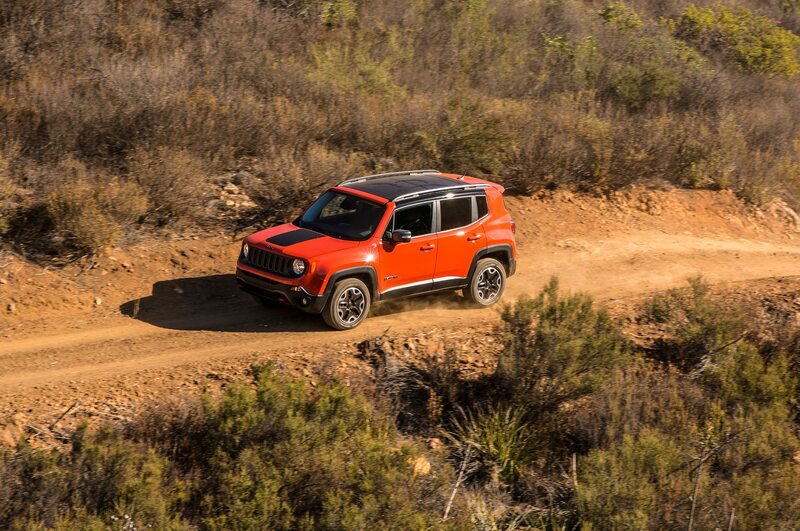 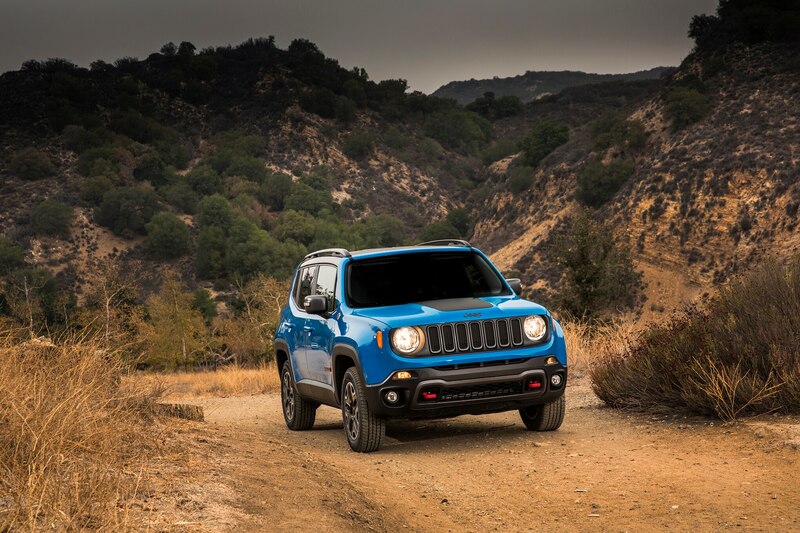 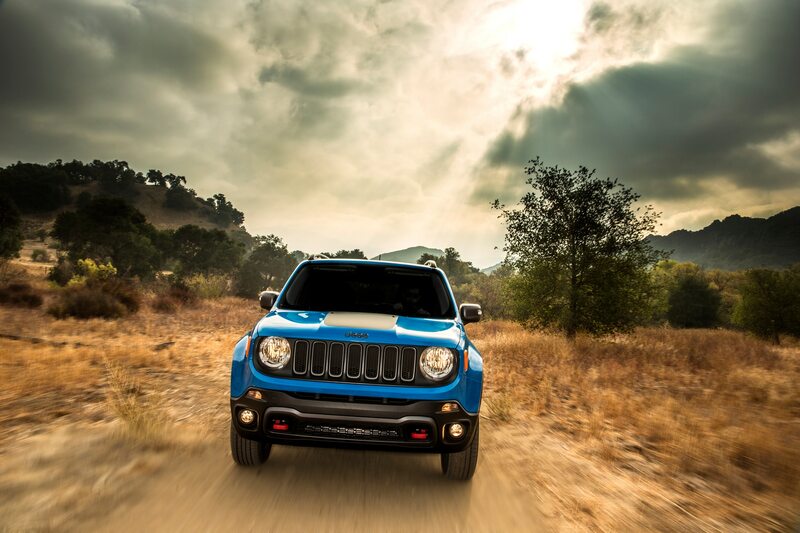 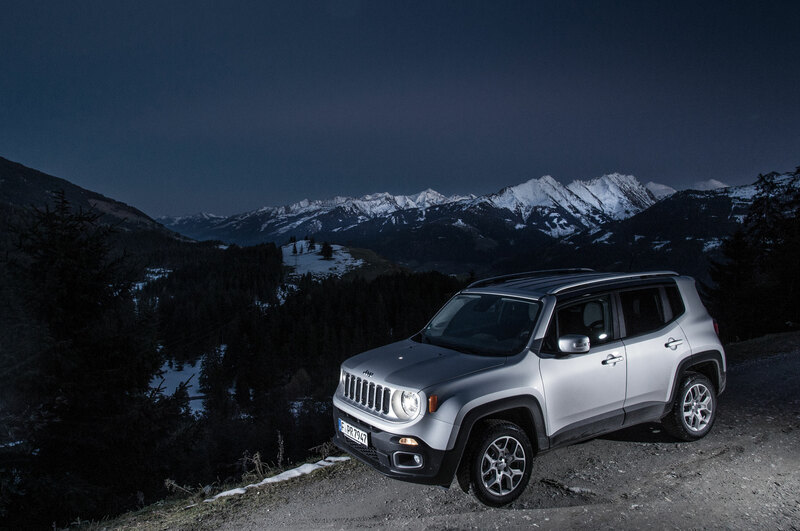 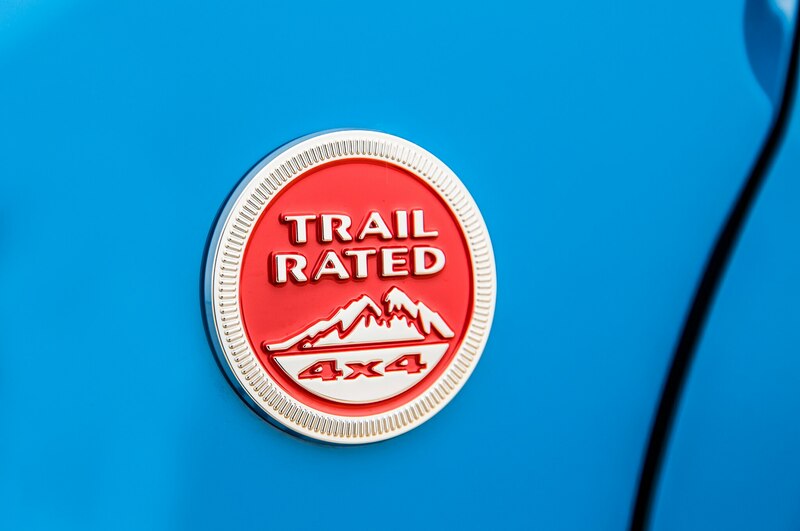 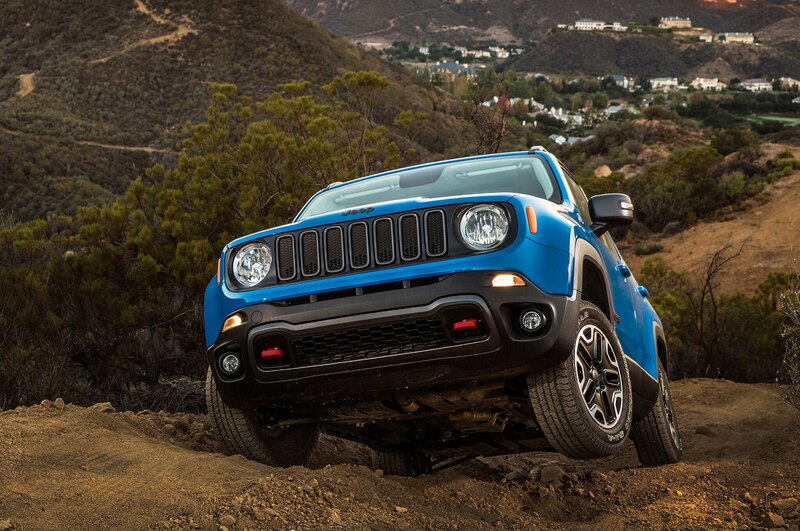 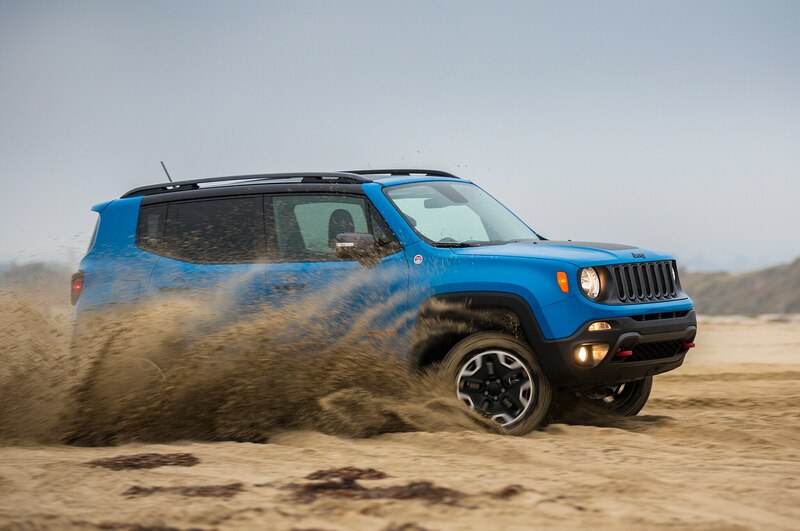 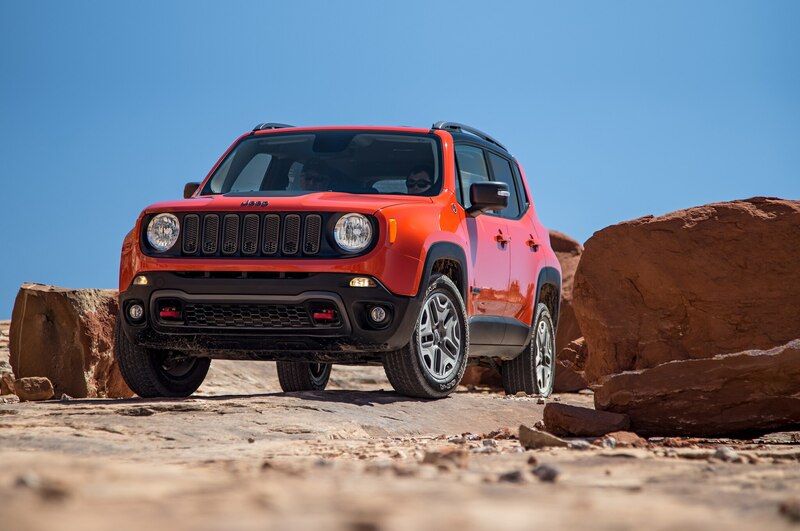 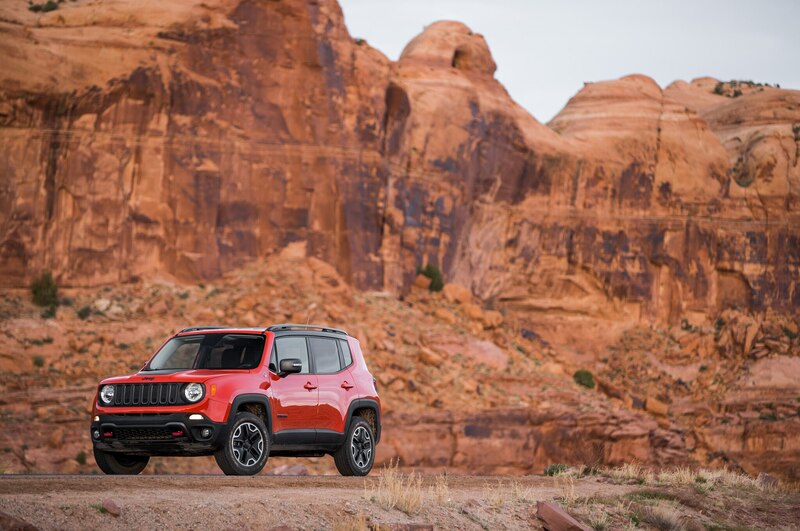 Now with a full line of capable off-roaders, Fiat-Chrysler’s Jeep brand has landed on the continent with the Renegade, a new B-segment crossover designed to appeal to Europeans. 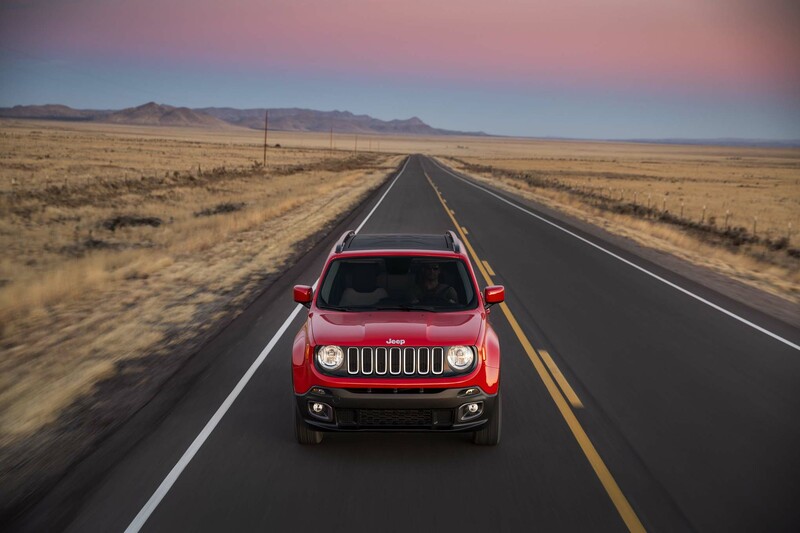 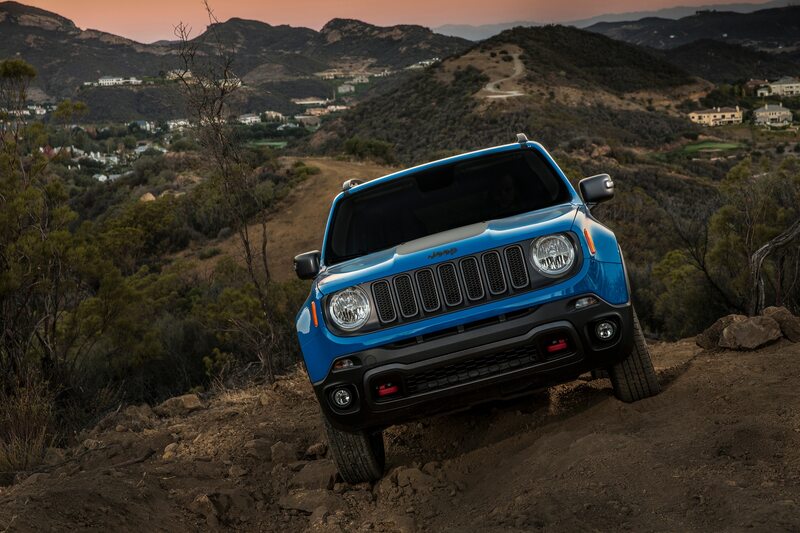 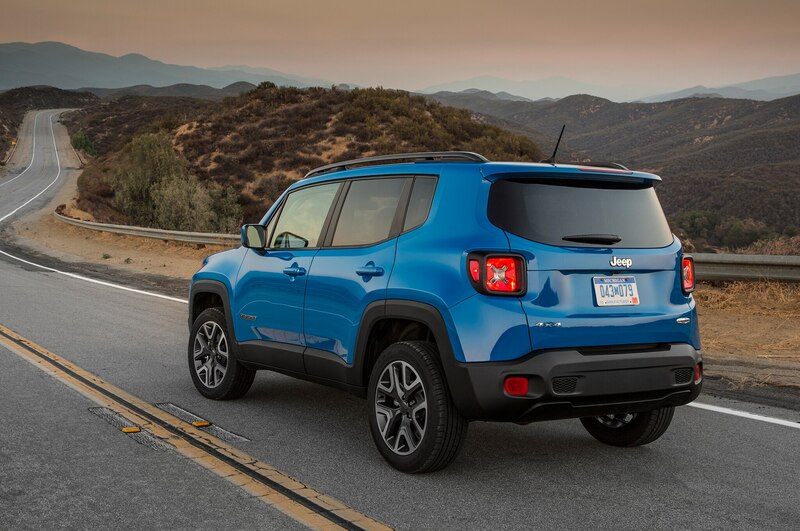 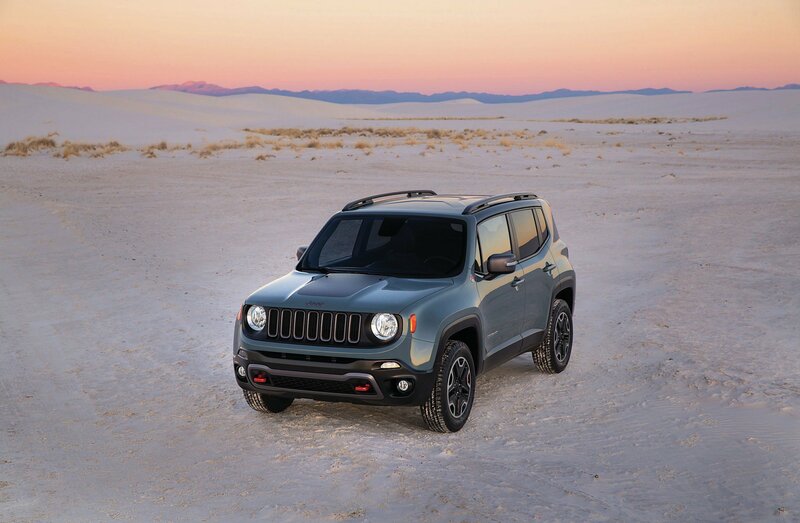 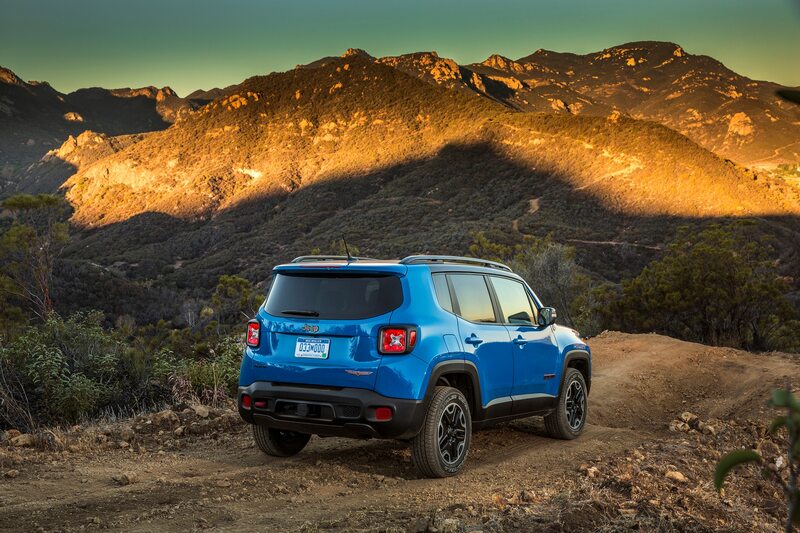 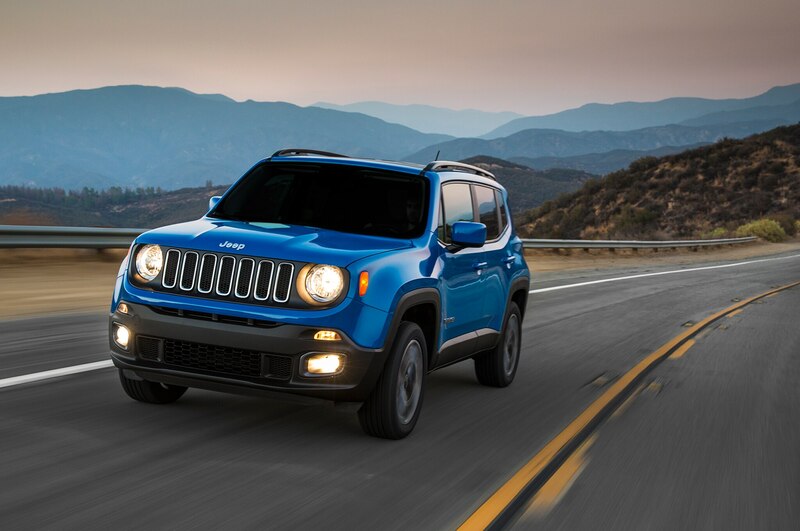 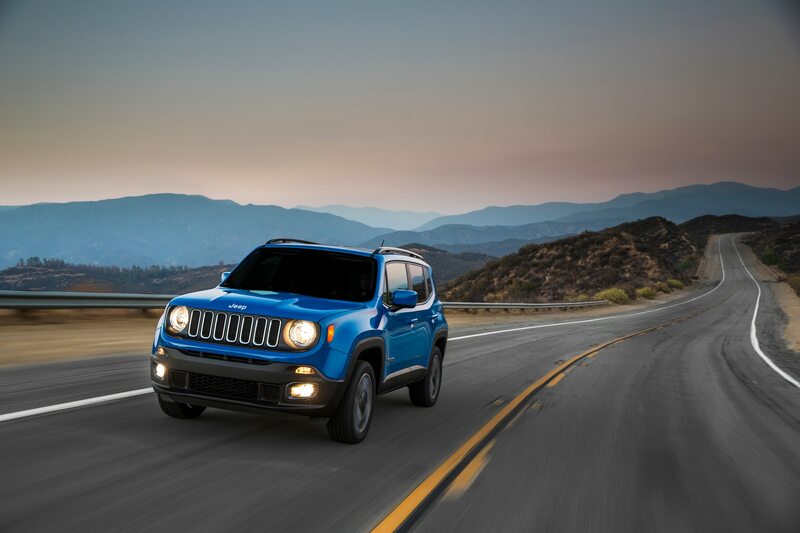 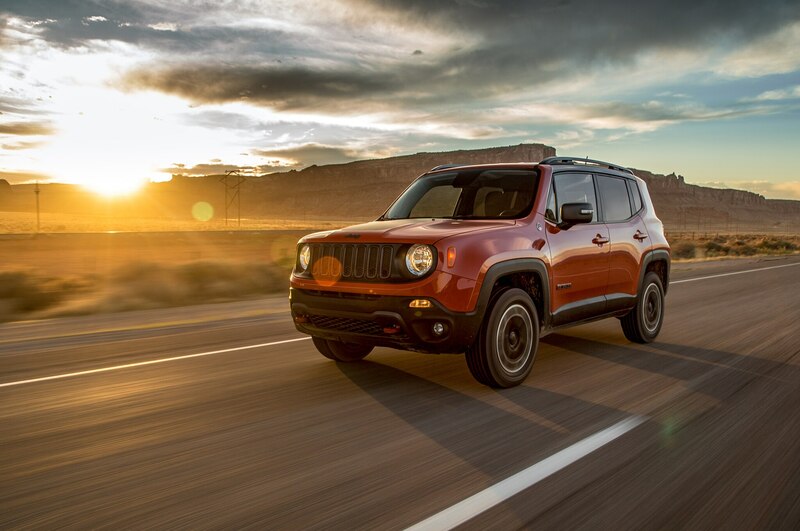 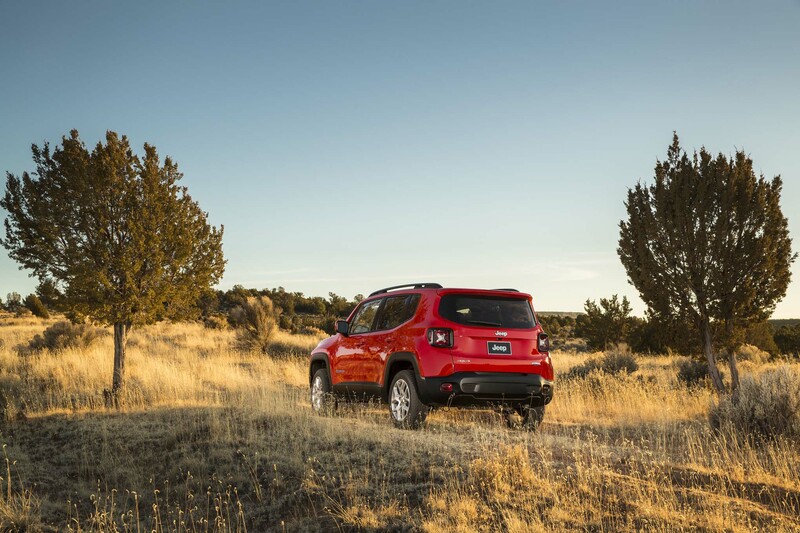 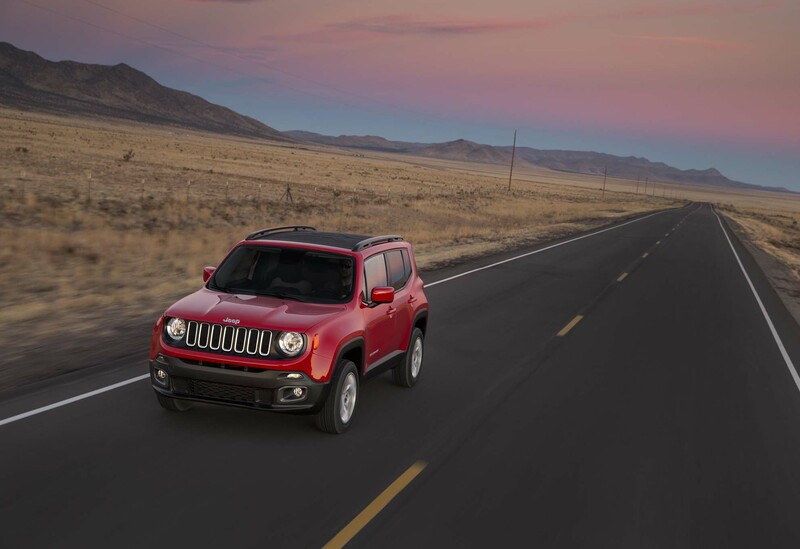 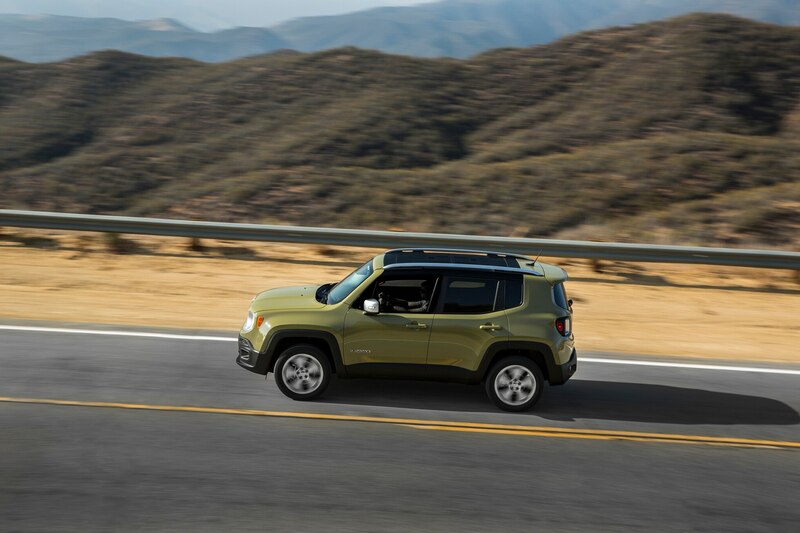 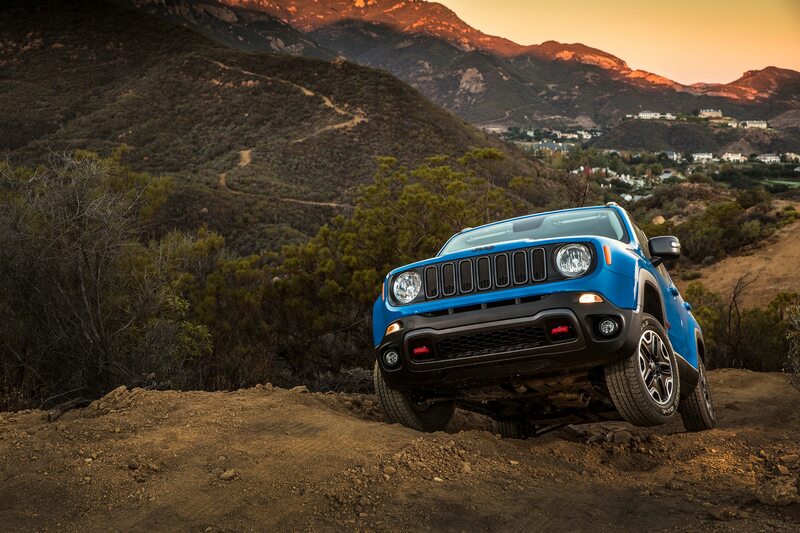 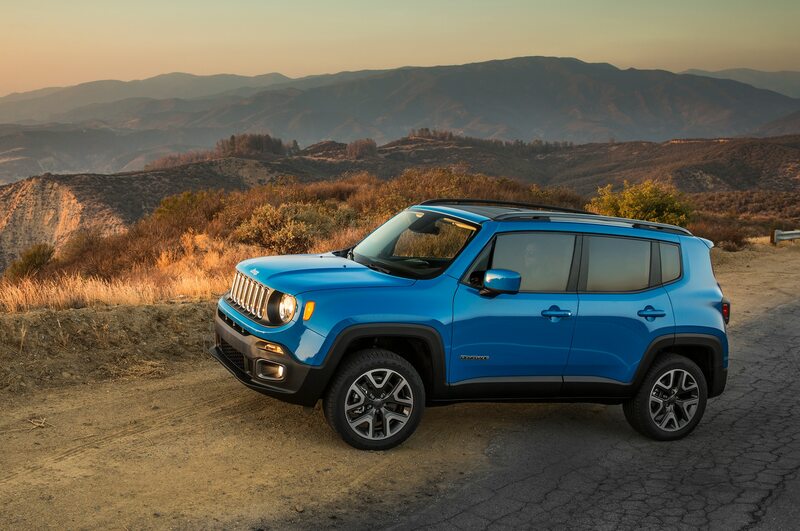 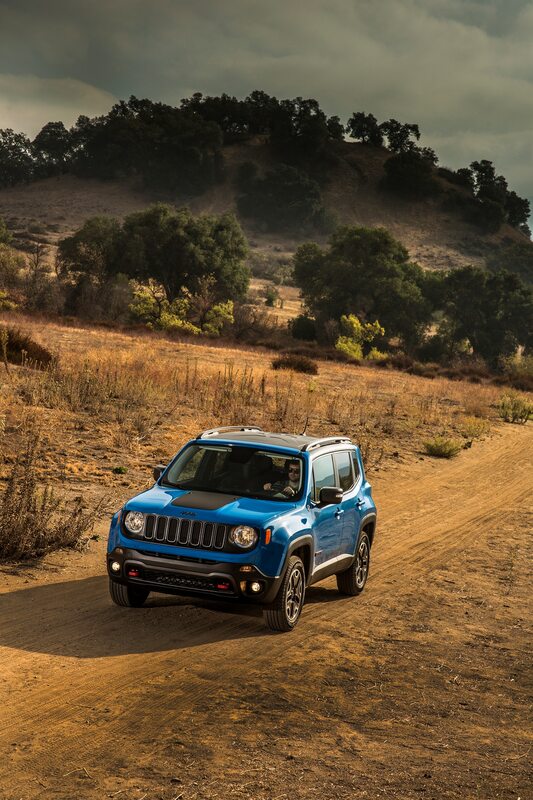 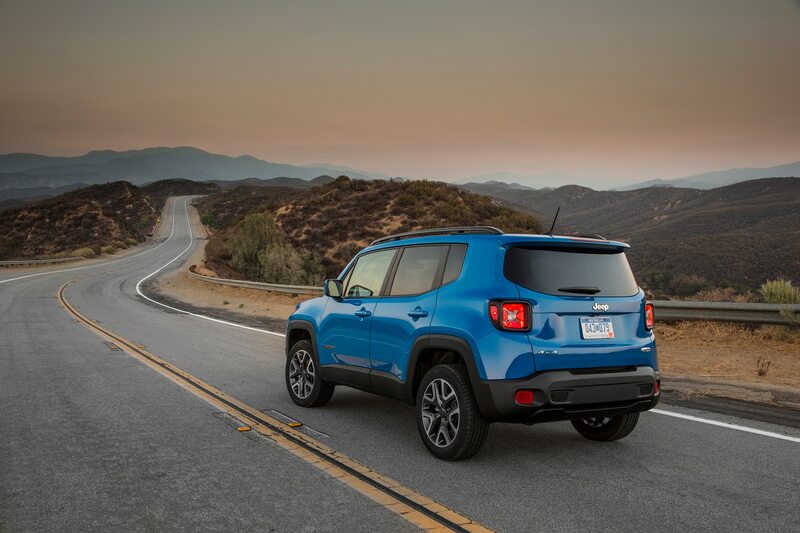 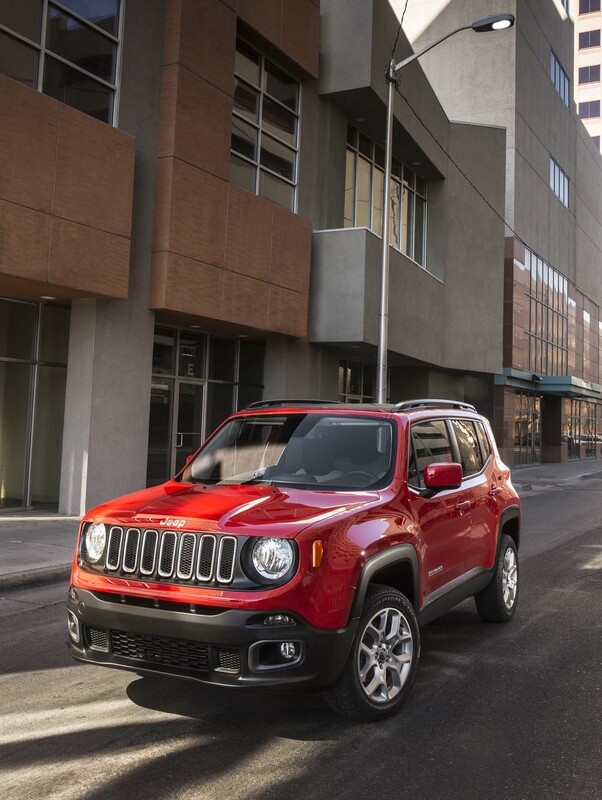 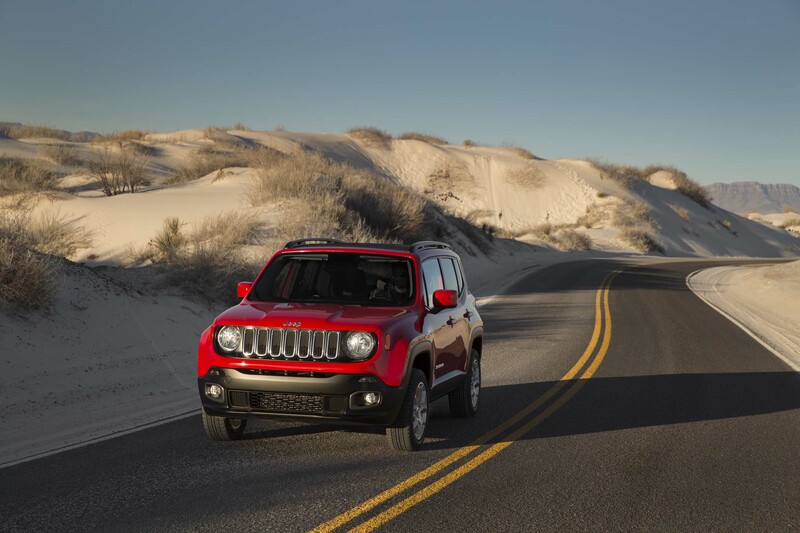 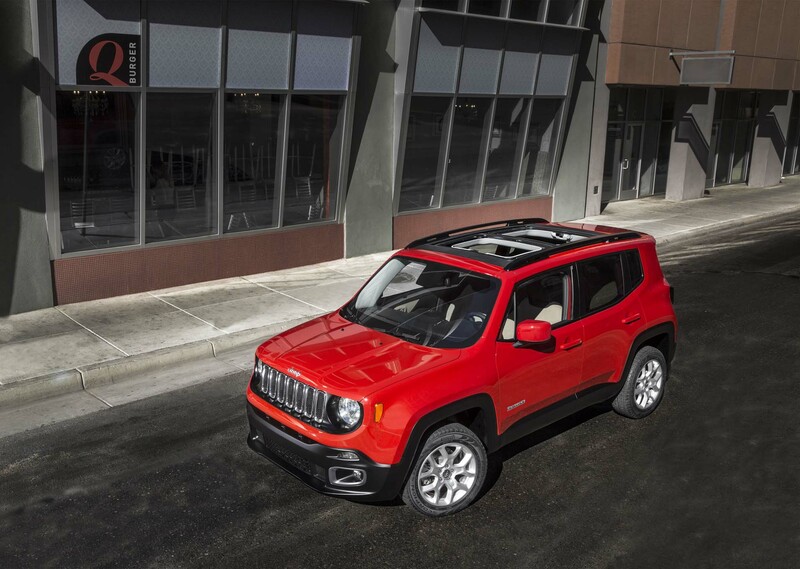 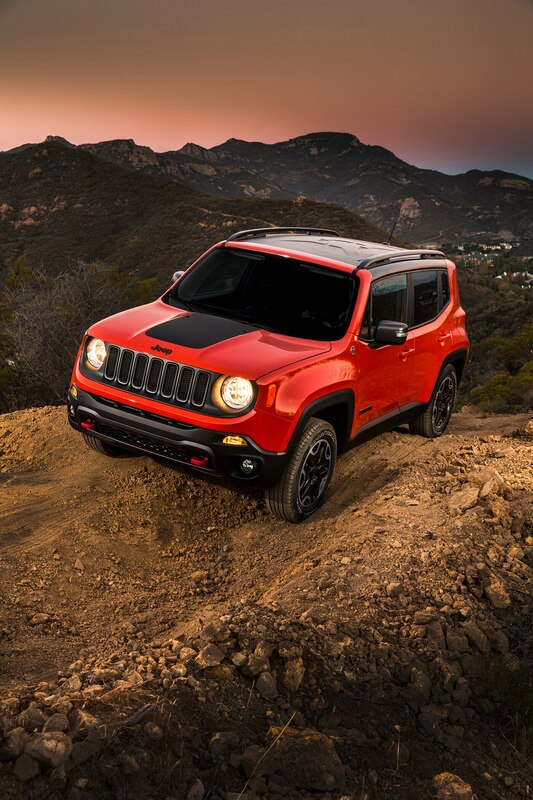 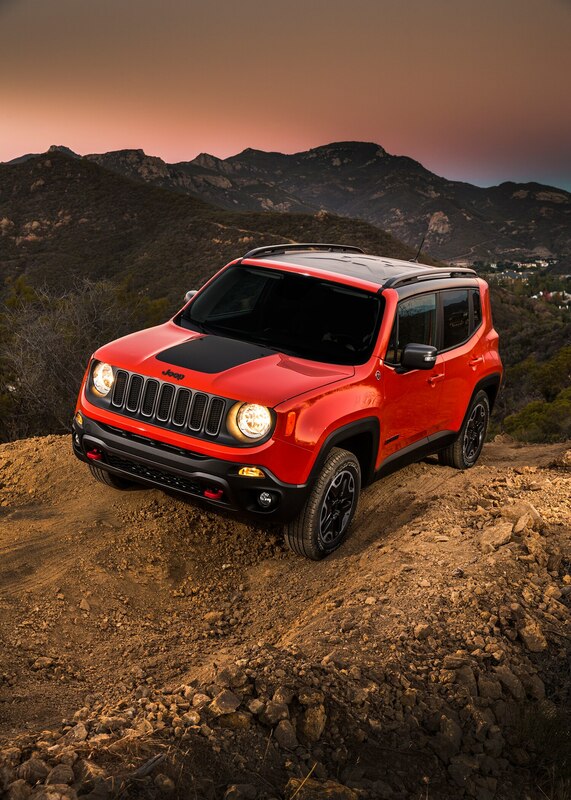 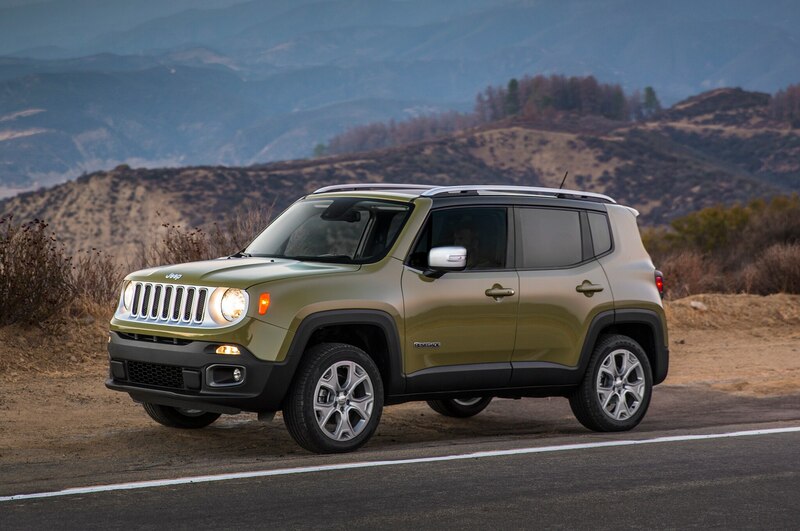 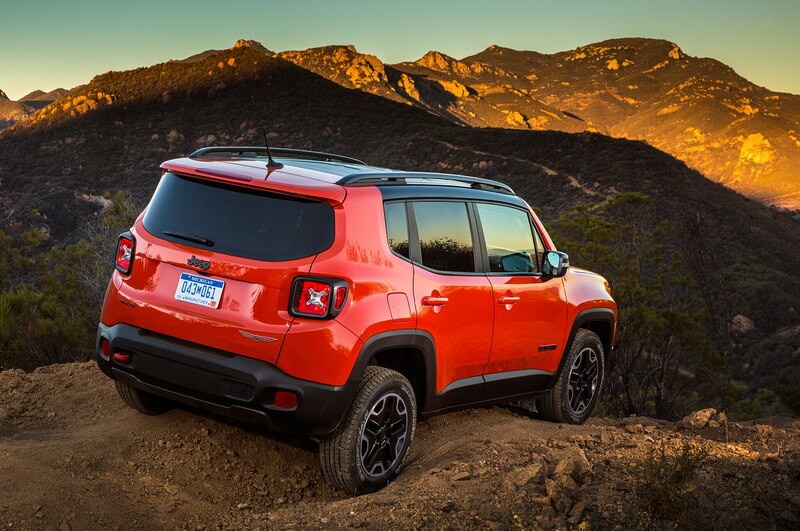 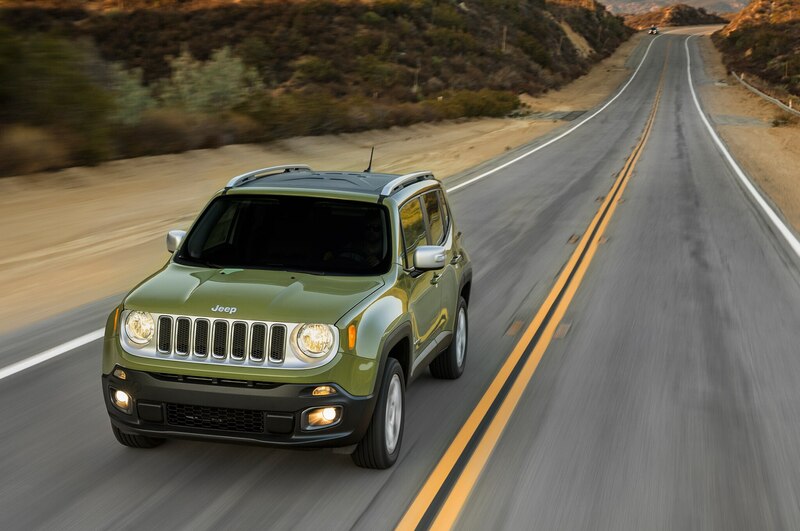 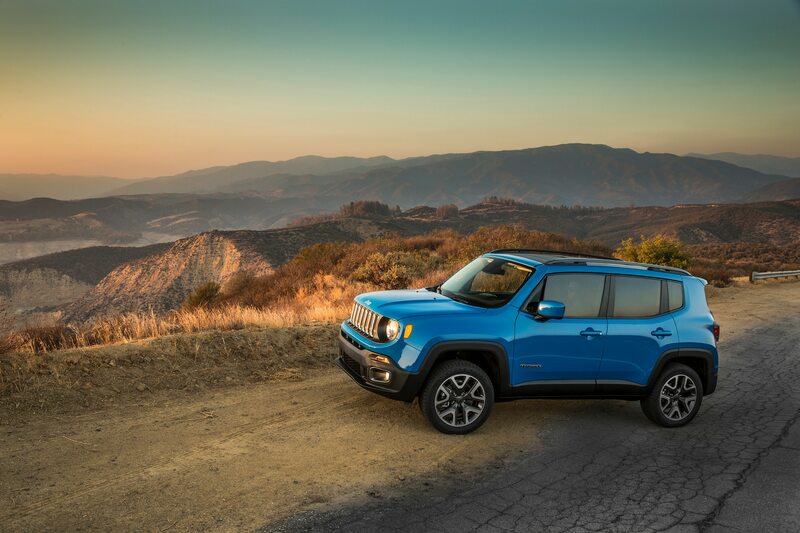 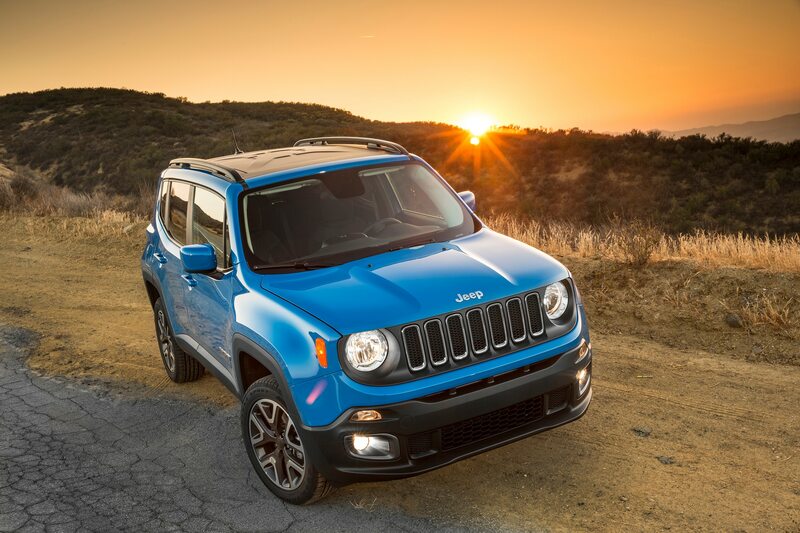 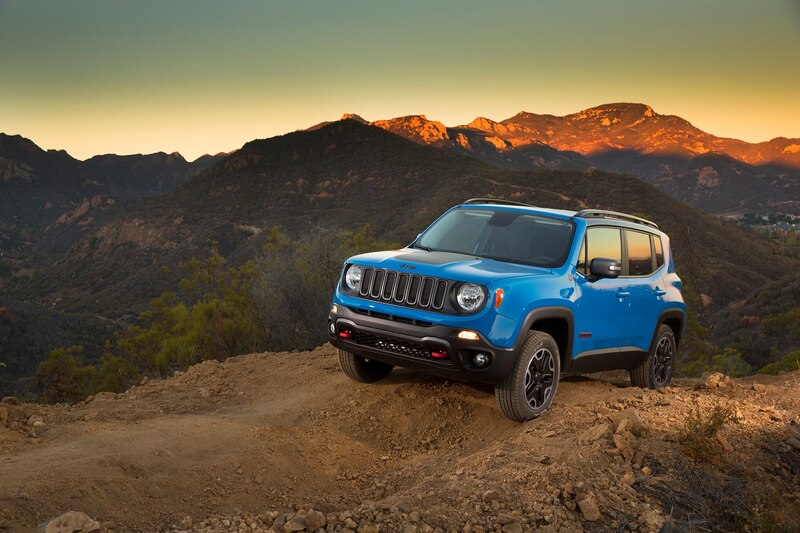 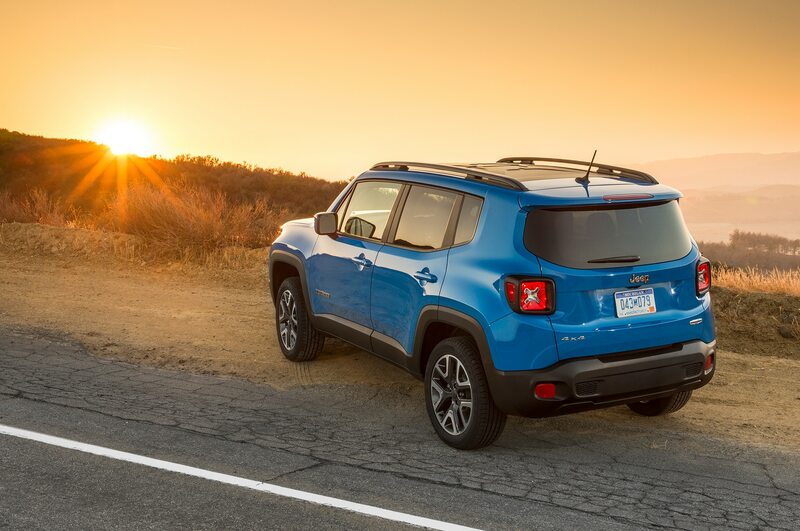 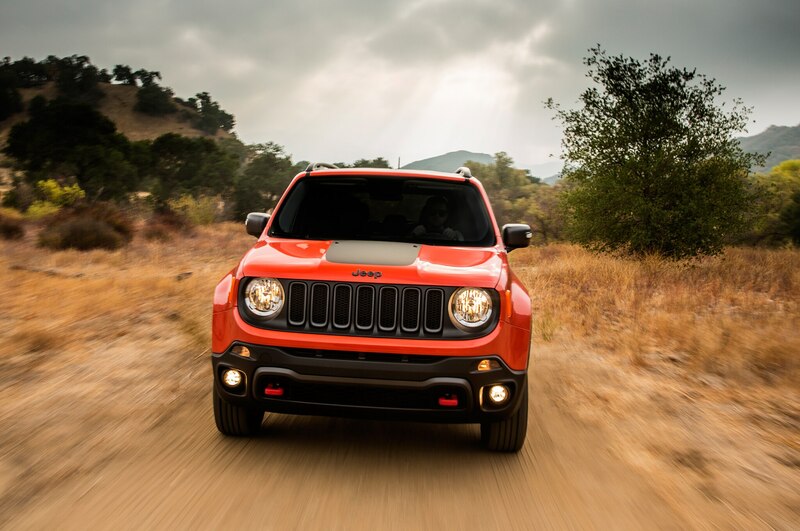 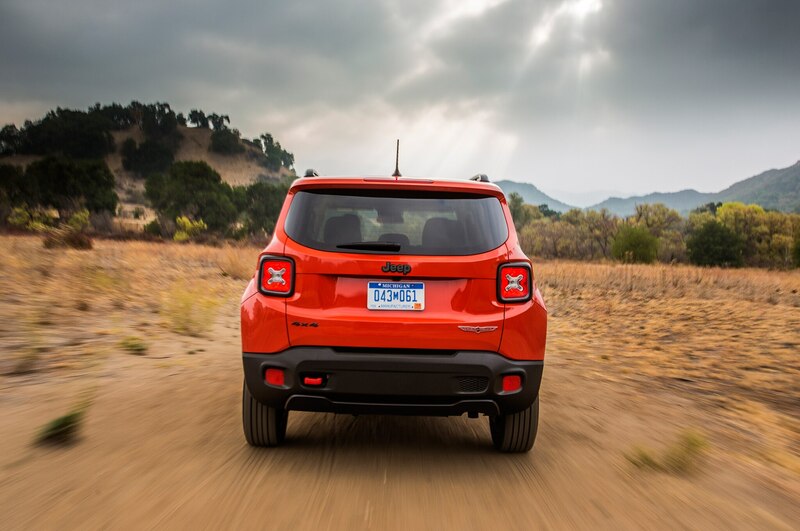 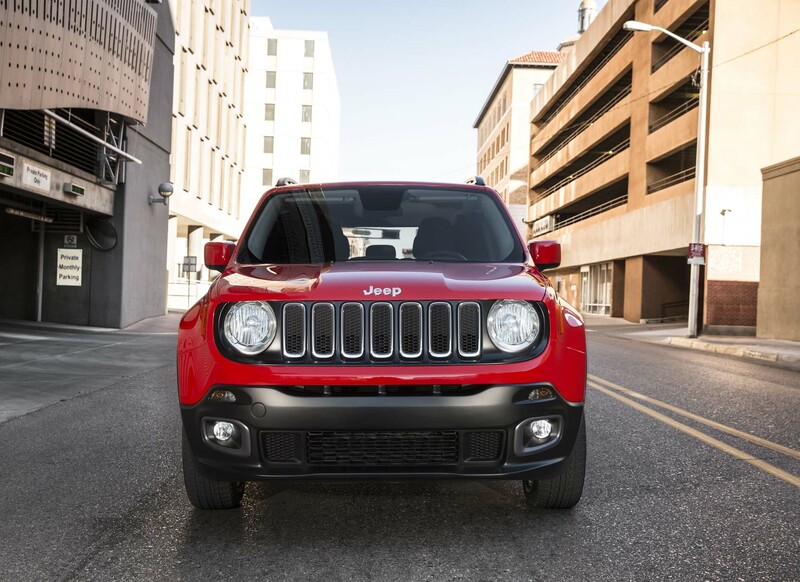 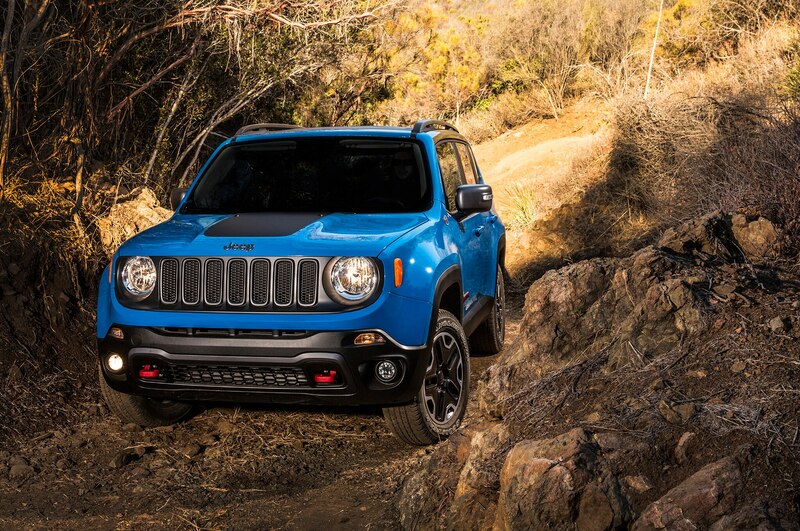 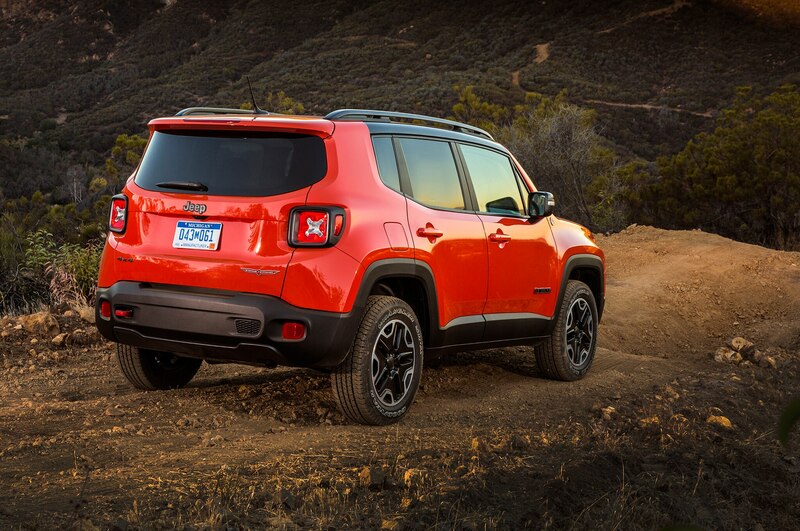 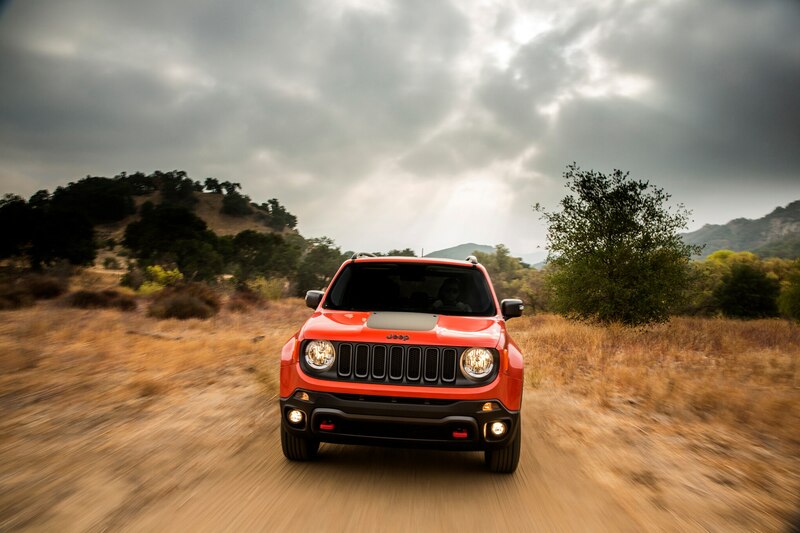 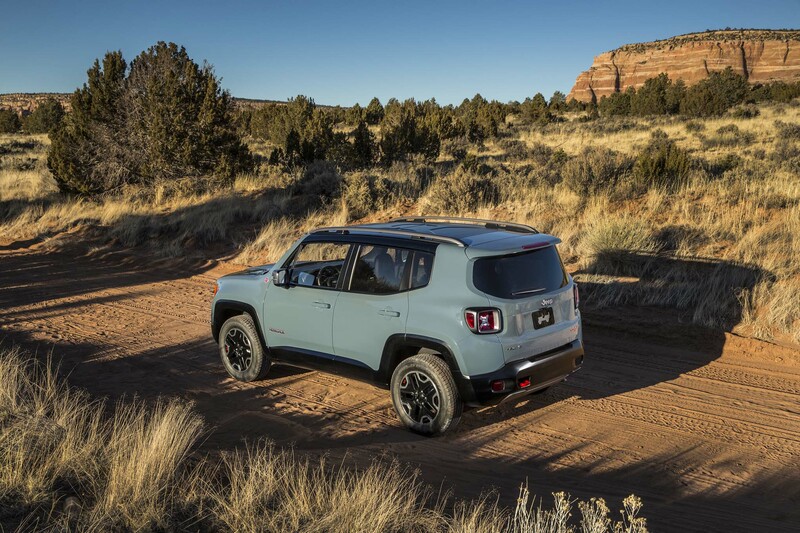 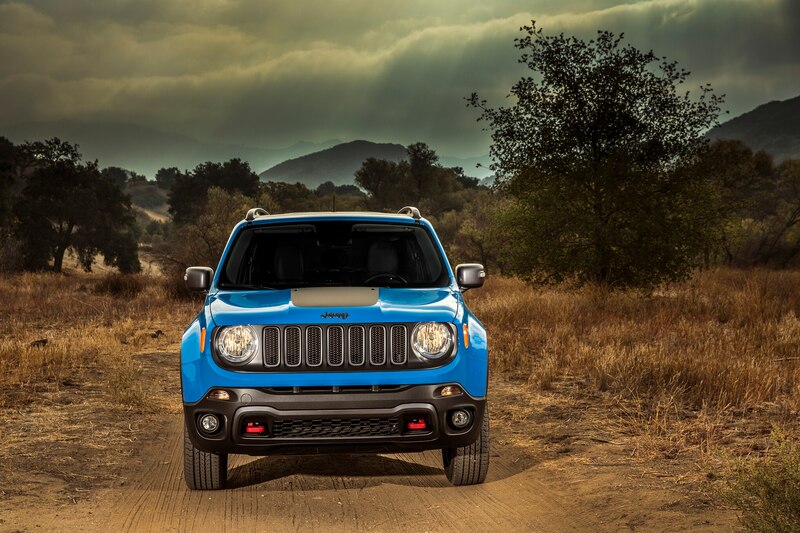 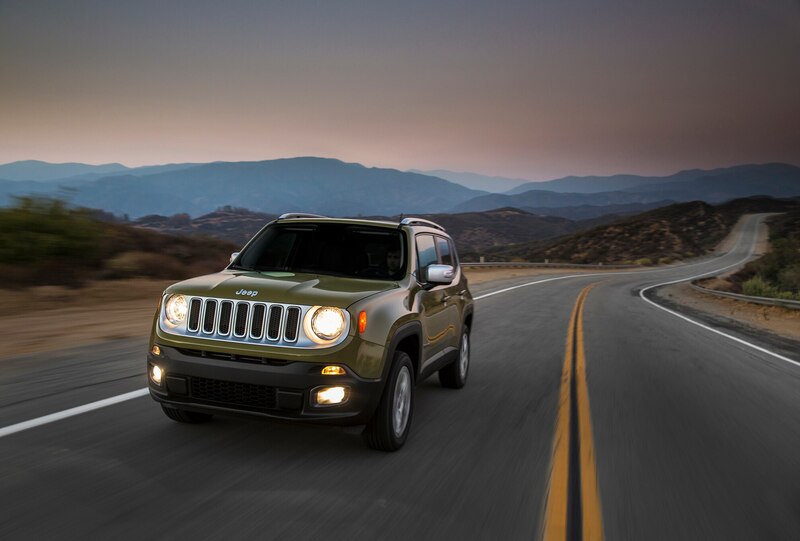 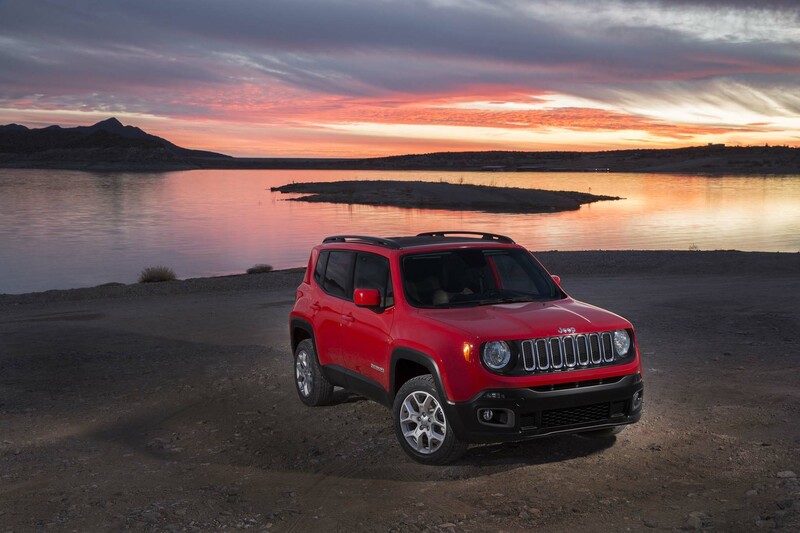 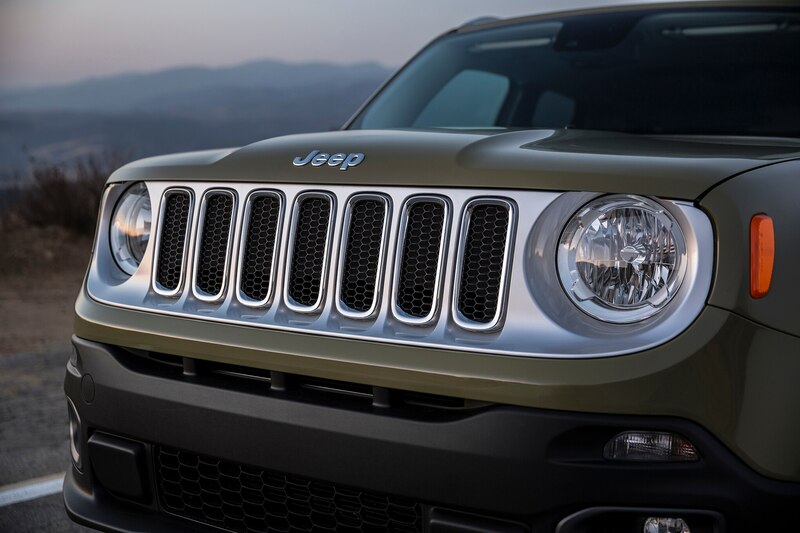 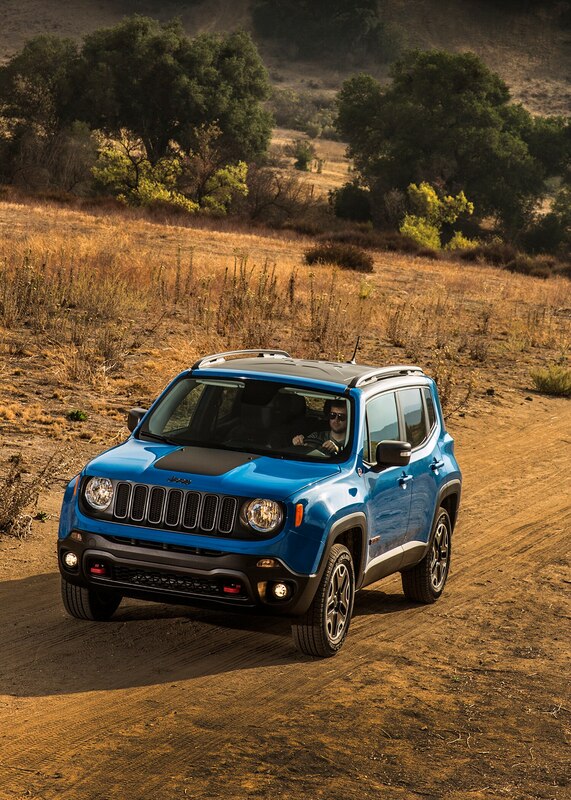 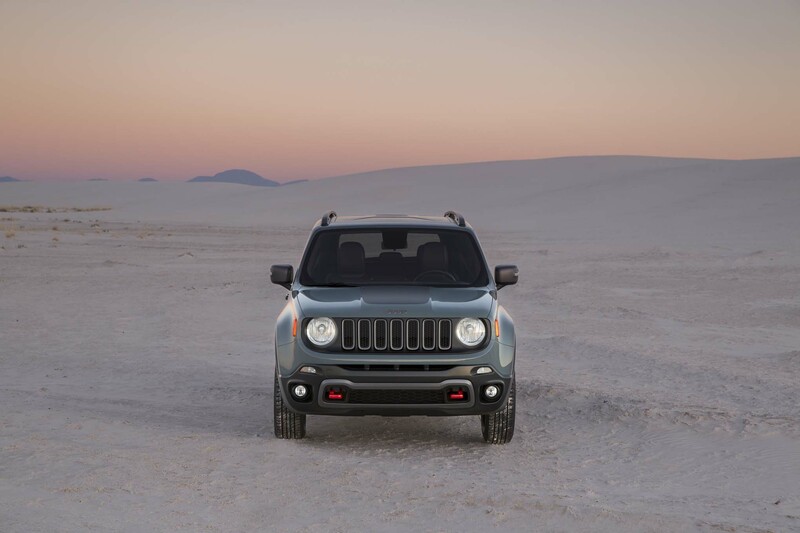 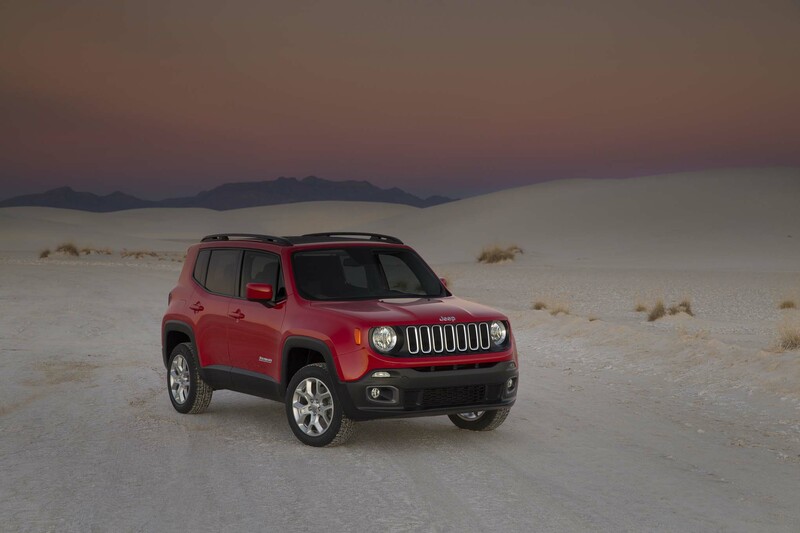 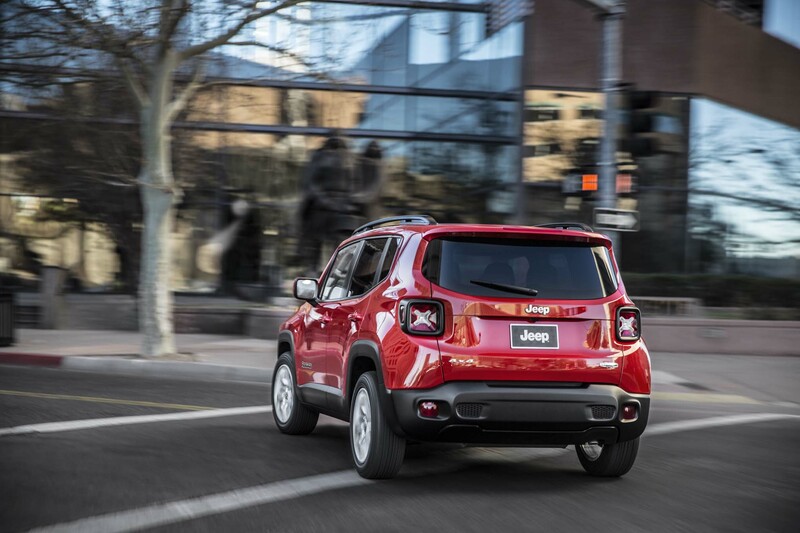 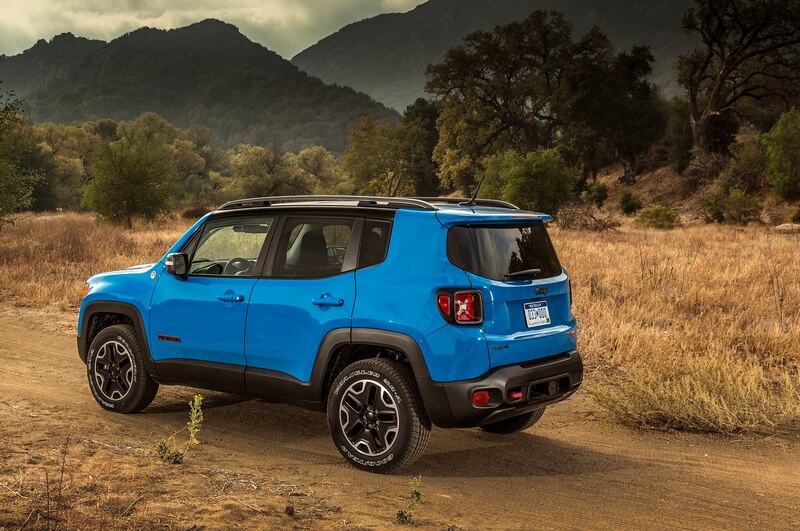 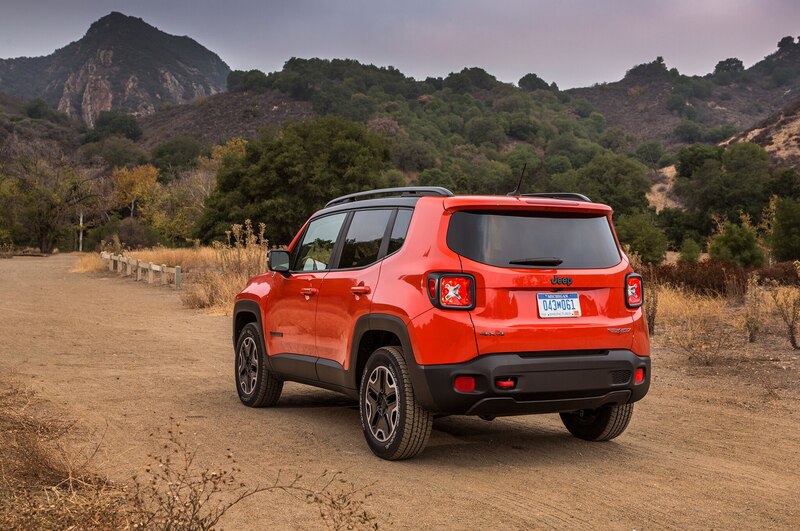 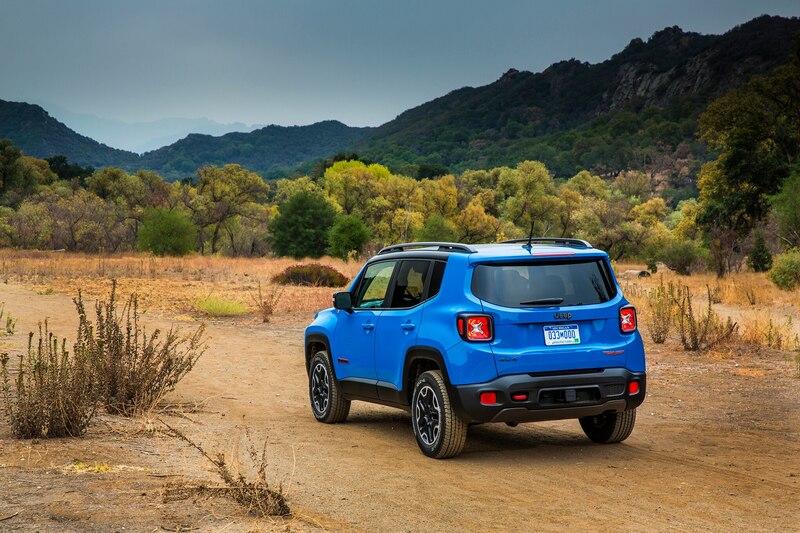 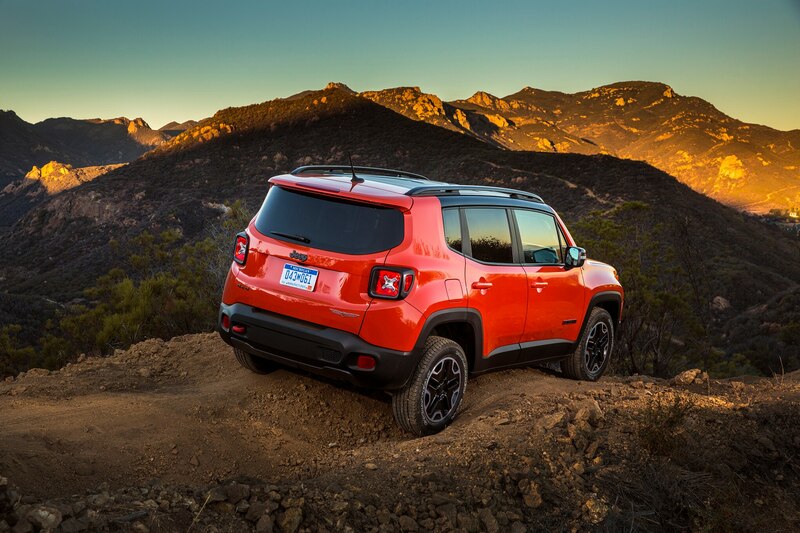 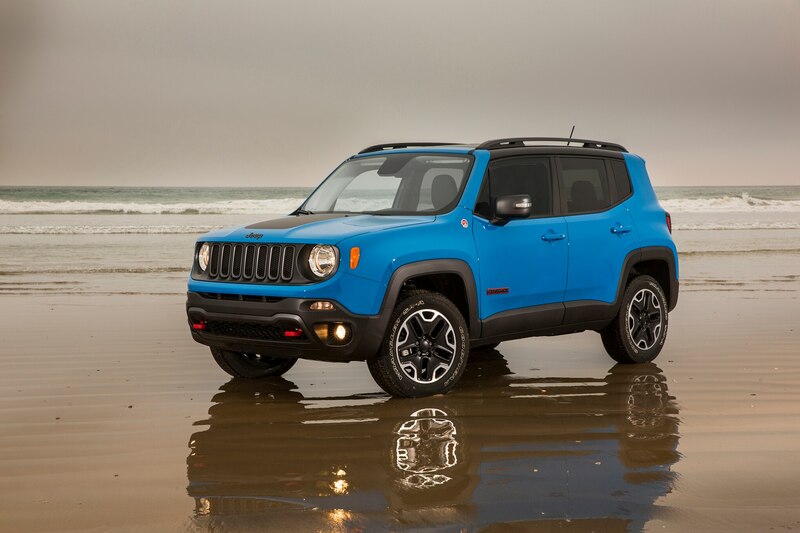 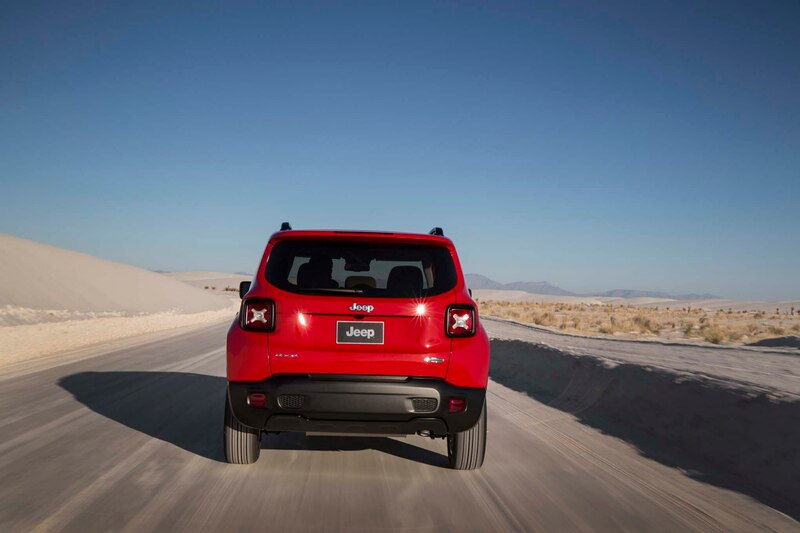 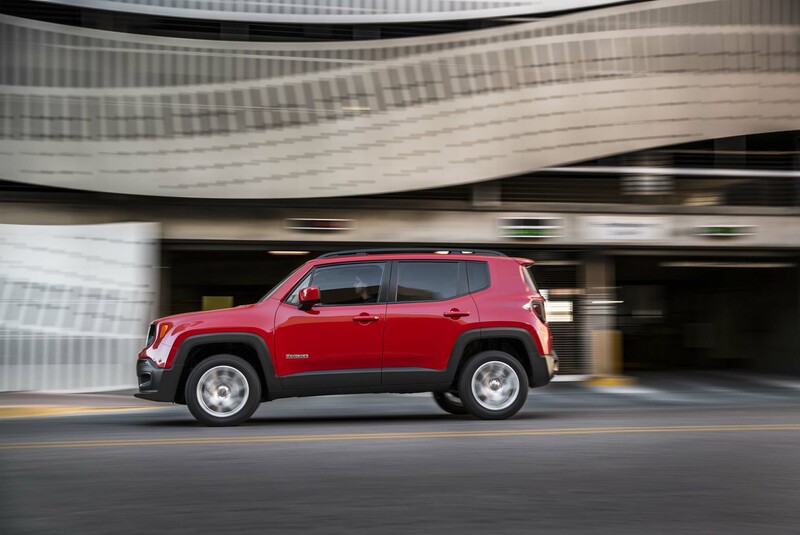 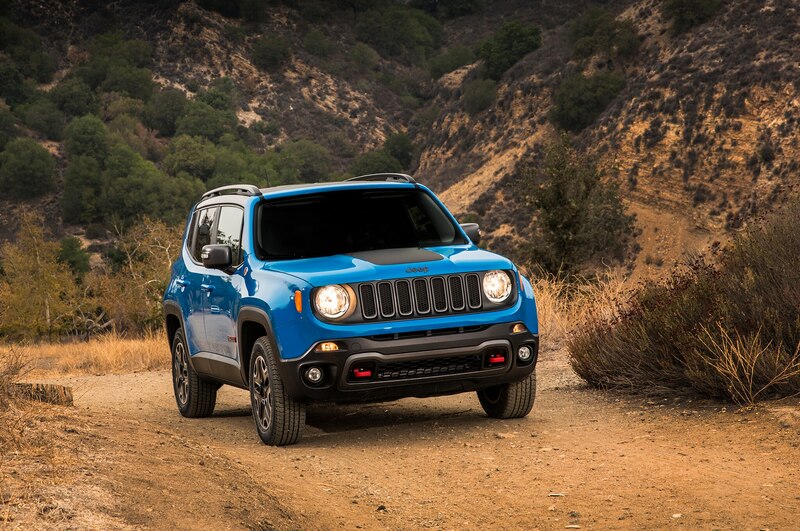 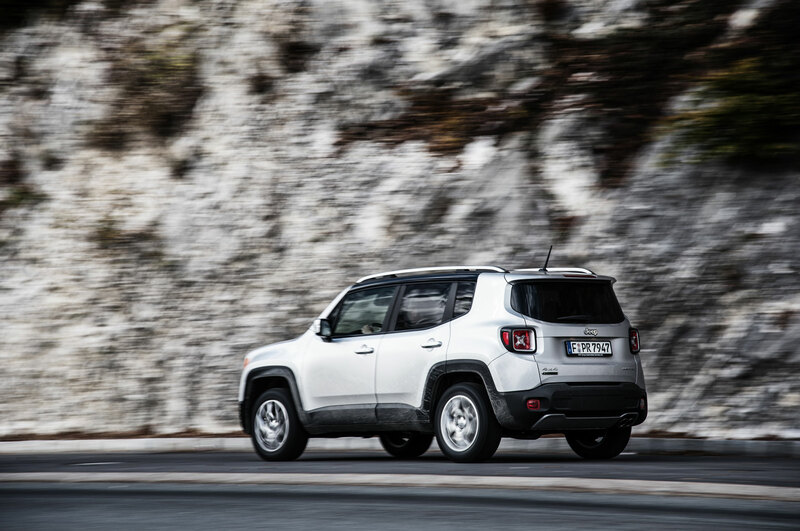 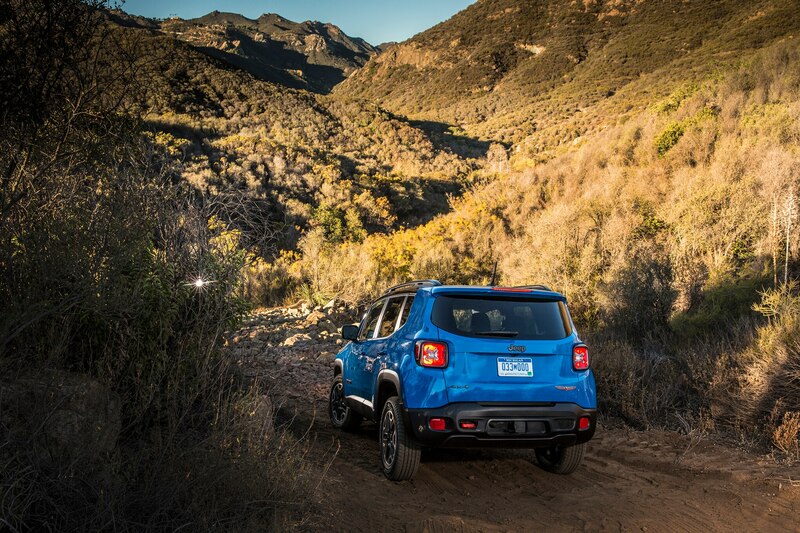 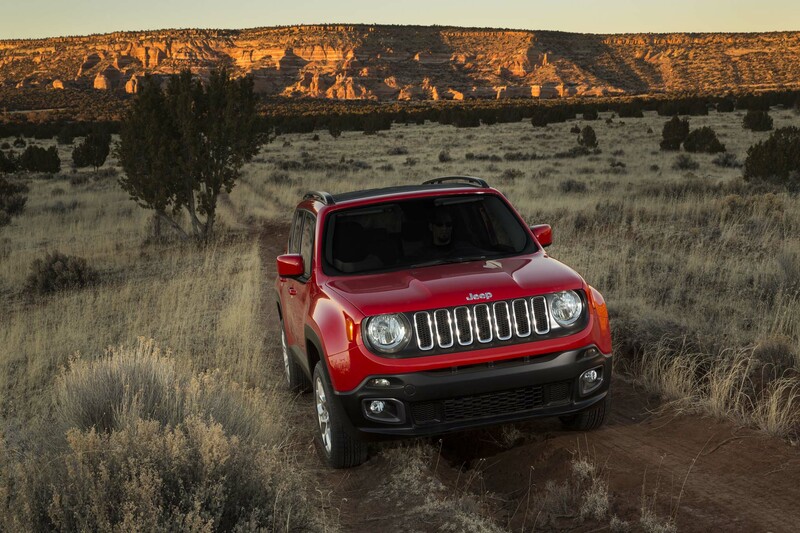 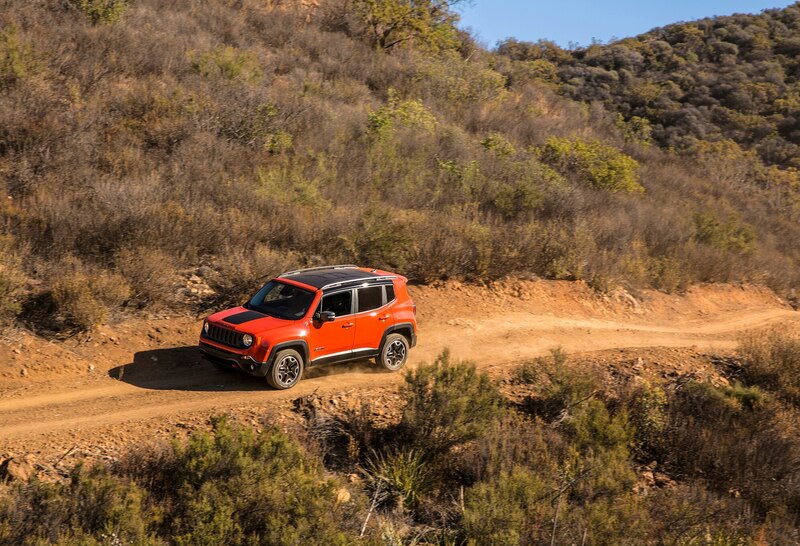 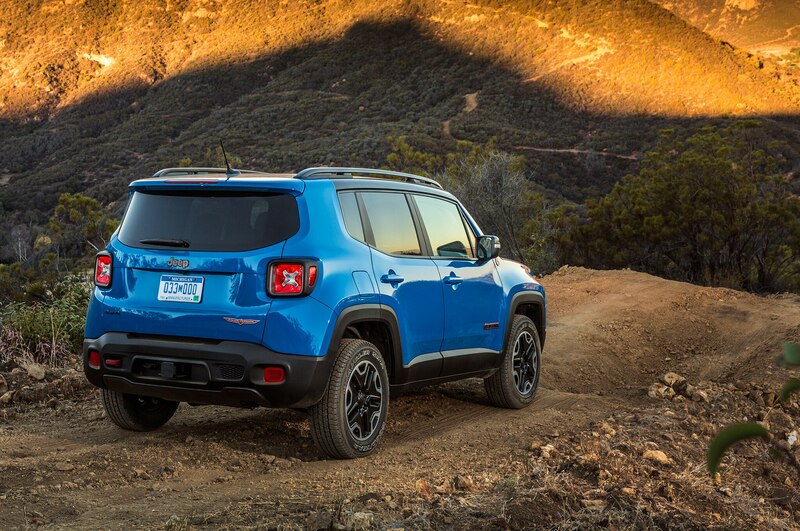 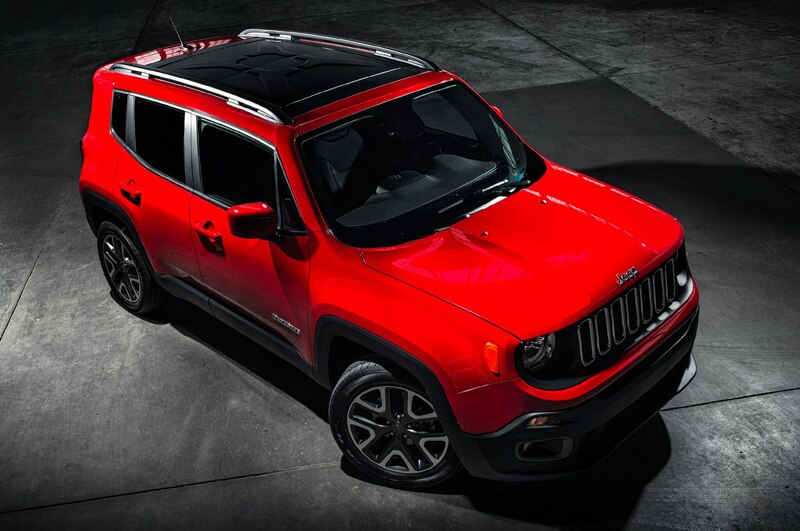 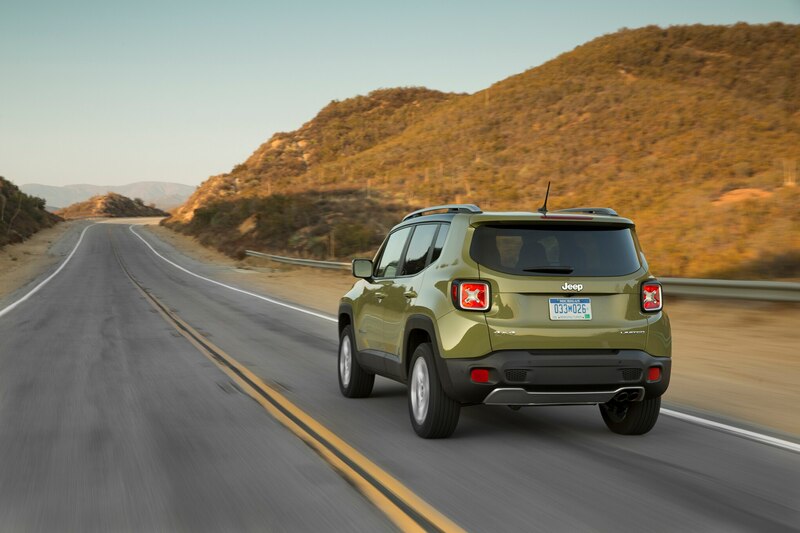 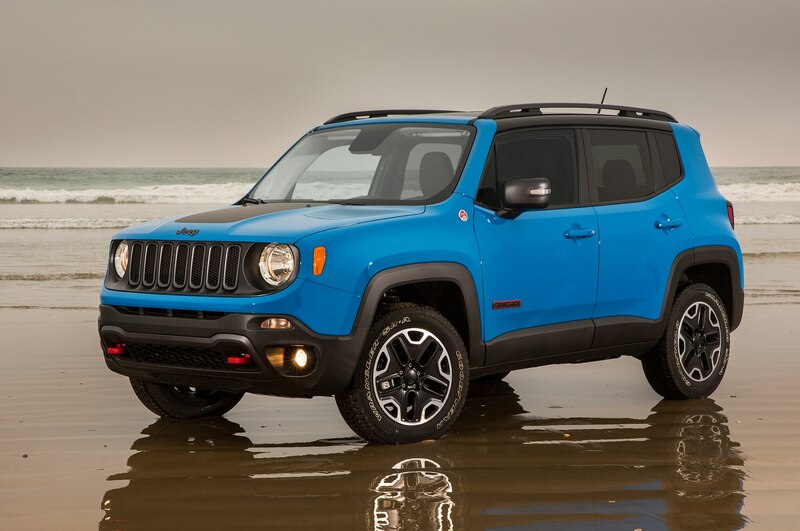 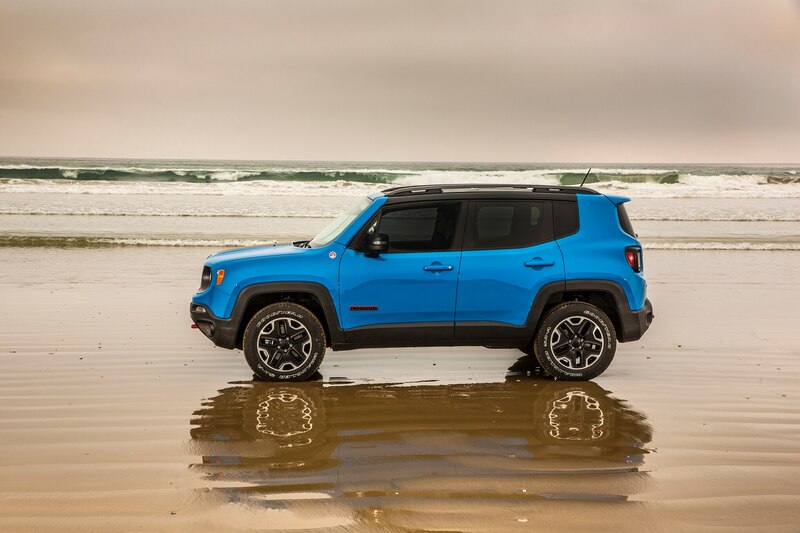 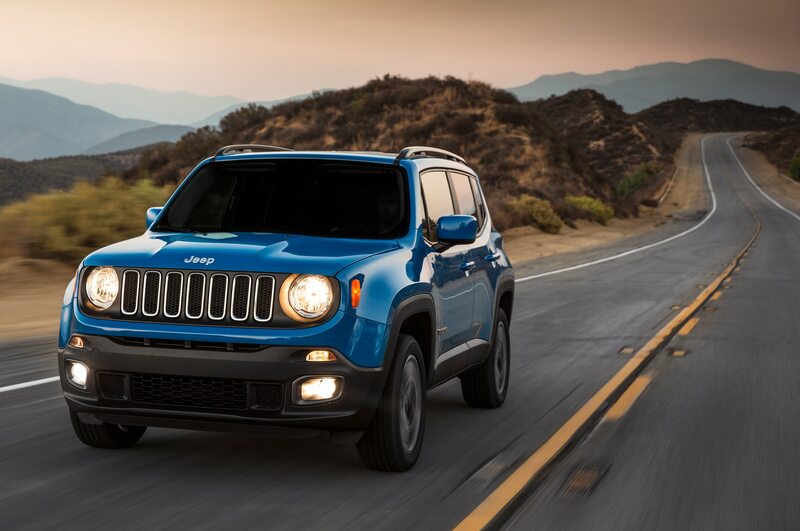 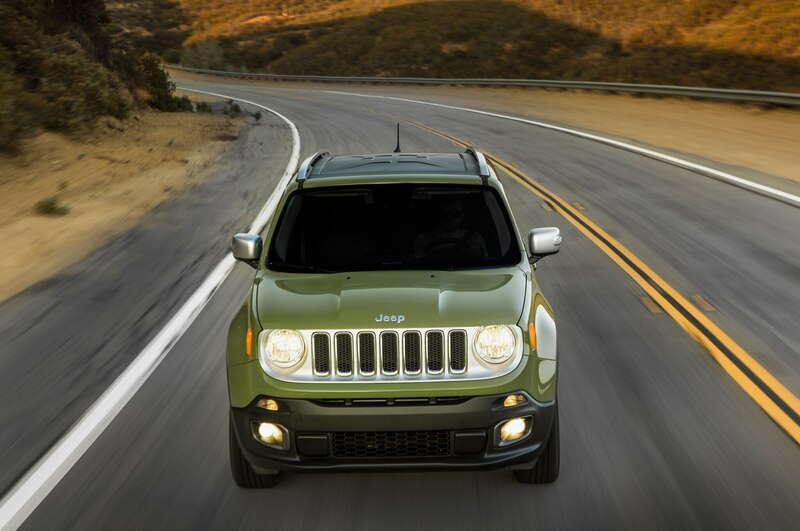 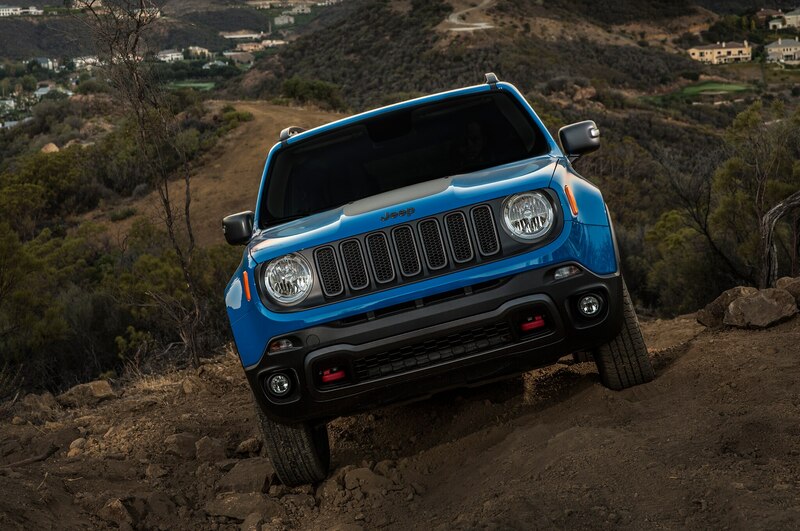 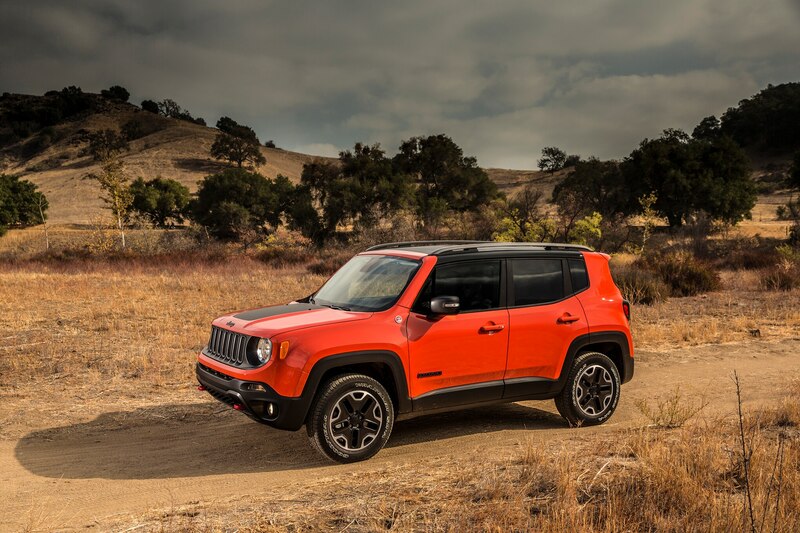 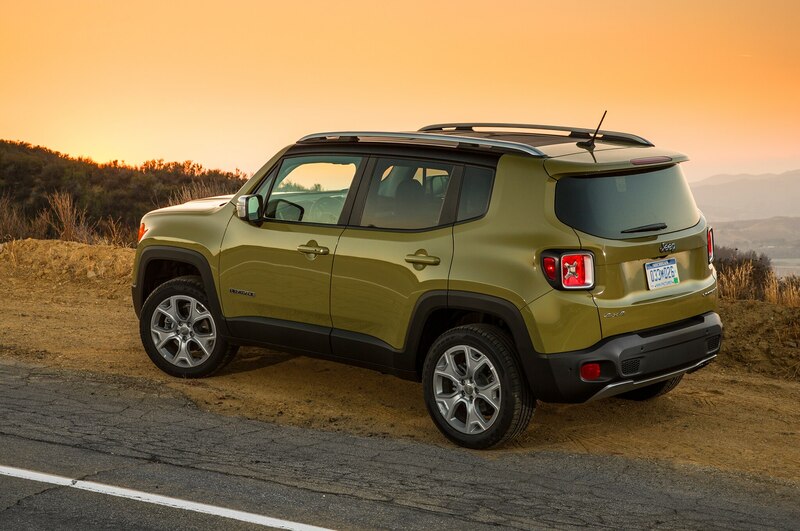 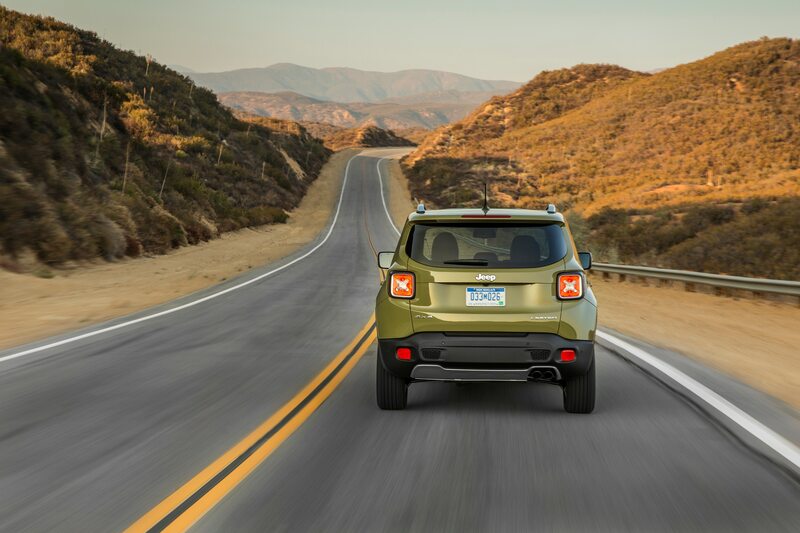 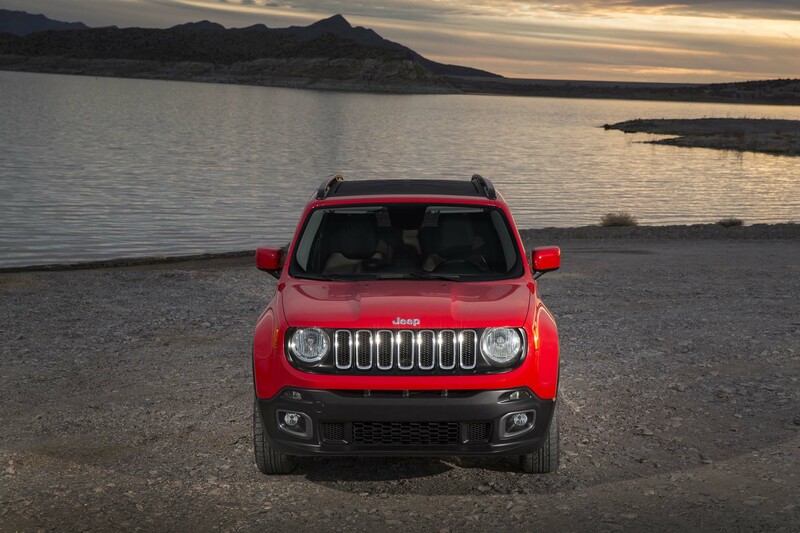 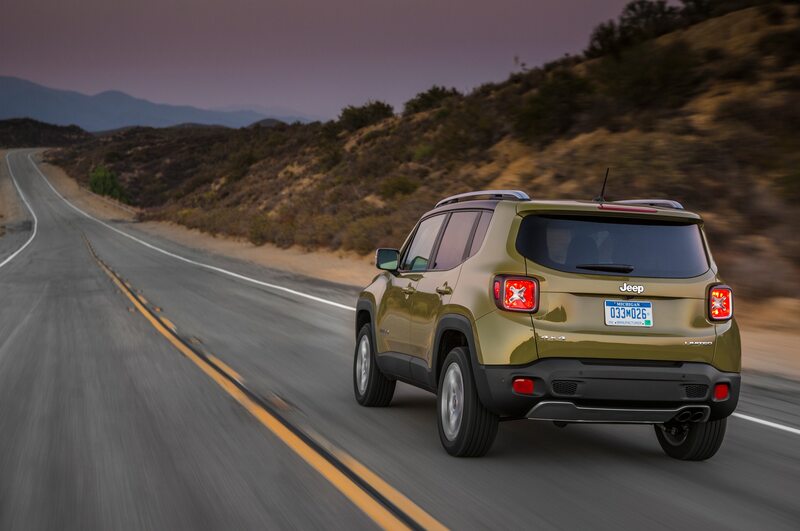 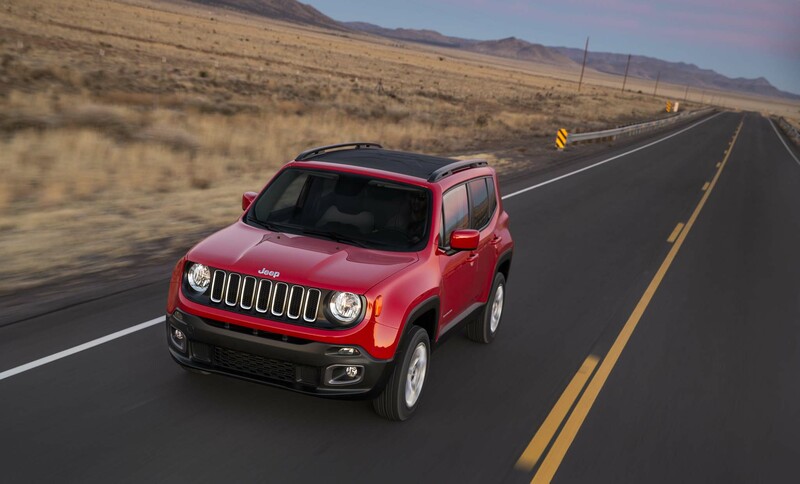 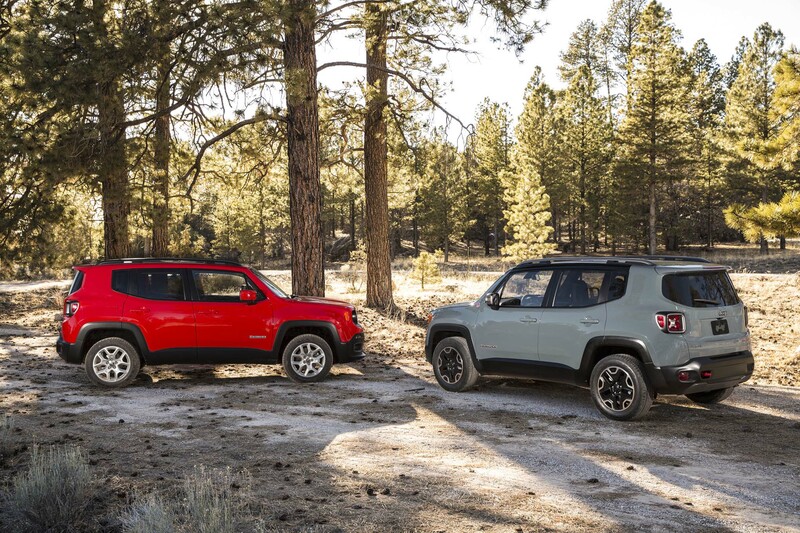 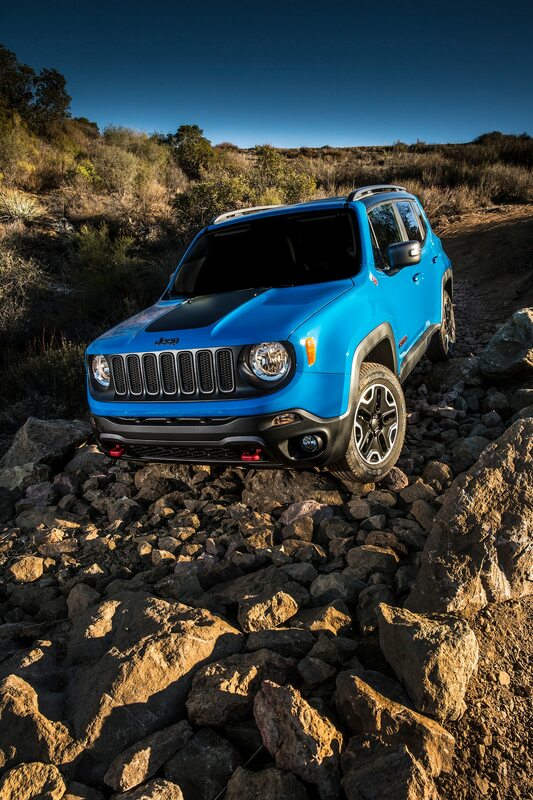 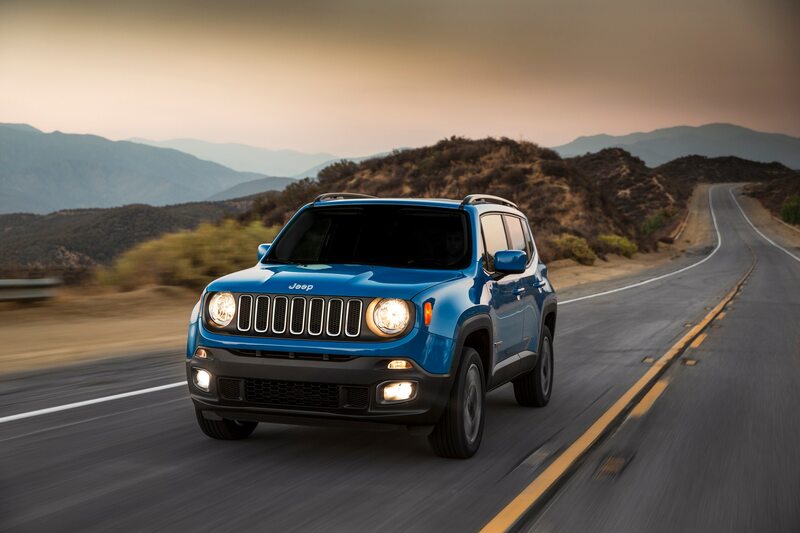 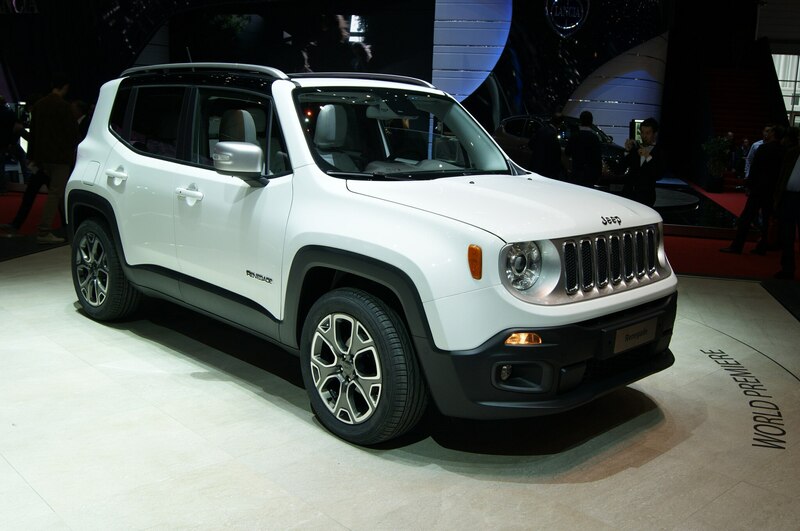 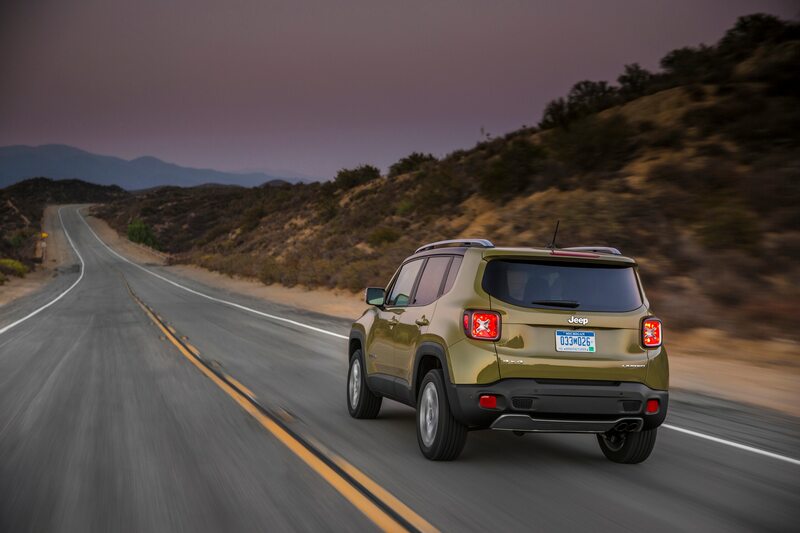 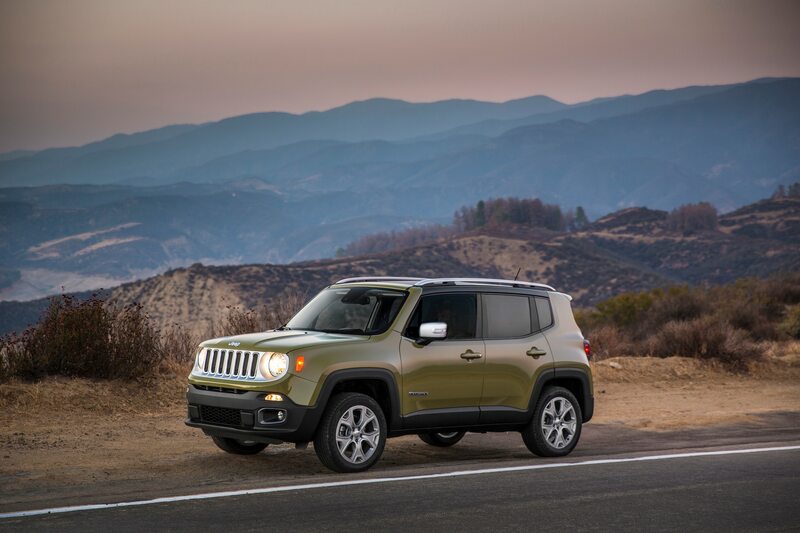 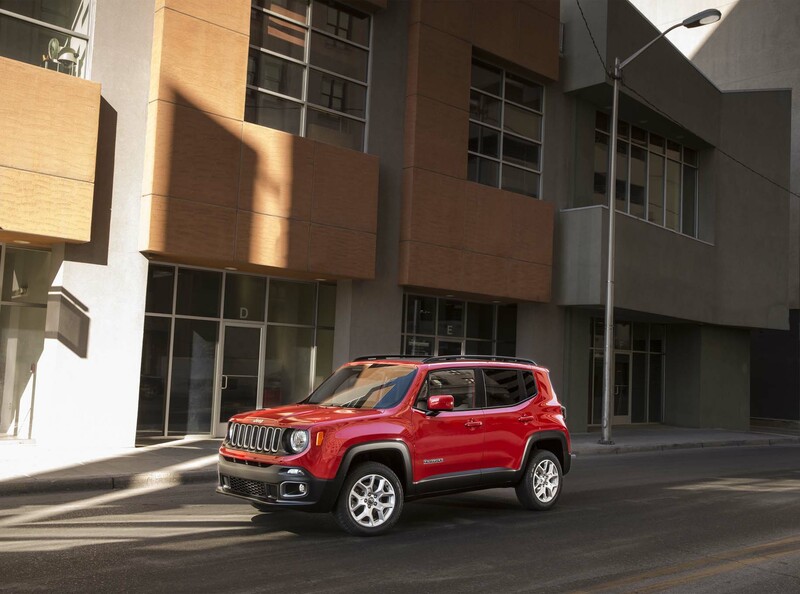 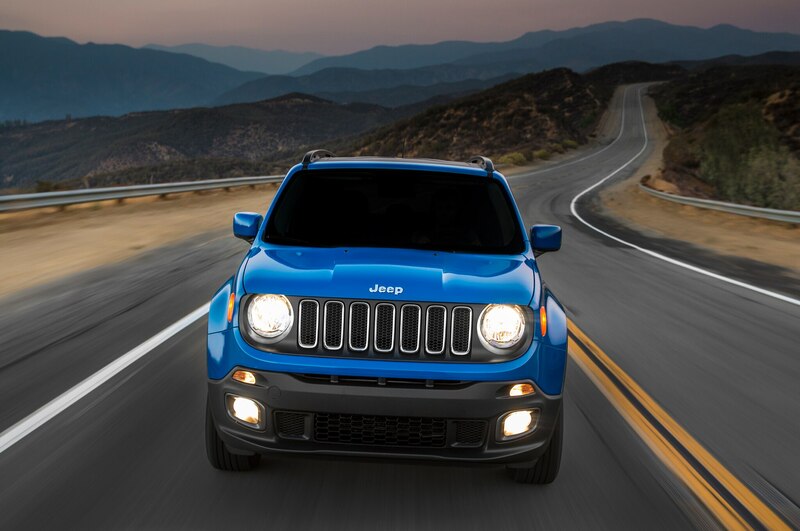 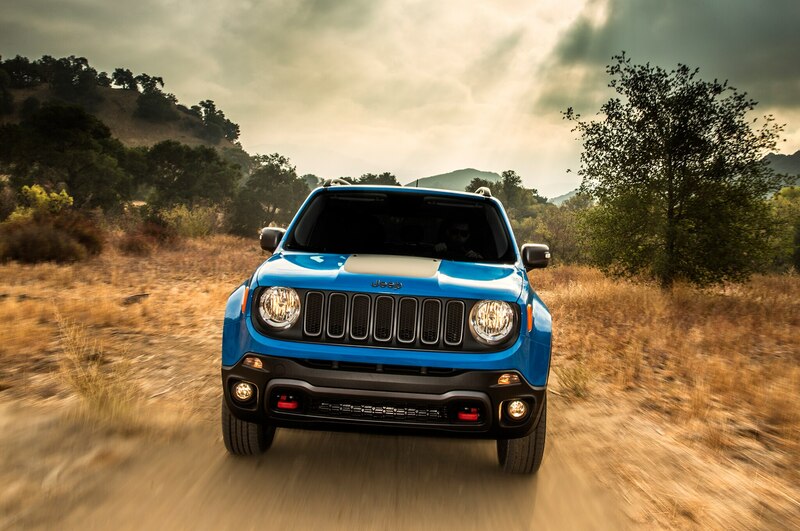 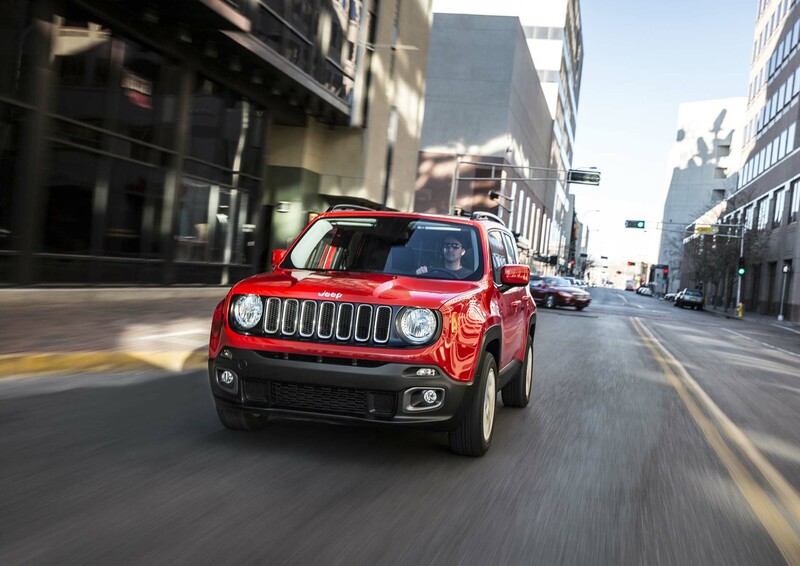 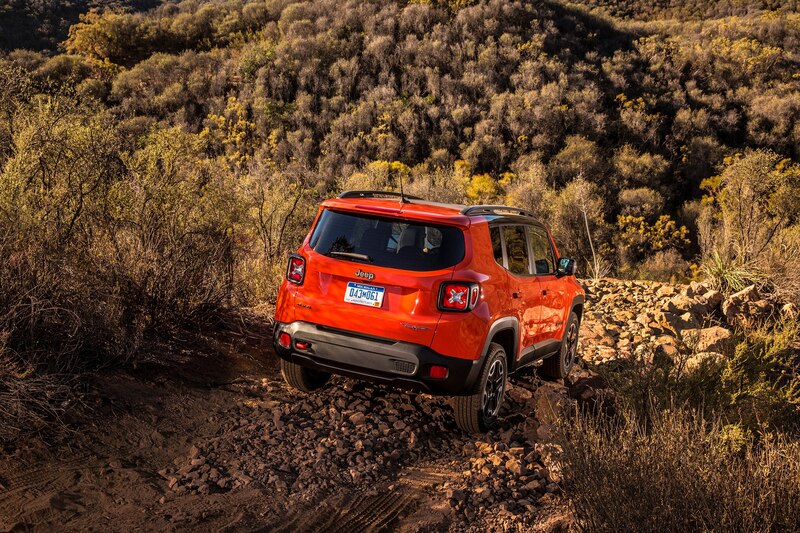 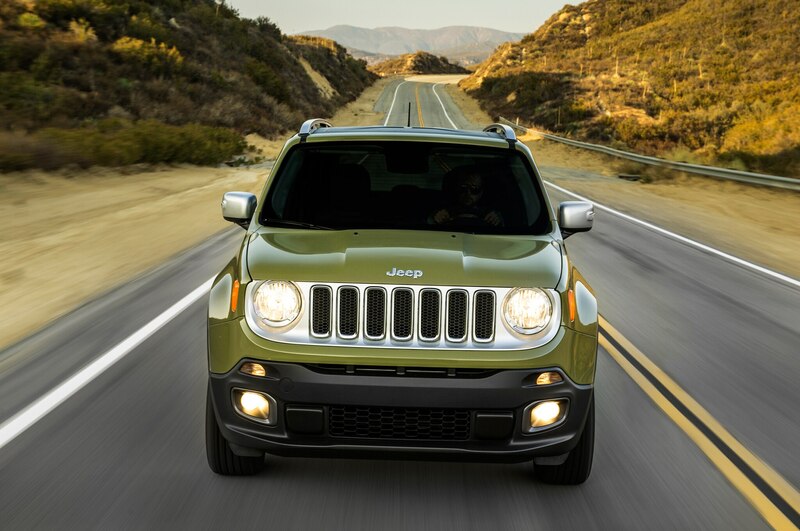 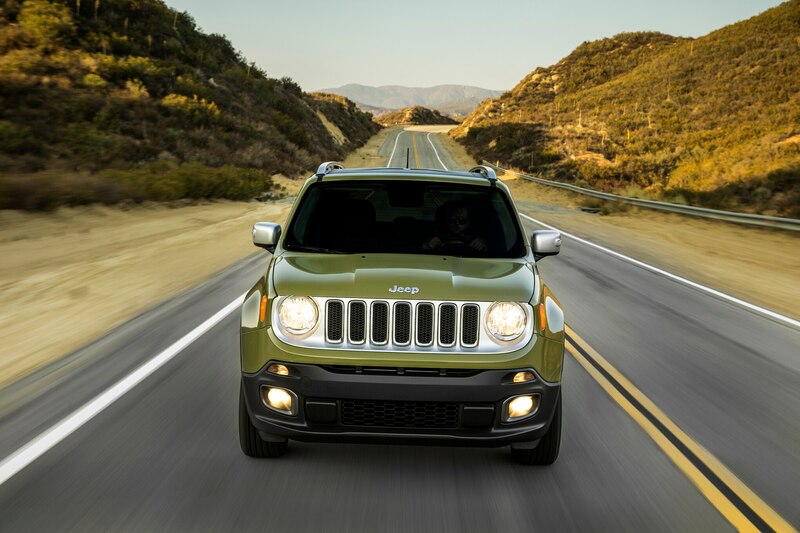 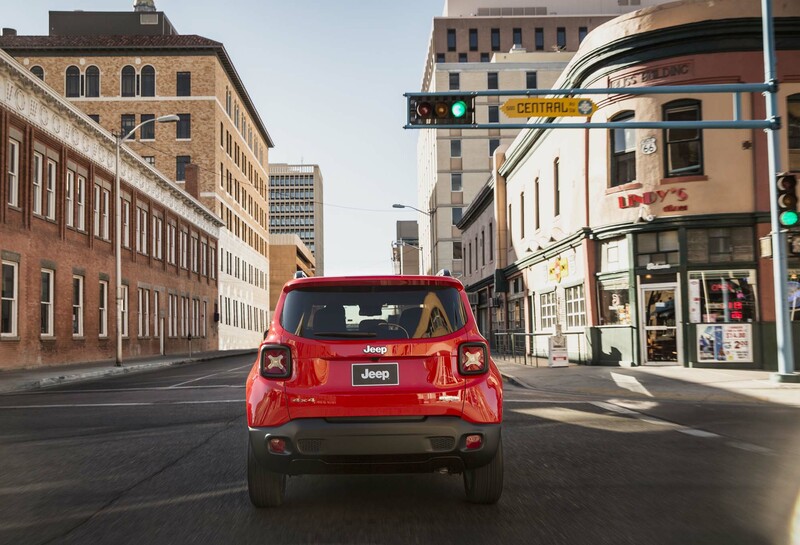 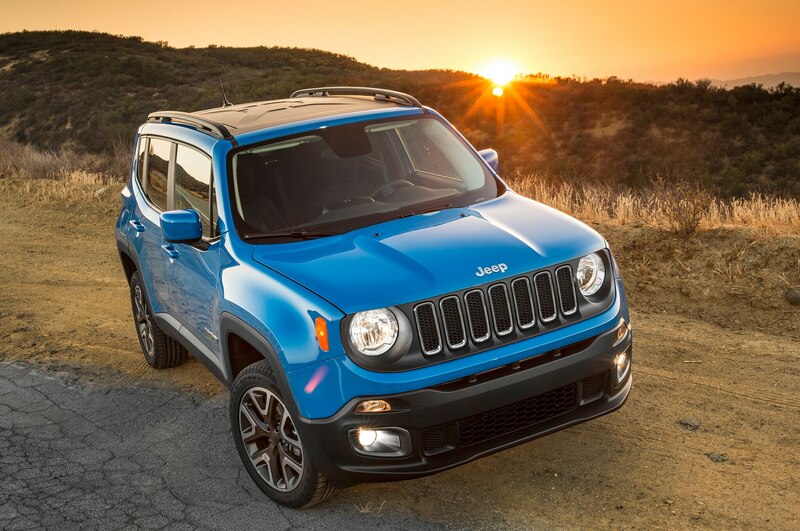 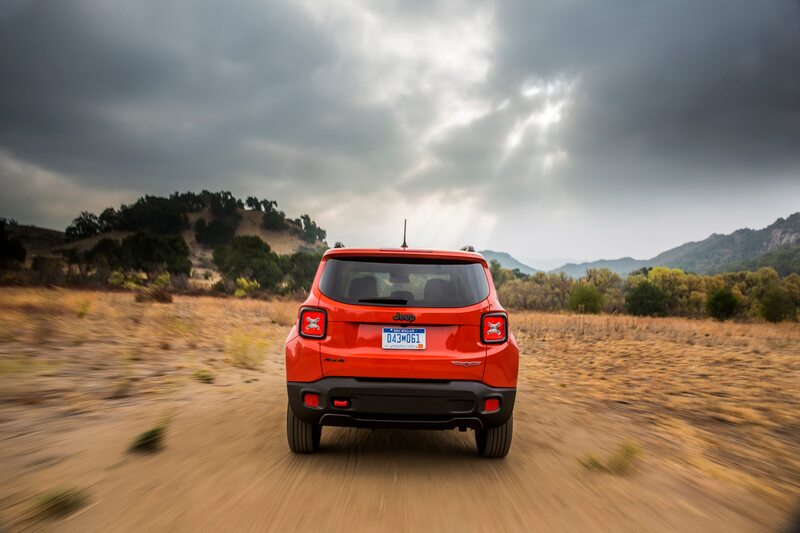 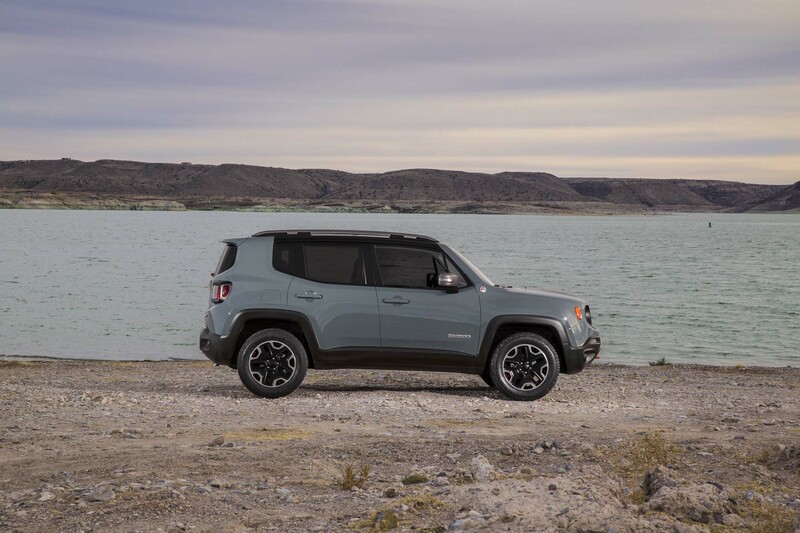 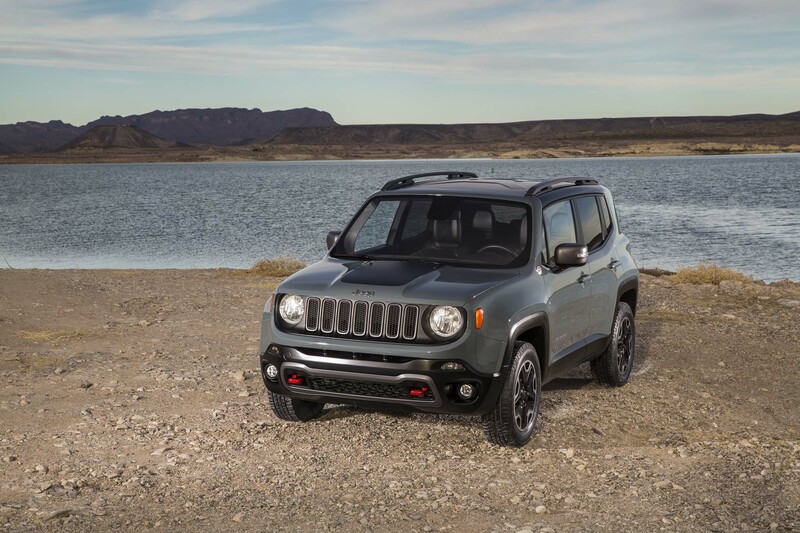 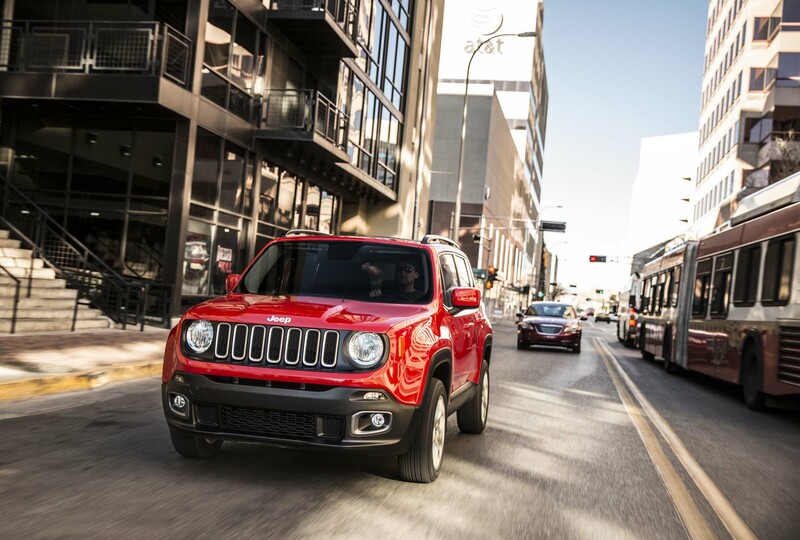 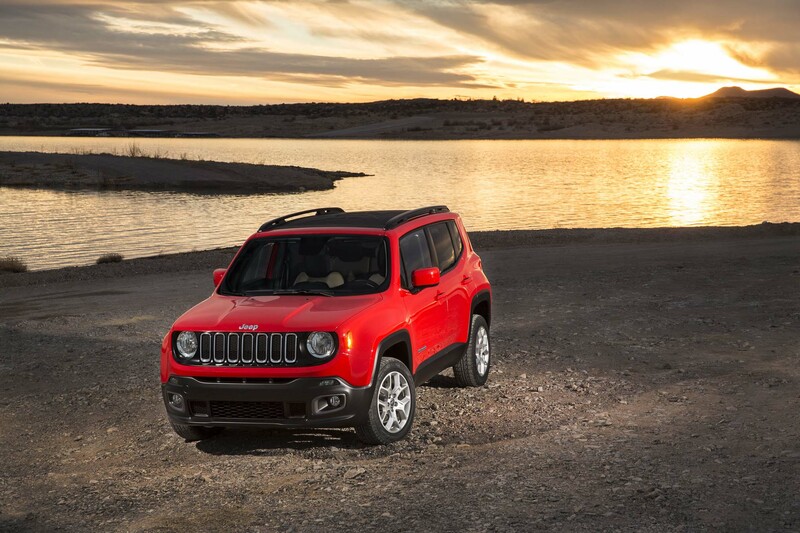 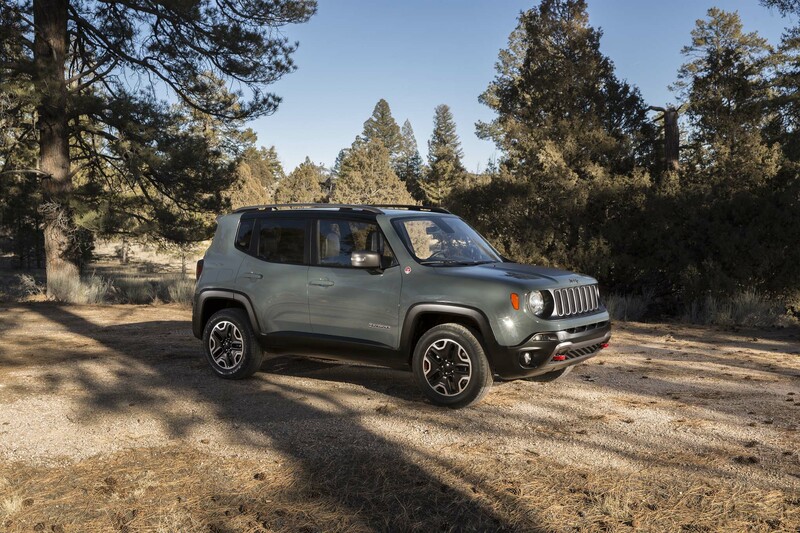 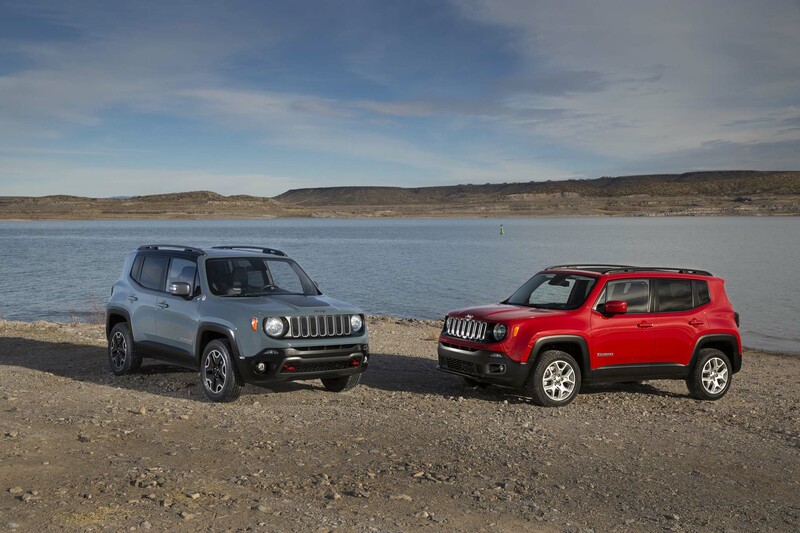 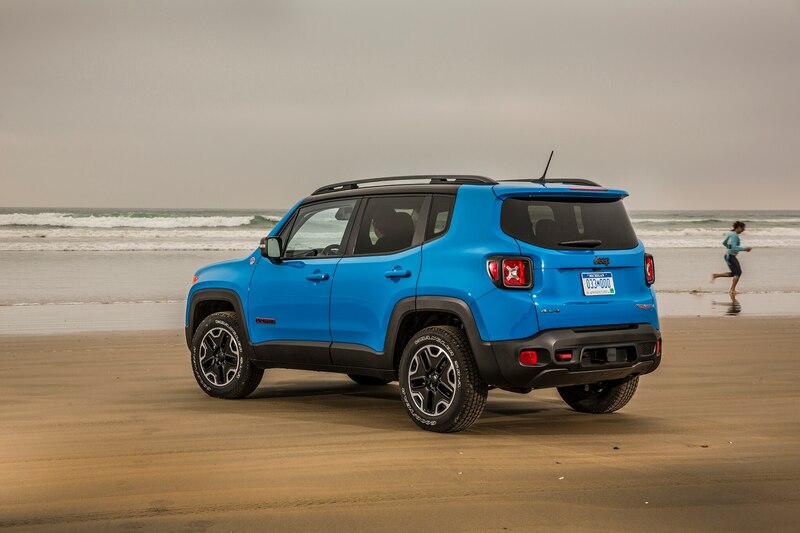 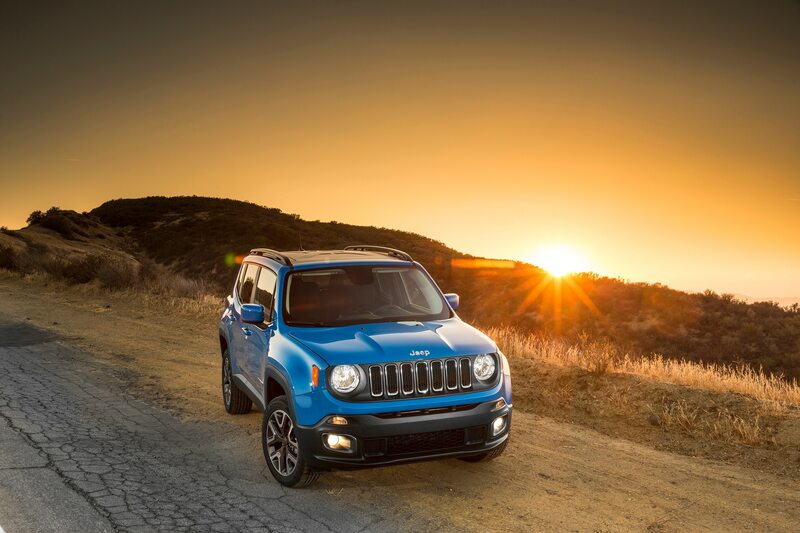 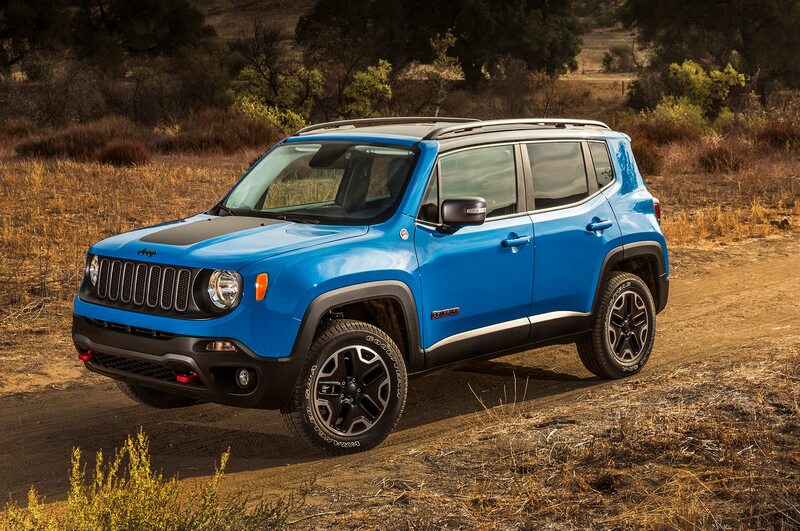 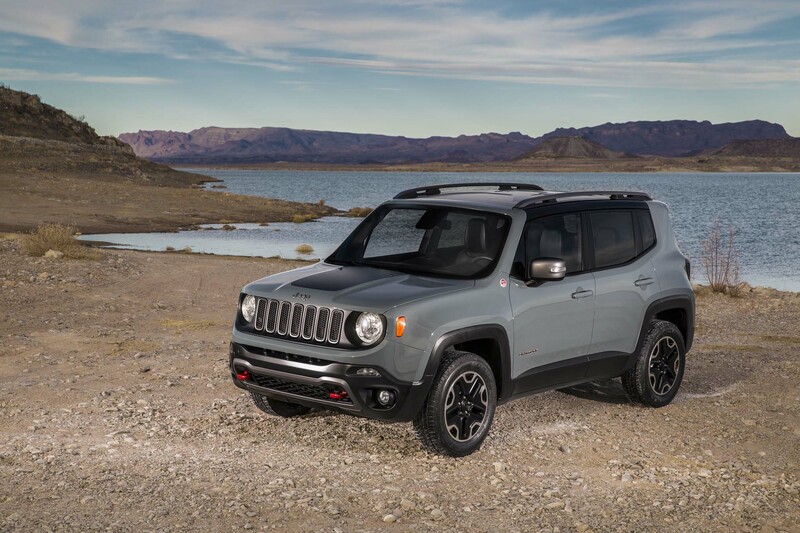 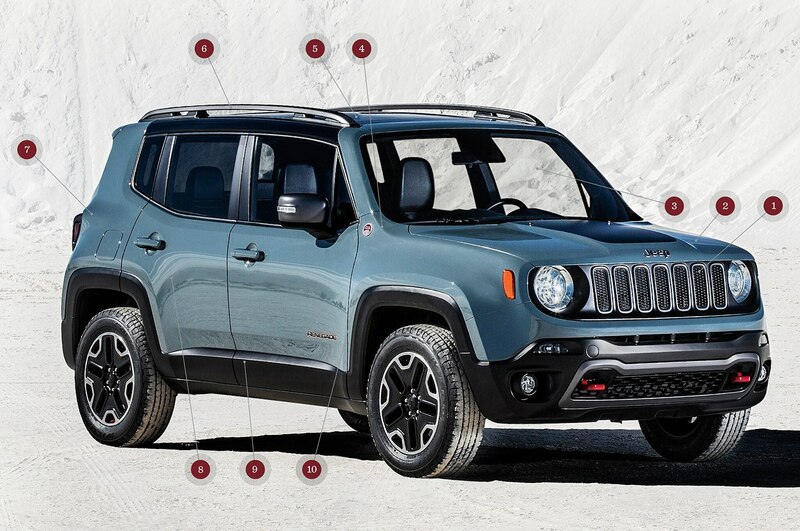 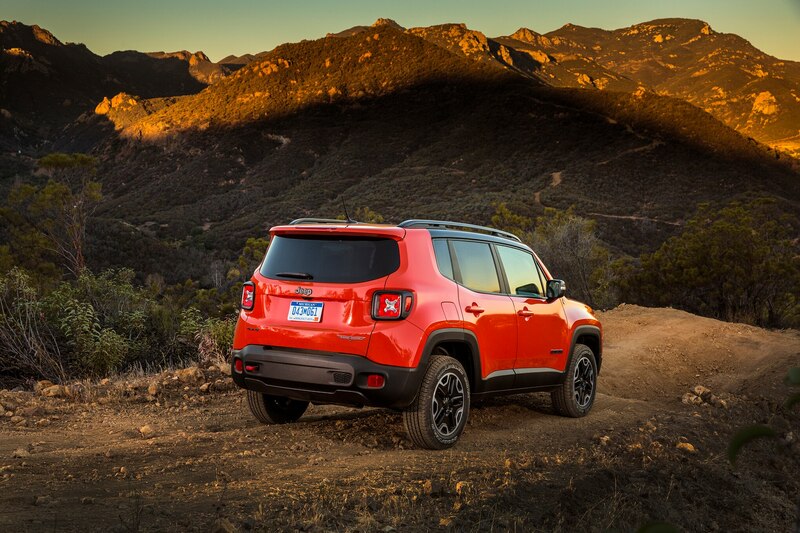 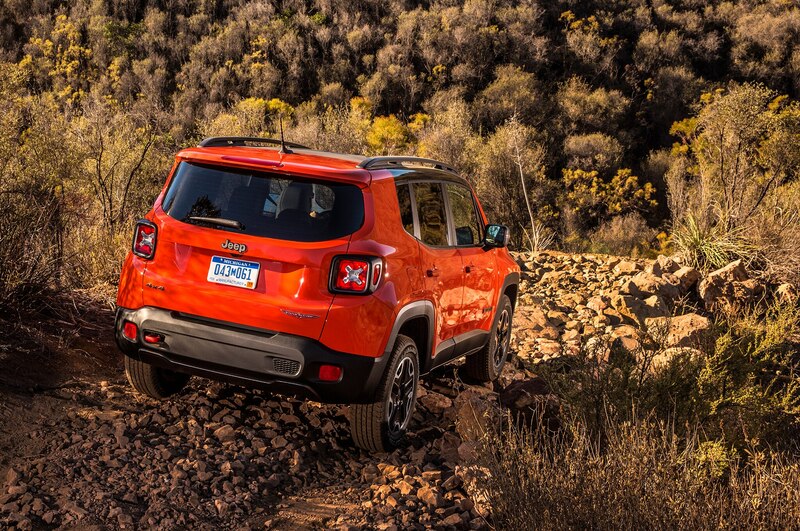 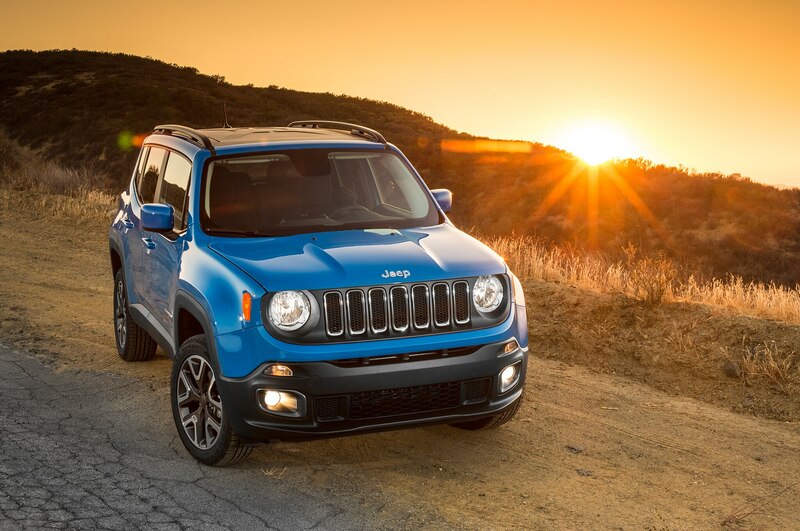 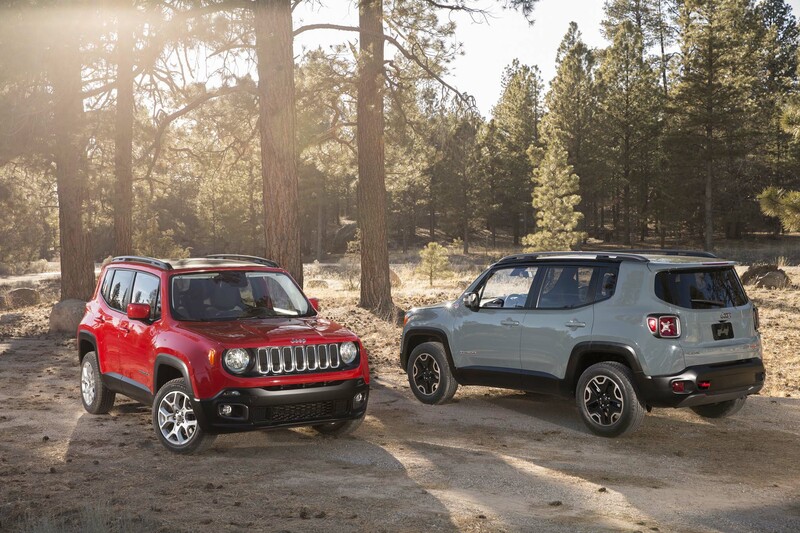 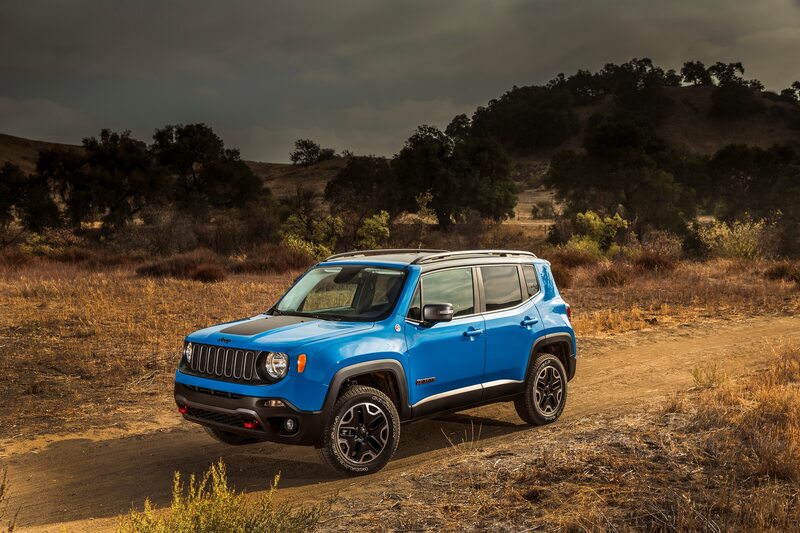 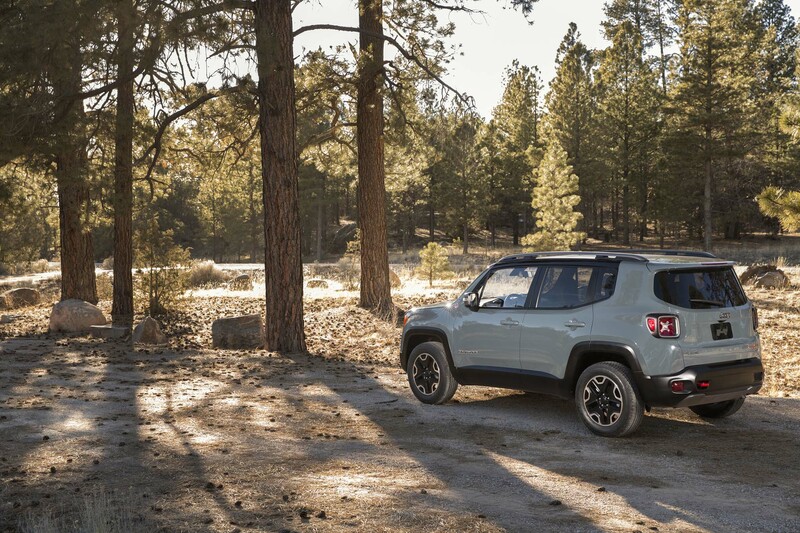 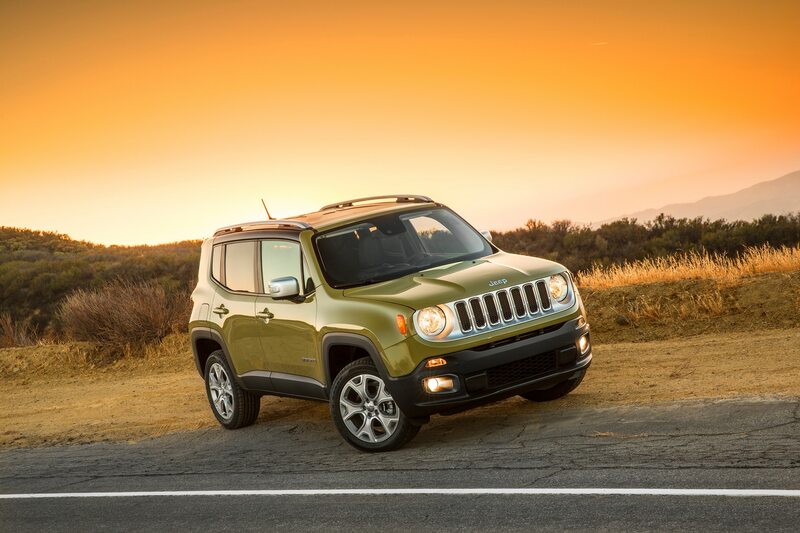 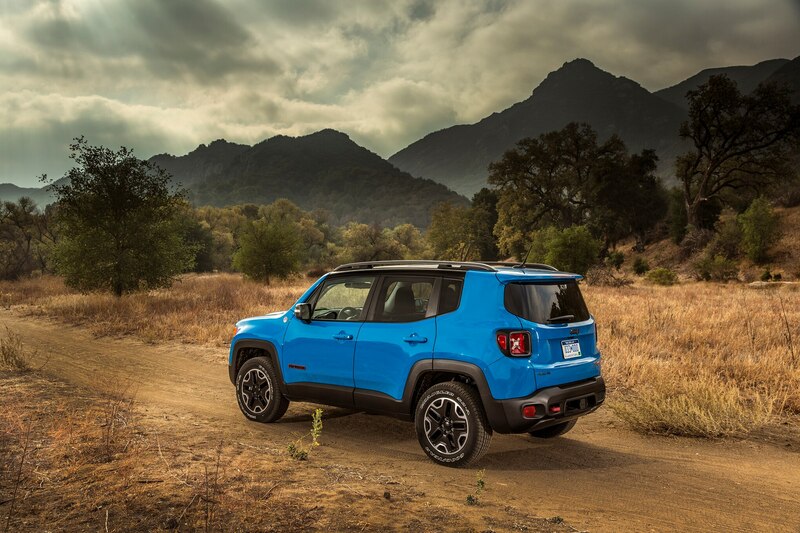 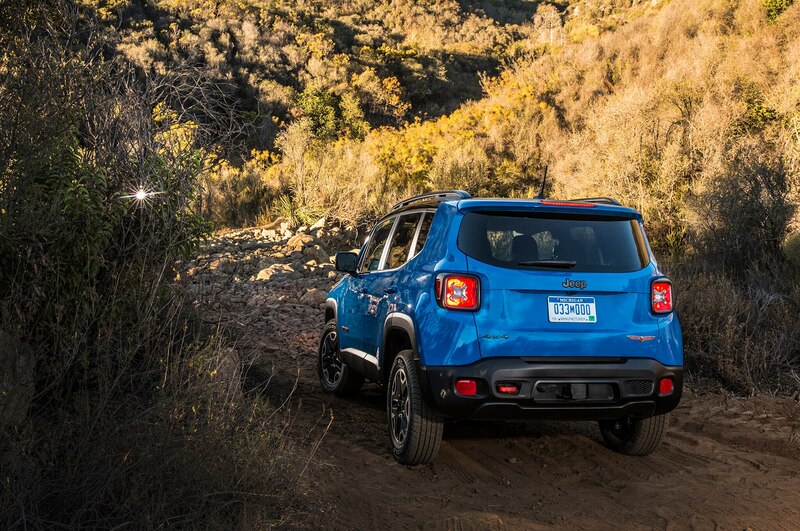 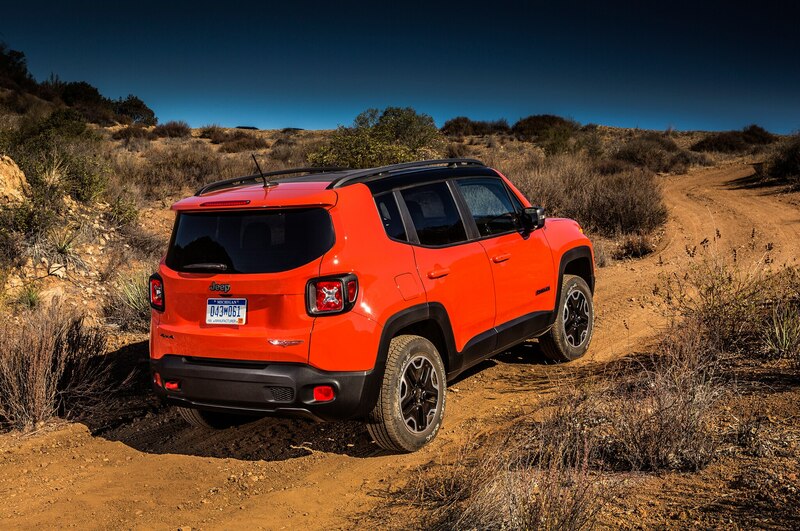 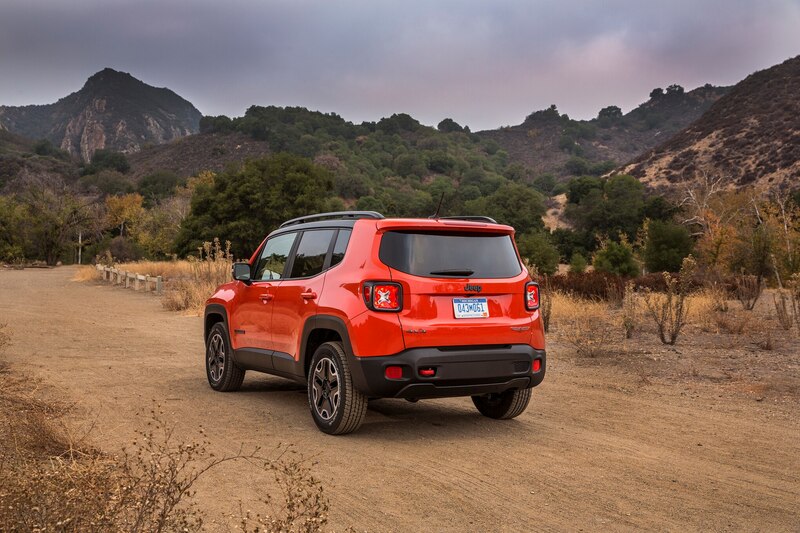 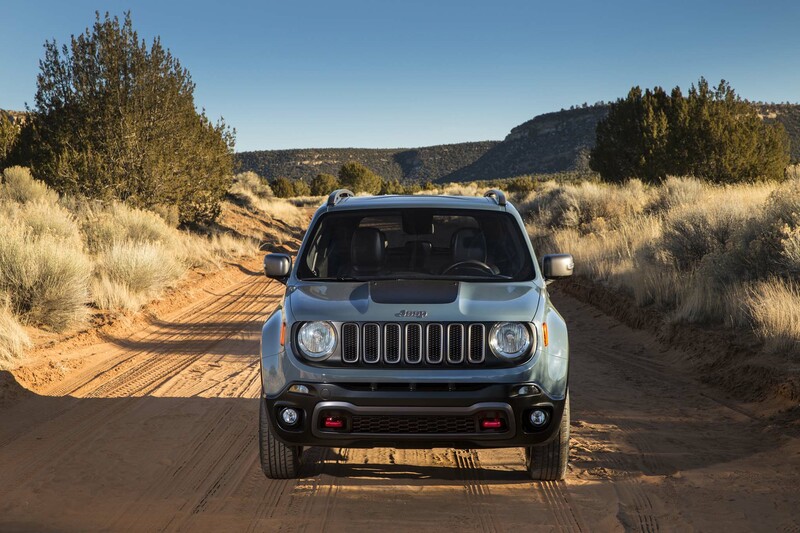 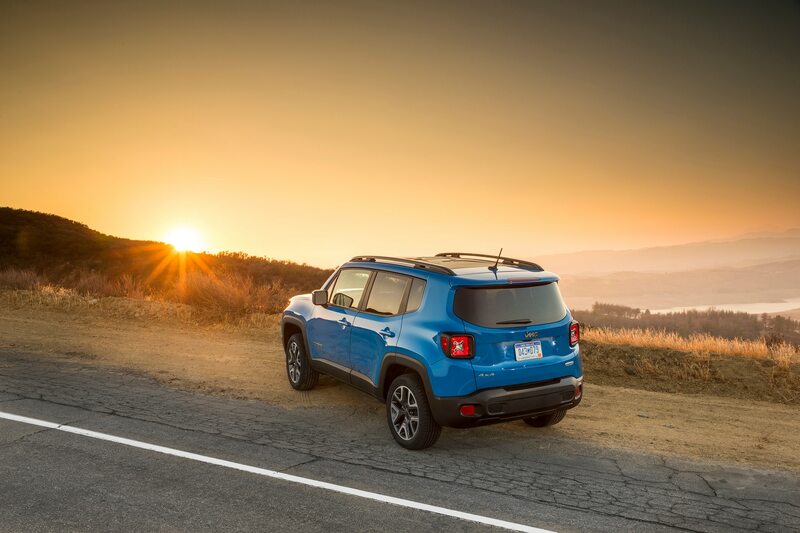 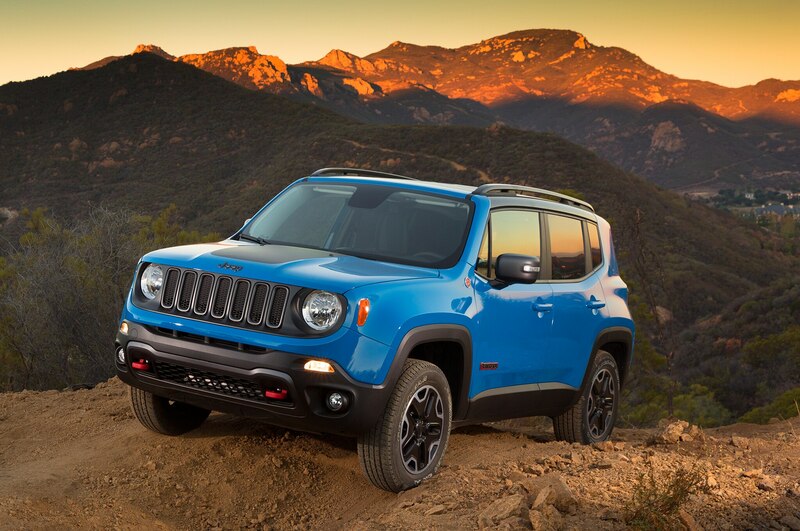 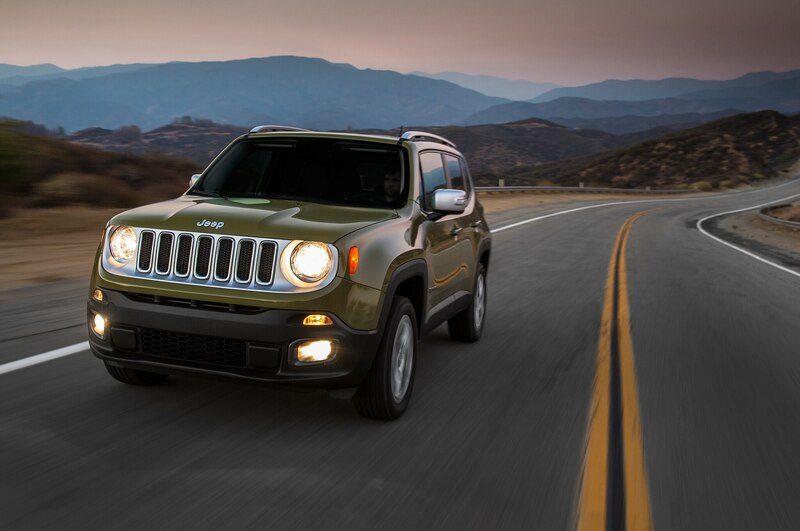 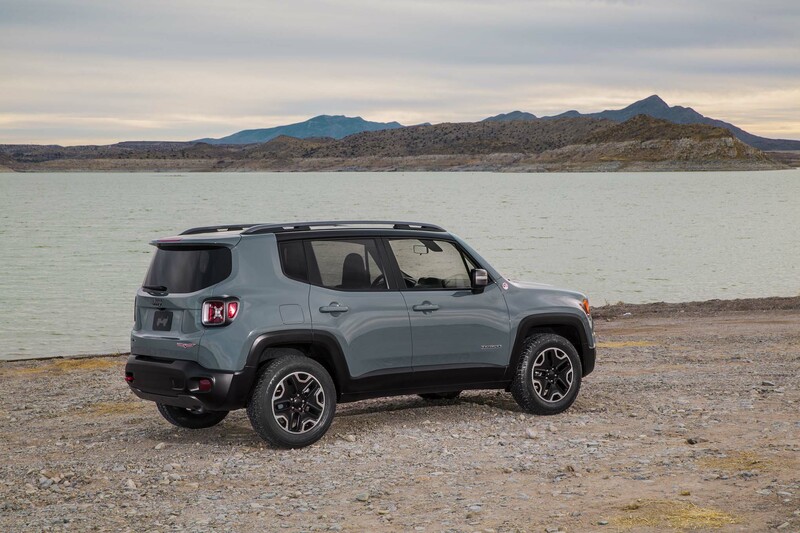 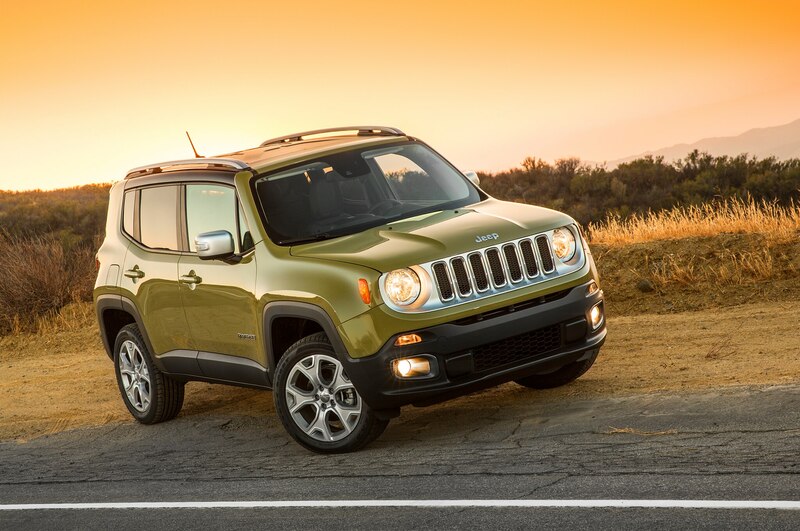 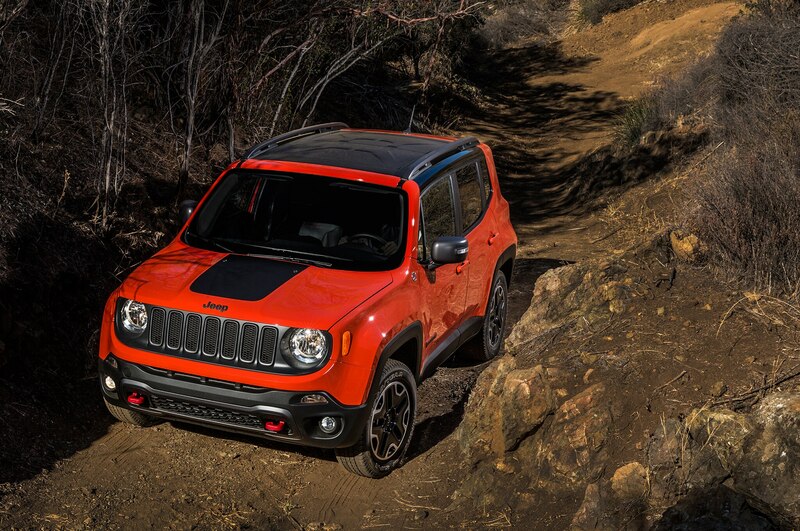 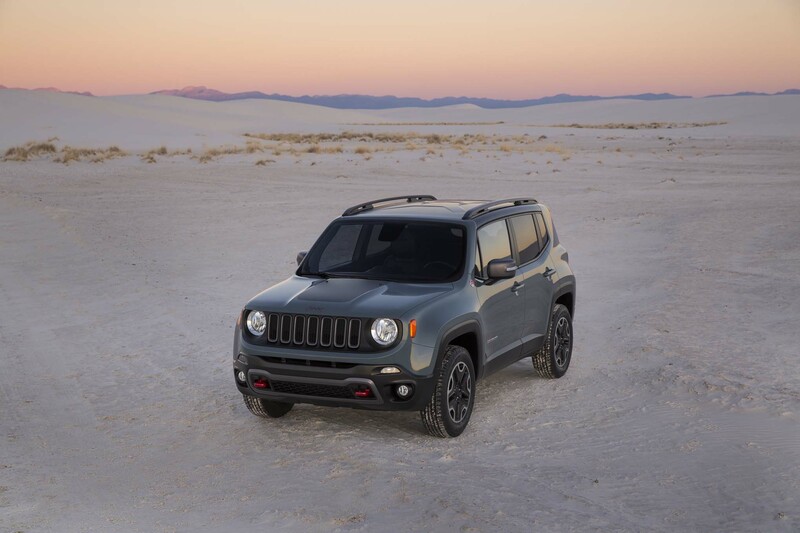 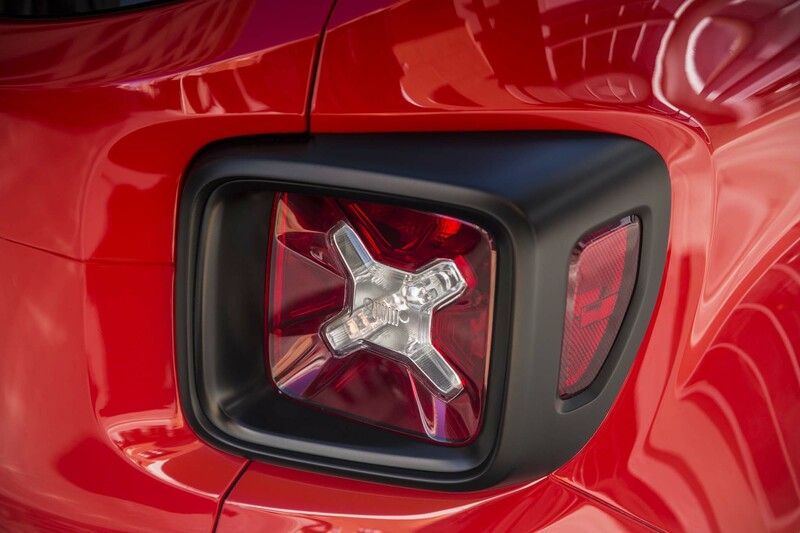 The Renegade also capitalizes on Americans’ growing interest in the subcompact sport/utility segment as it positions the brand to meet stringent 2016 and ’25 Corporate Average Fuel Economy standards. 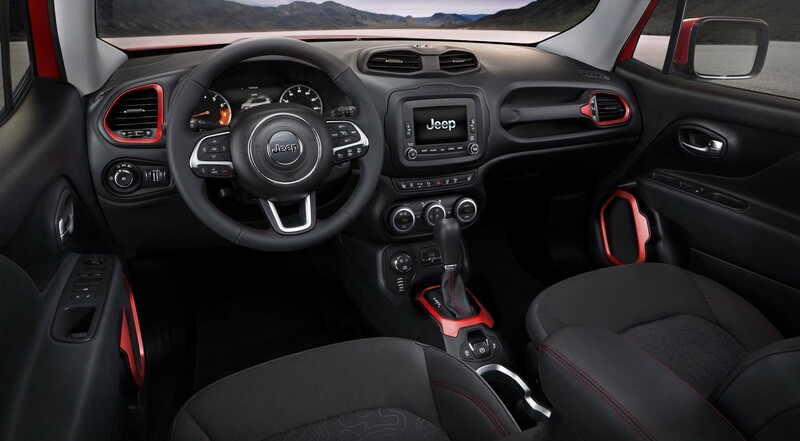 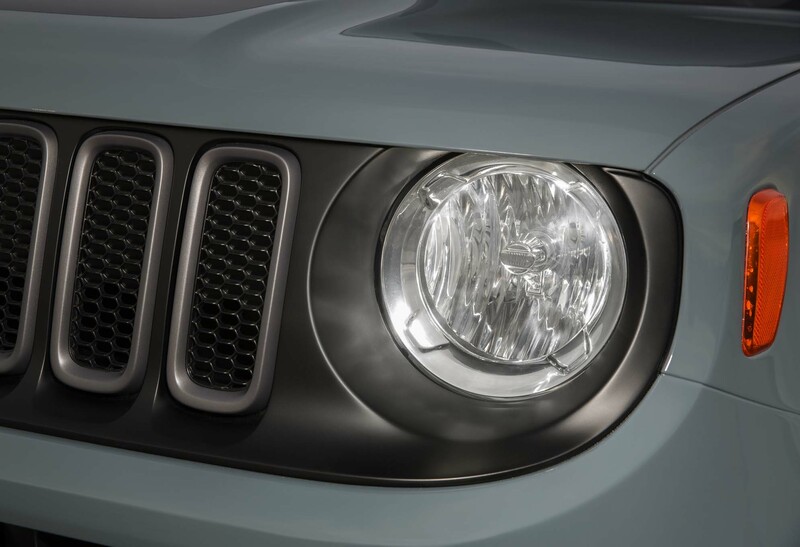 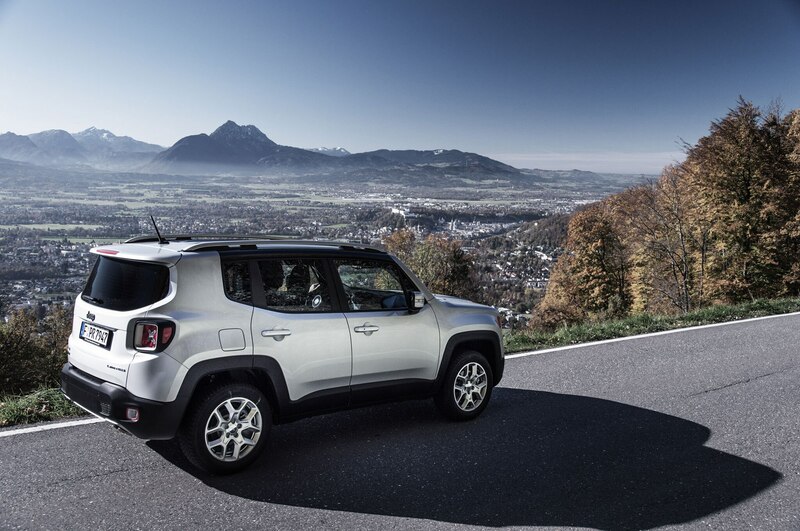 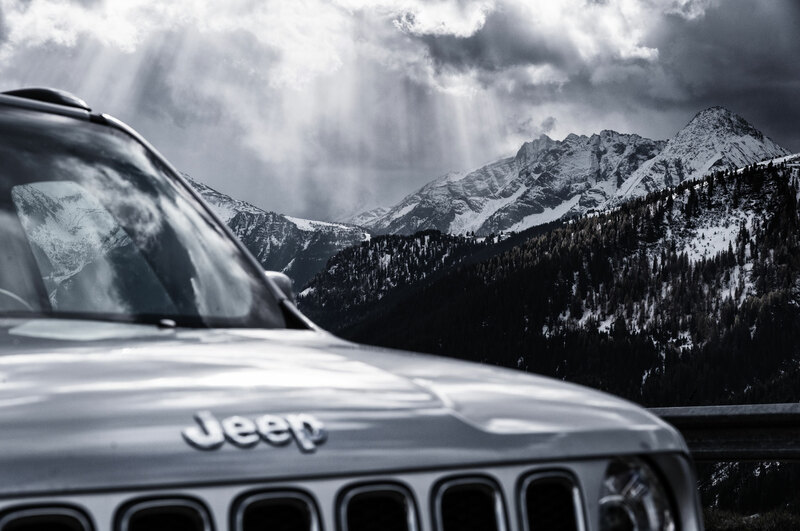 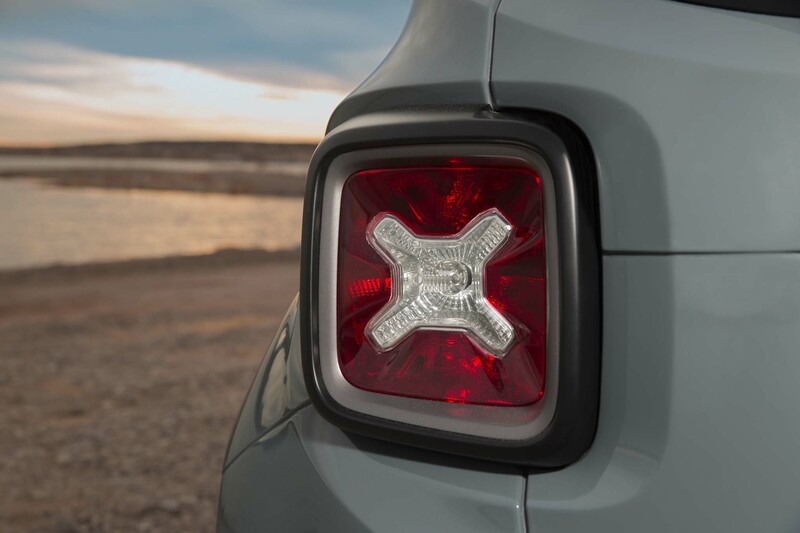 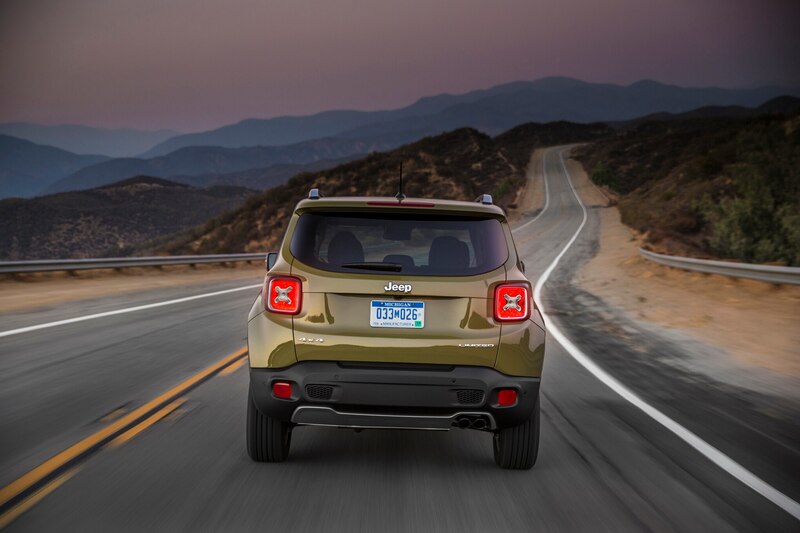 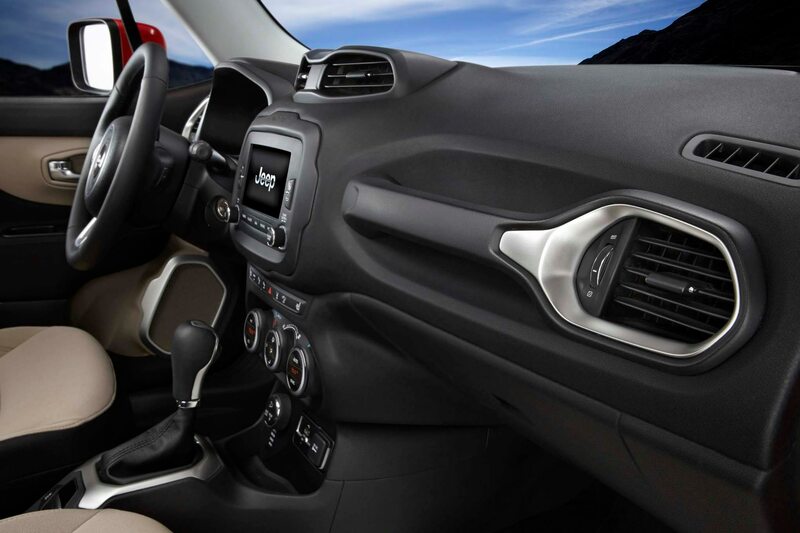 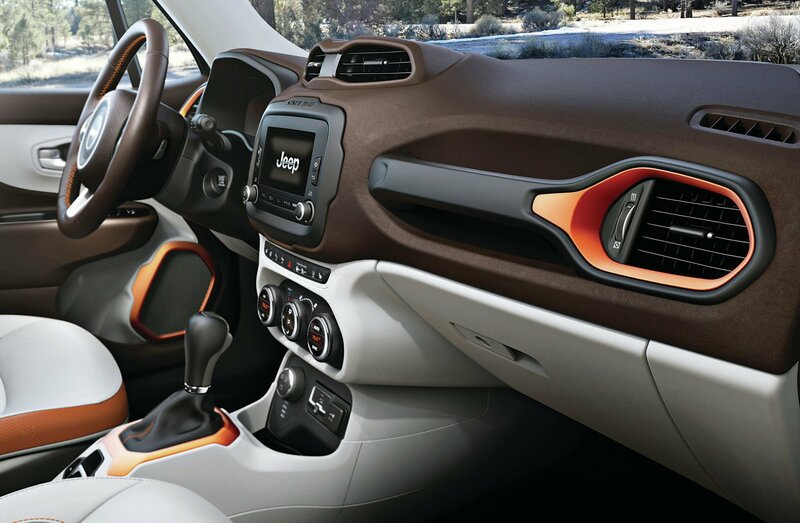 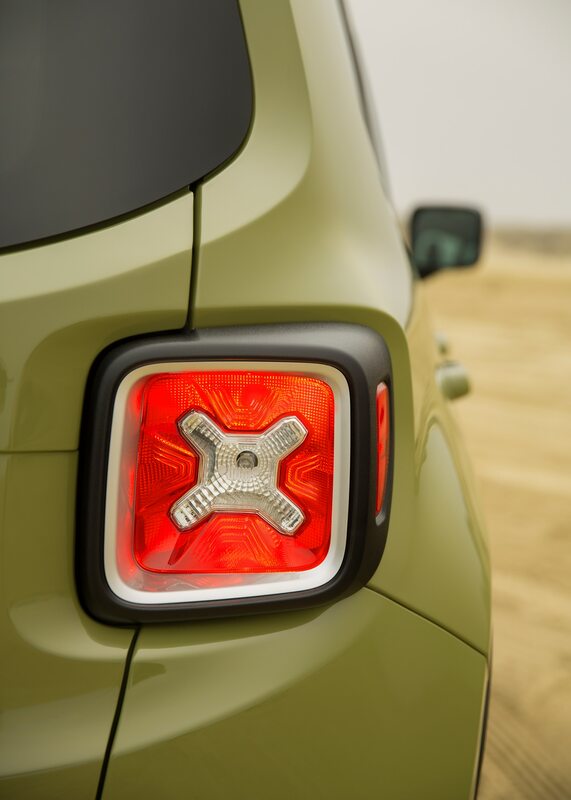 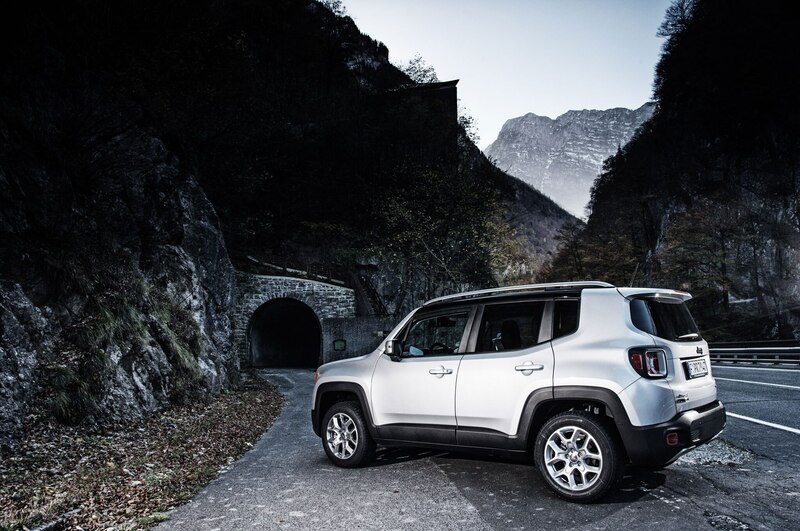 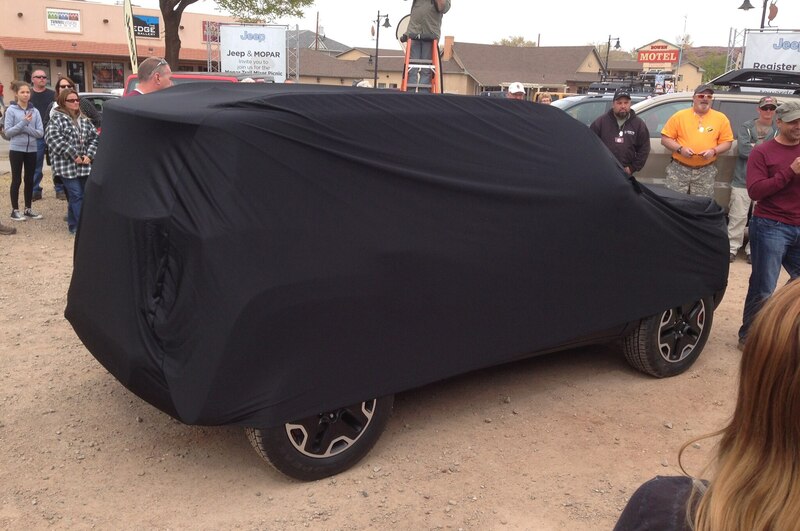 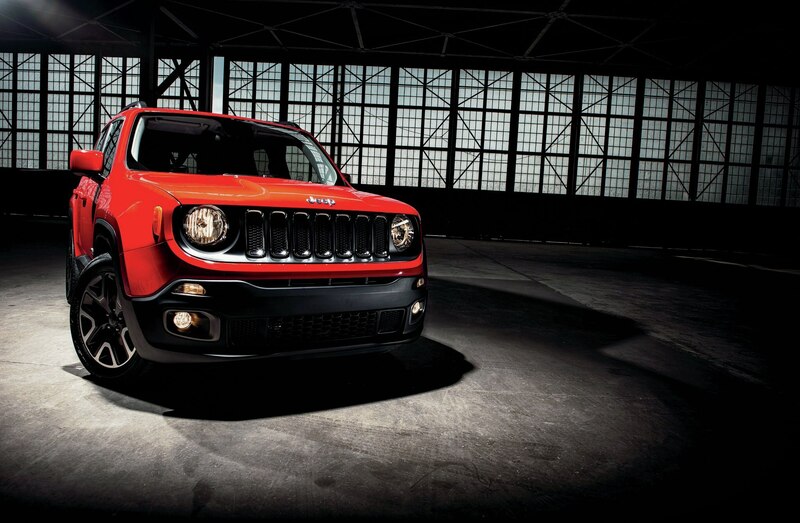 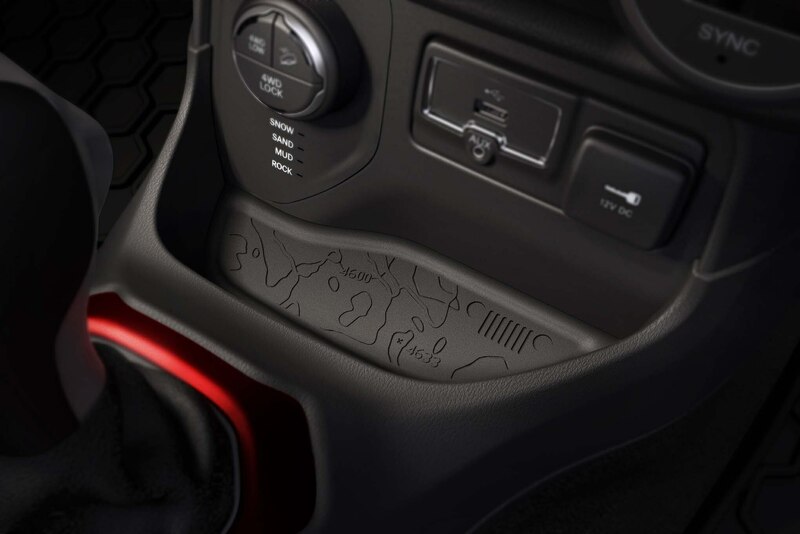 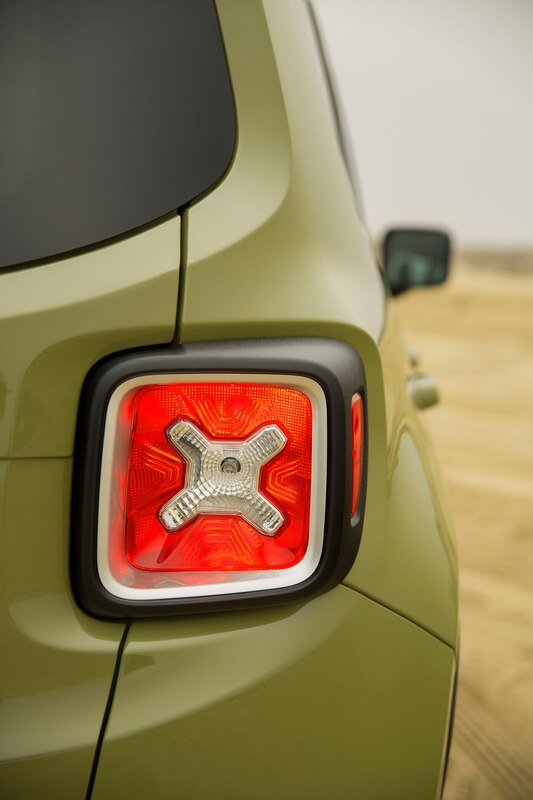 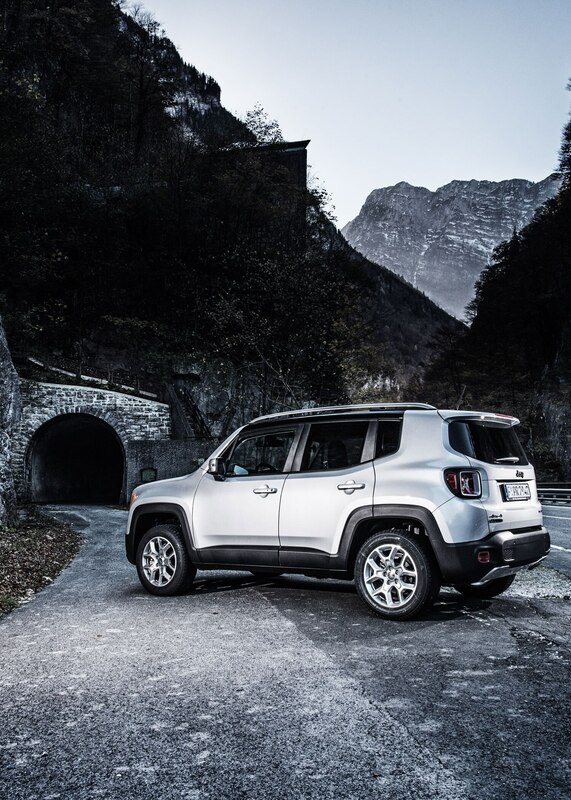 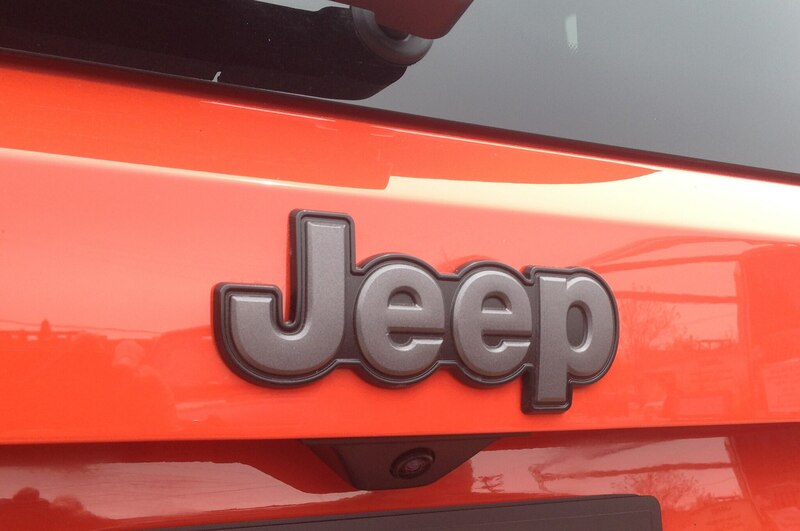 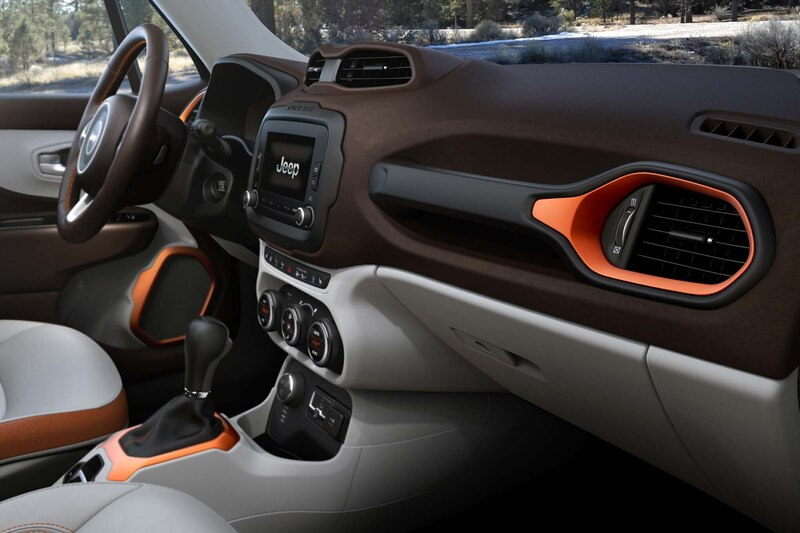 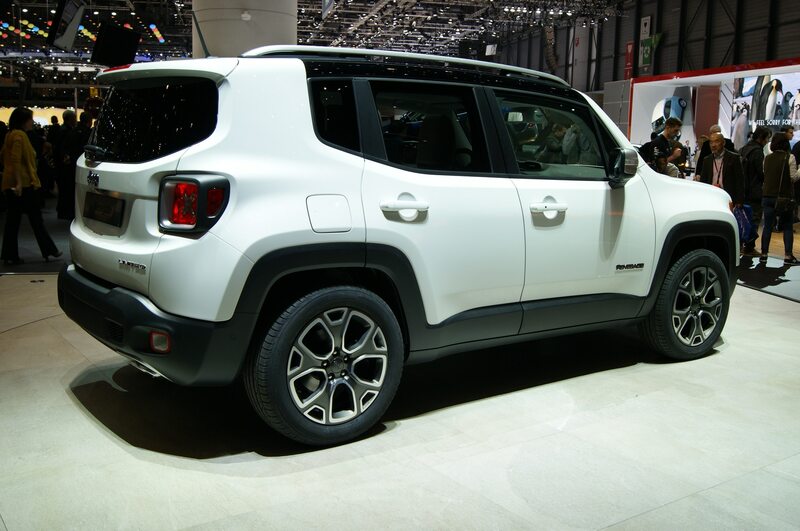 The 2015 Jeep Renegade will be built in Melfi, Italy, on the “all-new” Fiat-based platform that Jeep calls the “small-wide 4×4” architecture. 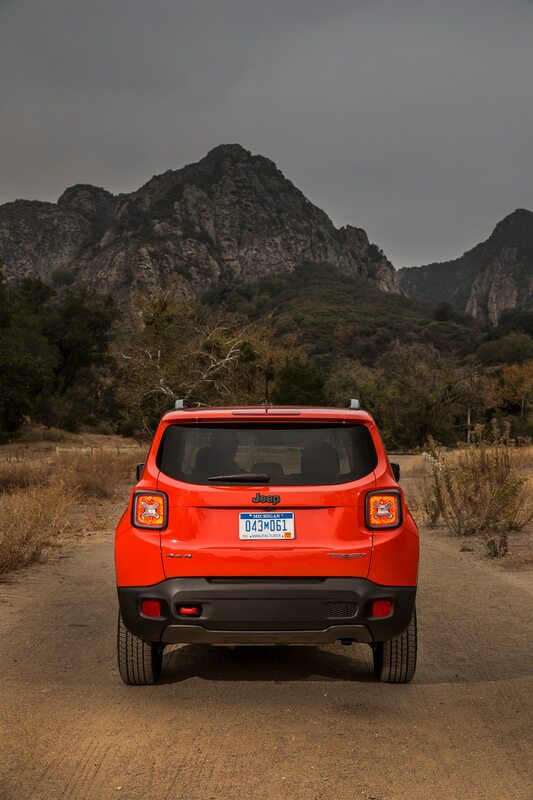 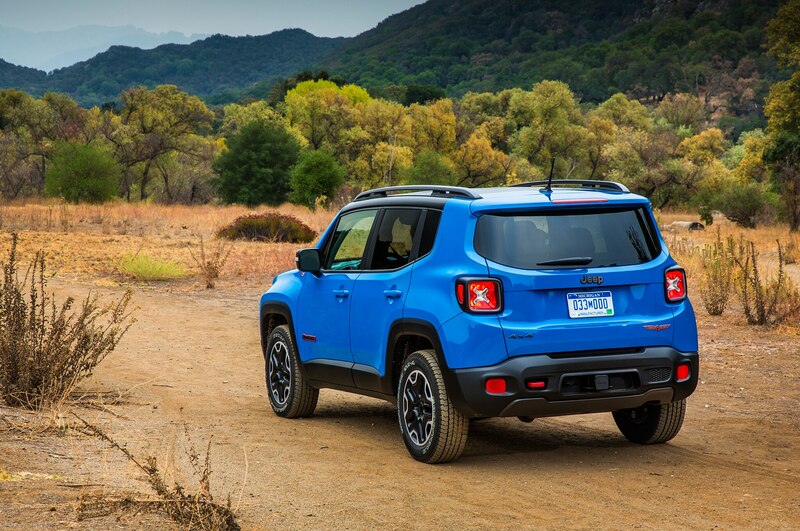 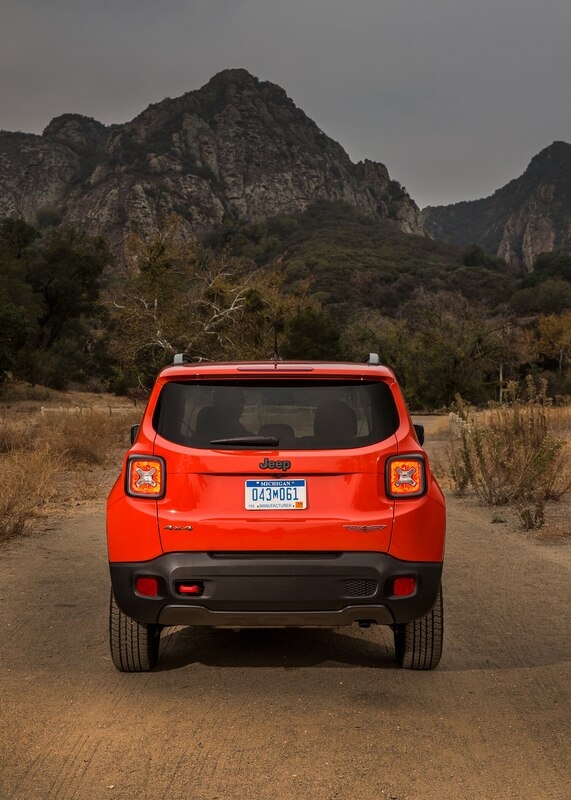 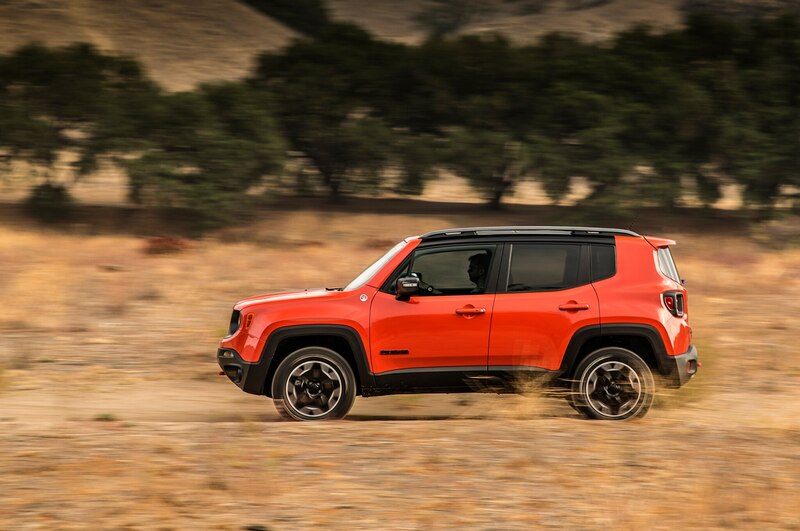 The Renegade is cute, and yet it looks off-roadable enough to possibly avoid the “female car” epithet. 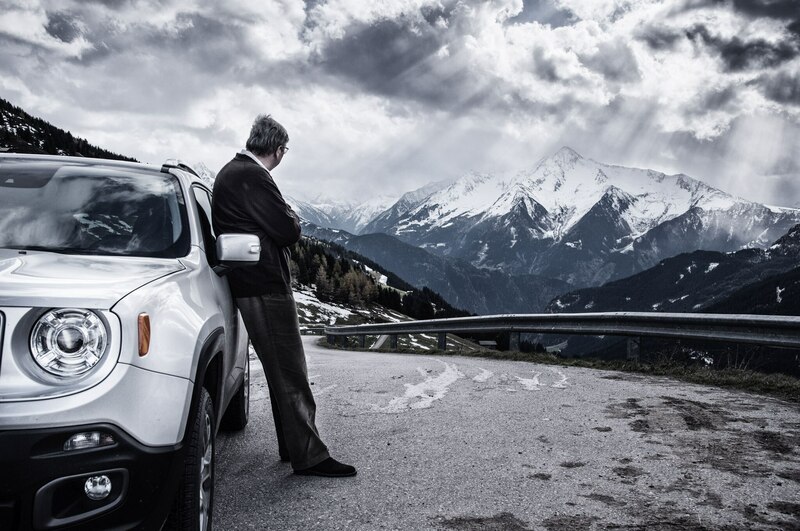 (Just as you can sell an old man a young man’s car but not the other way around, you can sell a woman a man’s car but not vice-versa). 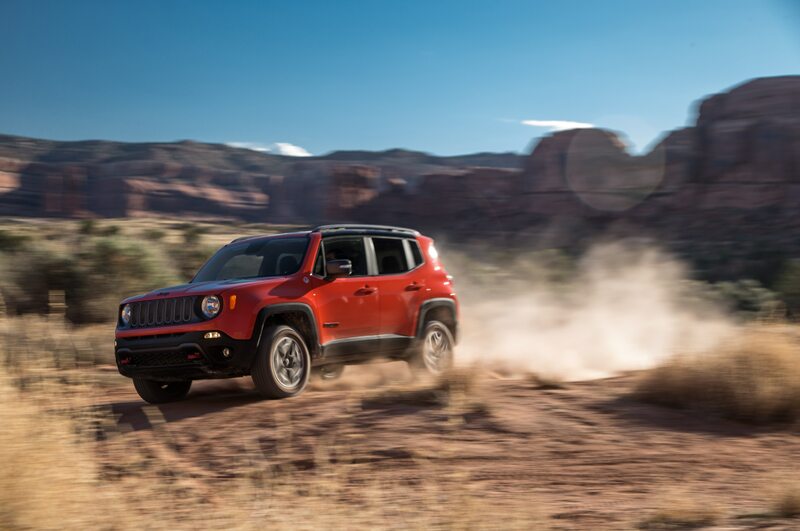 As you’d expect, Jeep designers and engineers have baked in as much Jeep-ness as possible in order to appease Rubicon Trail-level off-roaders. 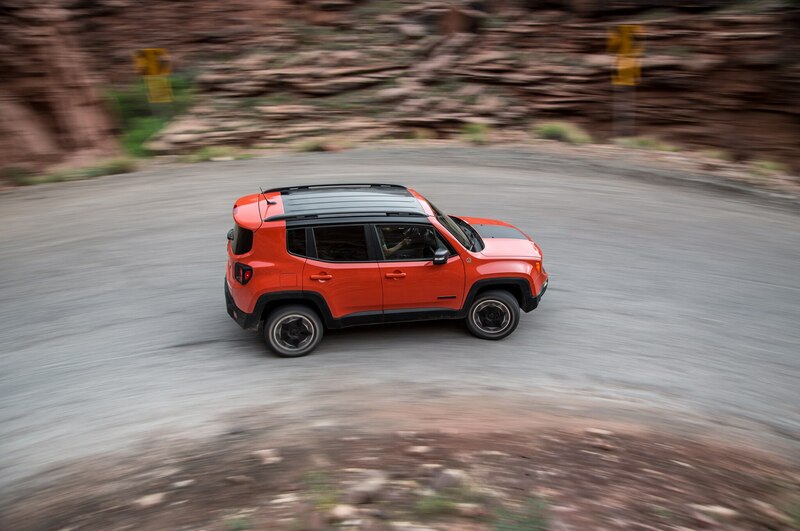 Moab corollary: You can’t sell an off-roader a city slicker’s Jeep, but you can sell a city slicker an off-roader’s Jeep. 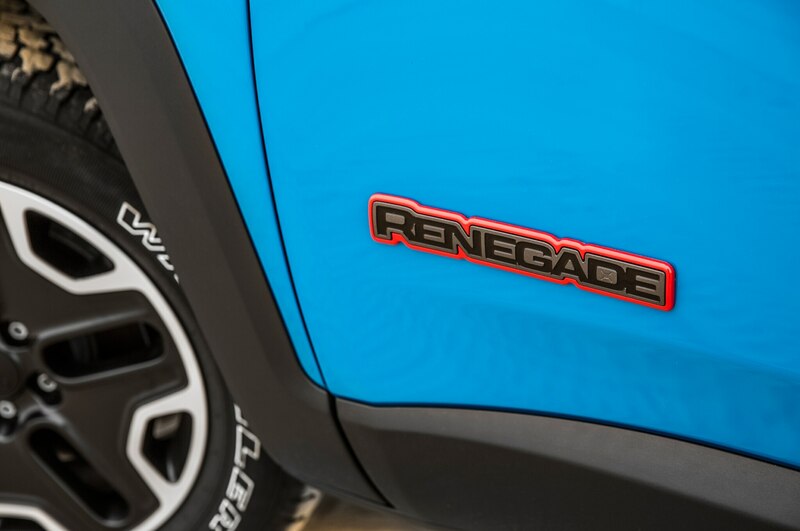 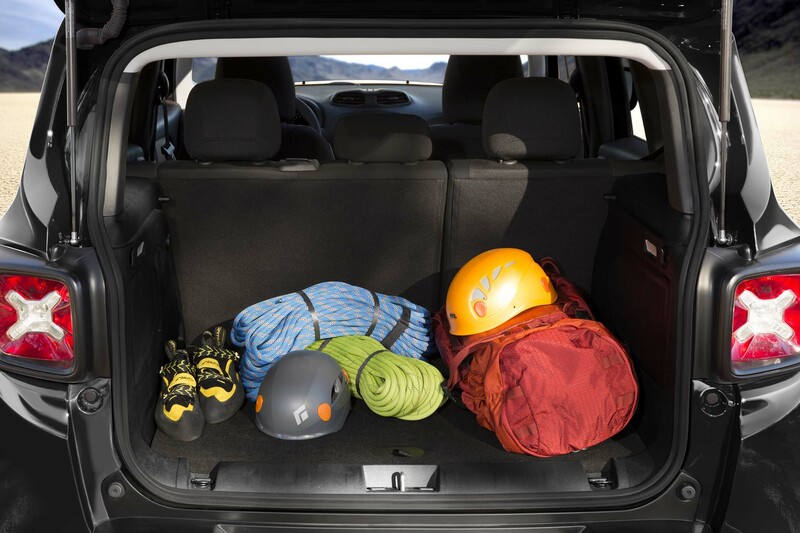 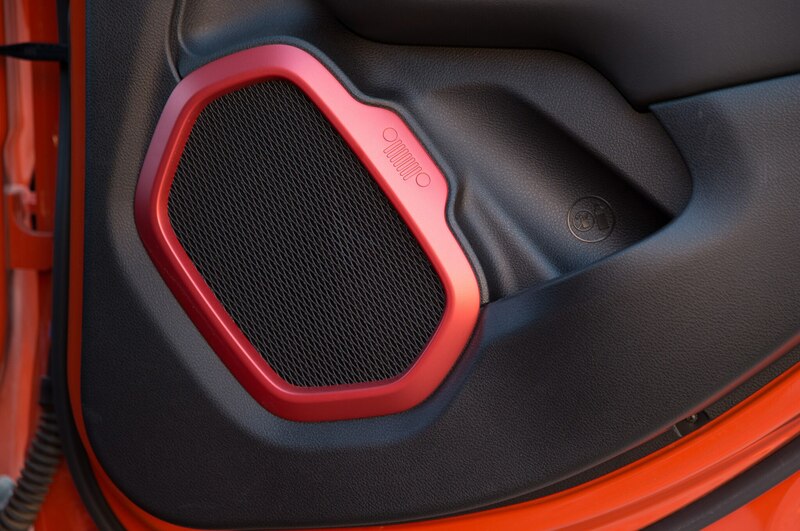 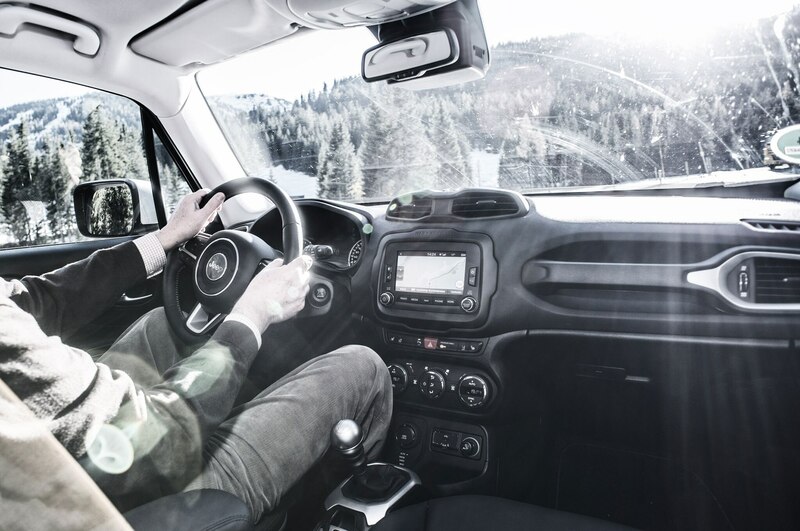 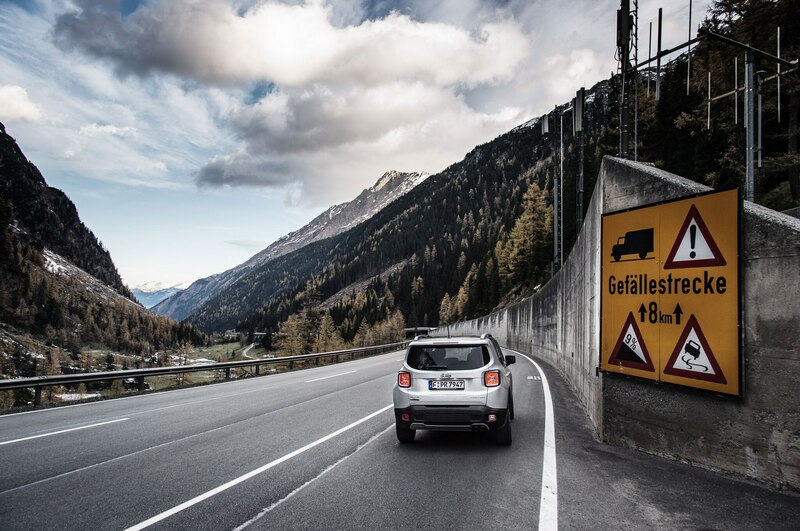 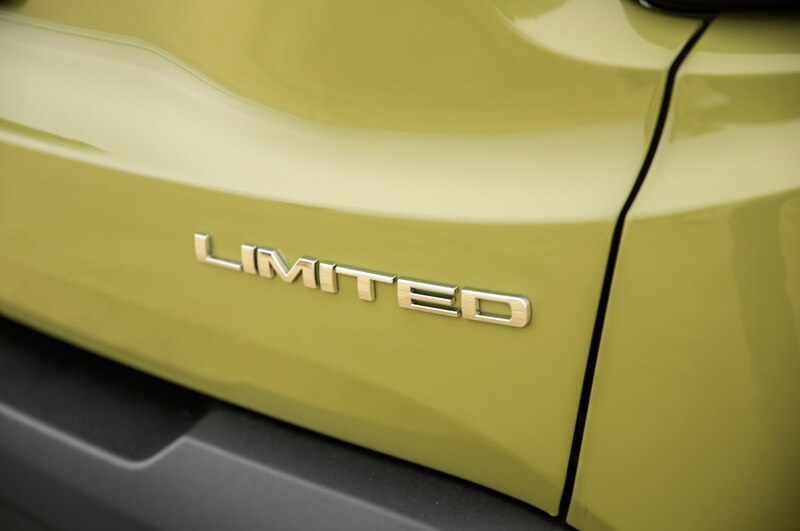 Engineers devised two new full-time 4×4 systems for the Renegade: Active Drive and Active Drive Low, the latter a full-time 4×4 system with a 20:1 crawl ratio. 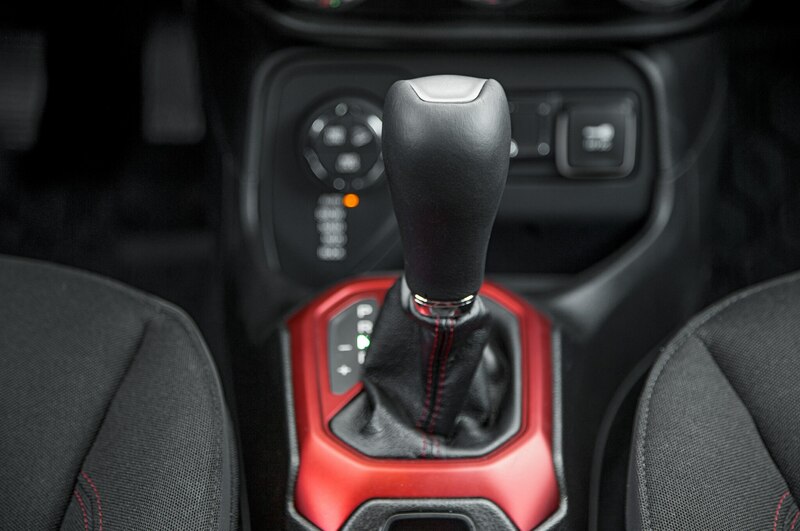 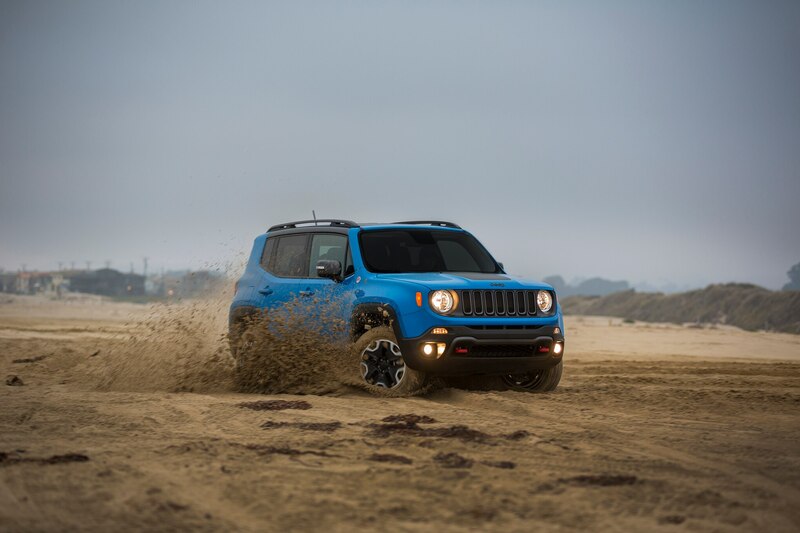 Both are designed to provide 100 percent of available engine torque to any one wheel. 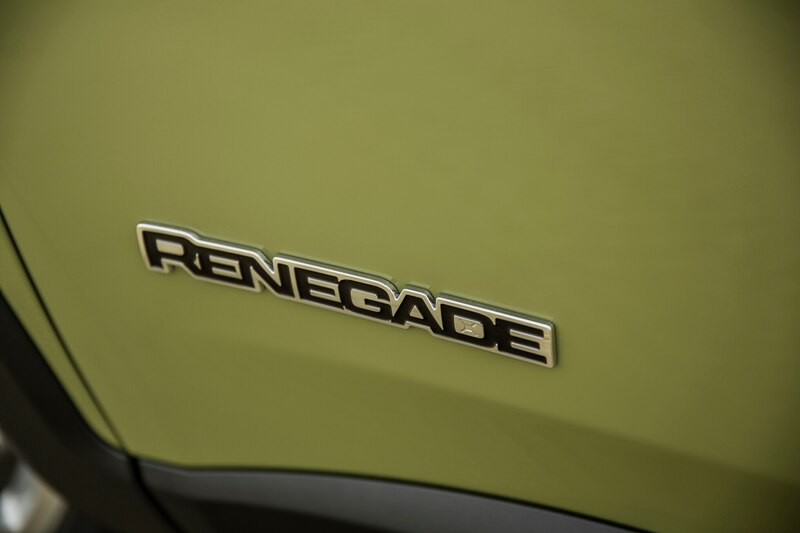 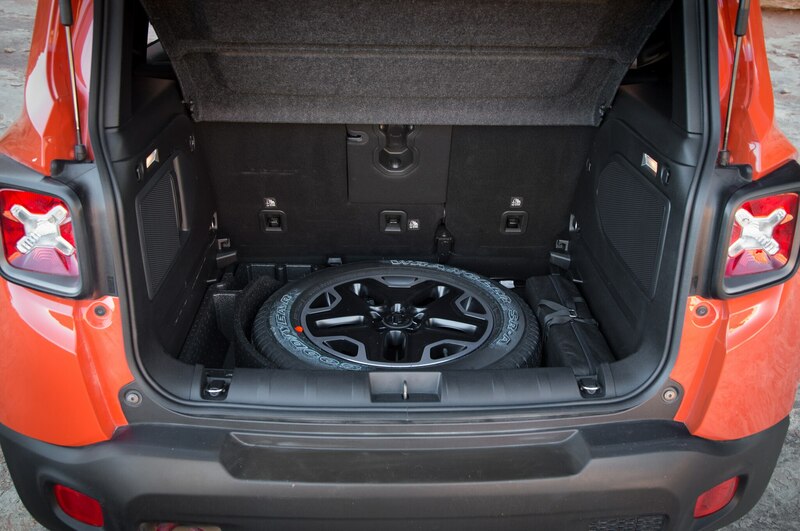 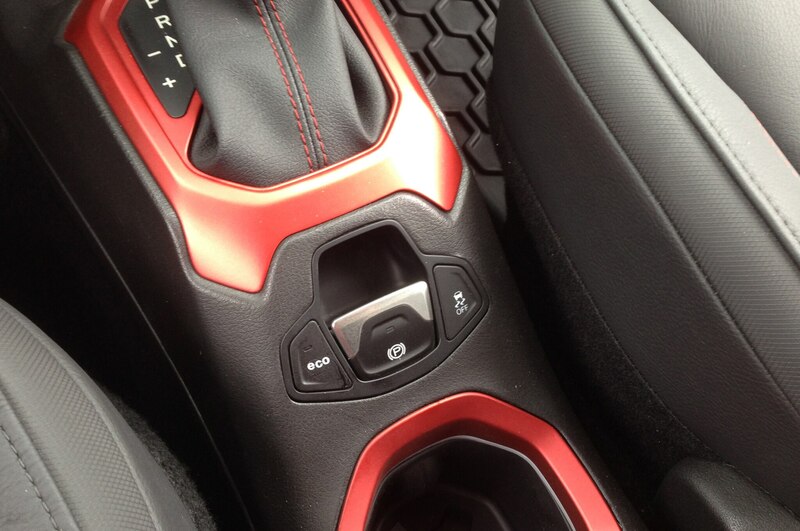 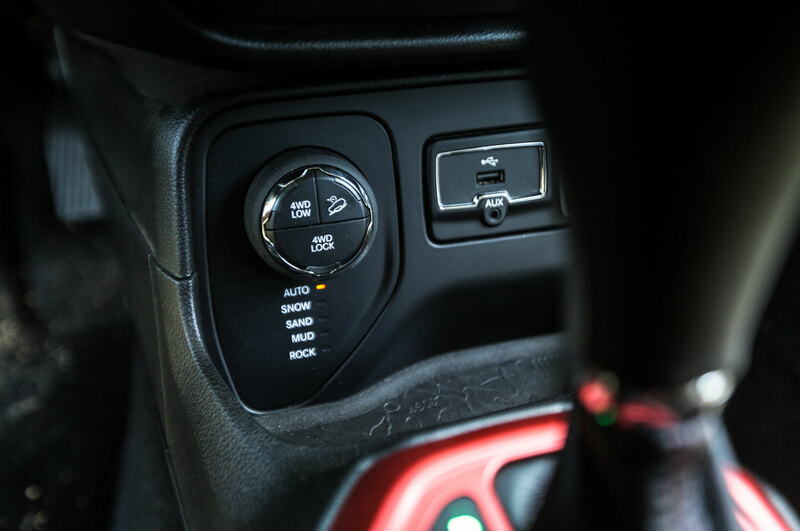 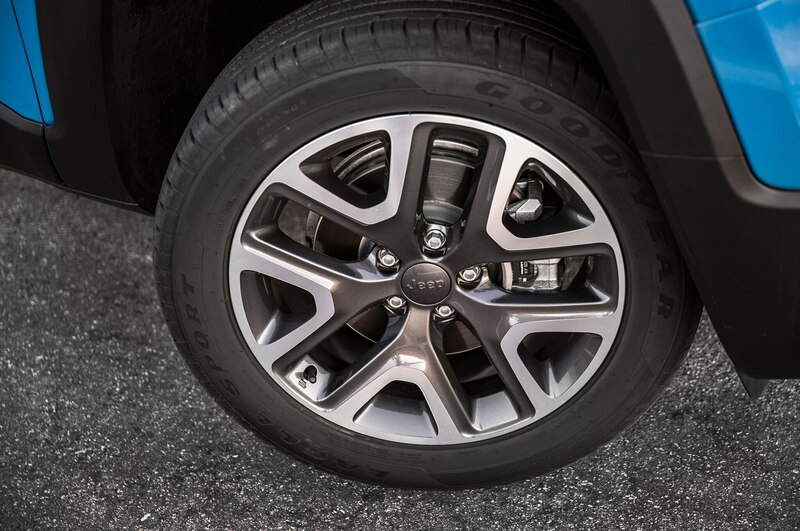 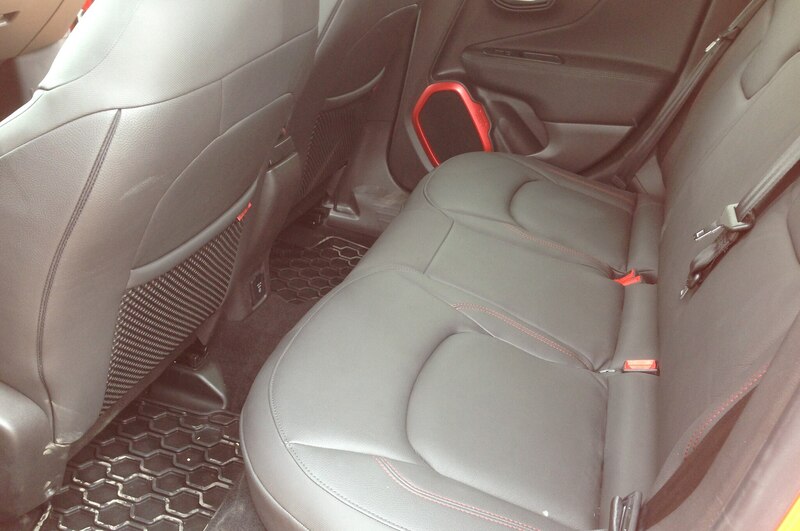 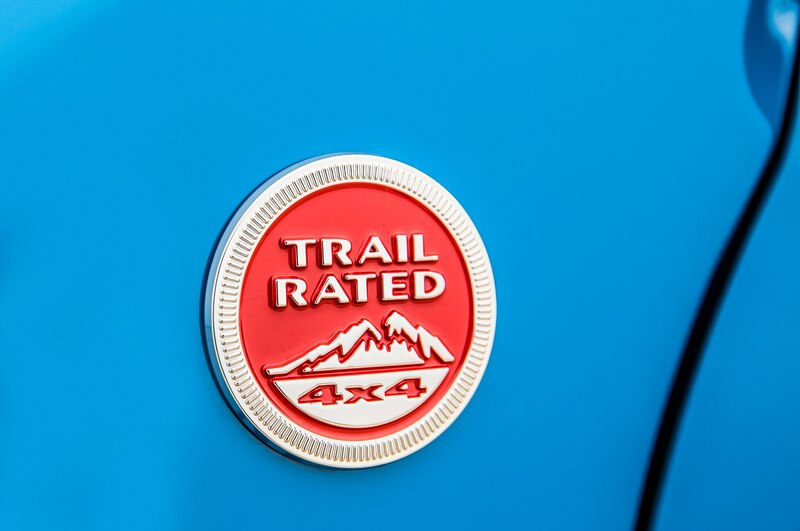 The Renegade 4×4 systems feature the new disconnecting rear axle and power takeoff unit first announced for all-wheel-drive versions of the 2015 Chrysler 200 V-6. 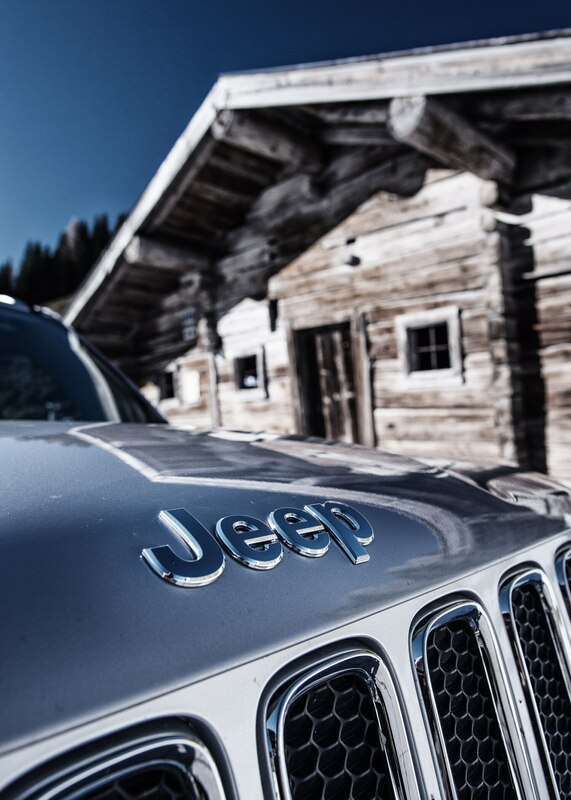 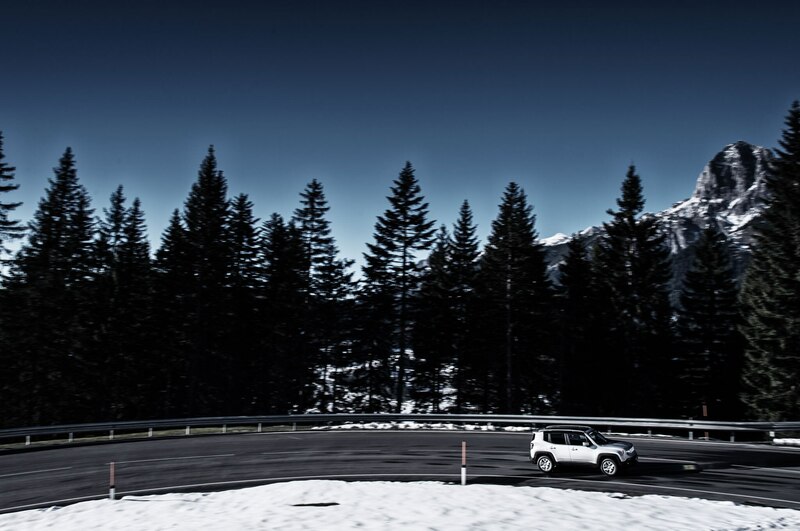 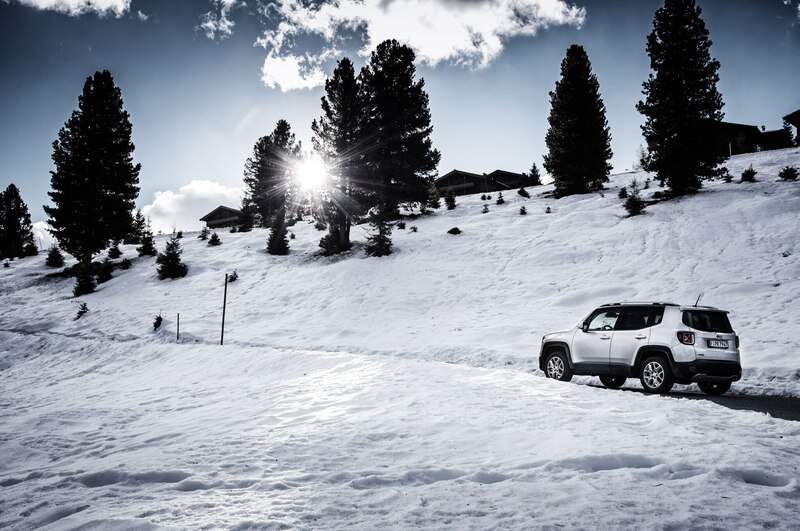 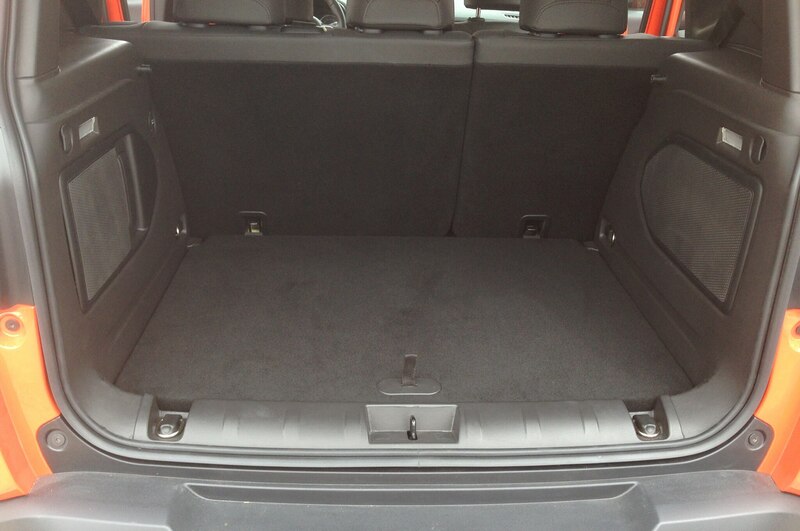 Four-wheel drive automatically engages when traction is needed. 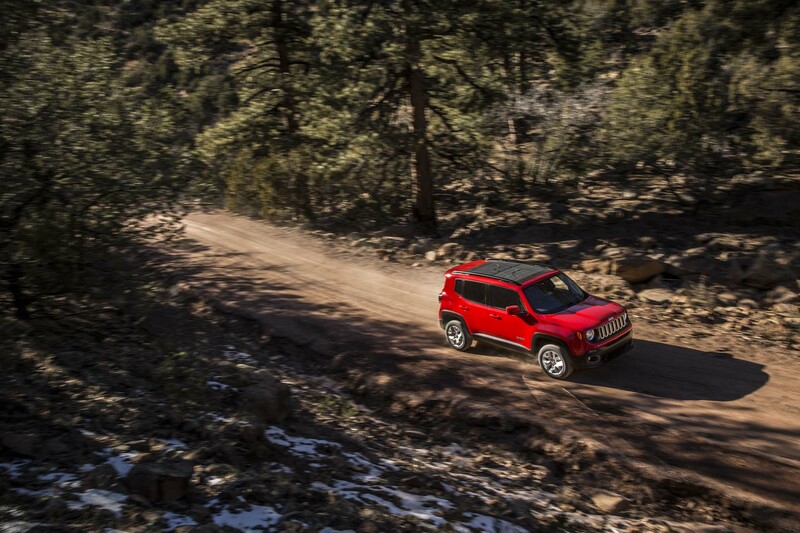 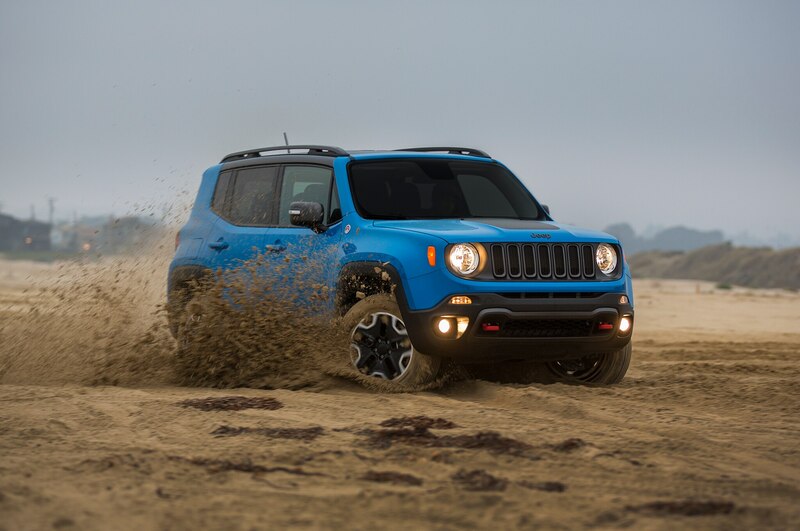 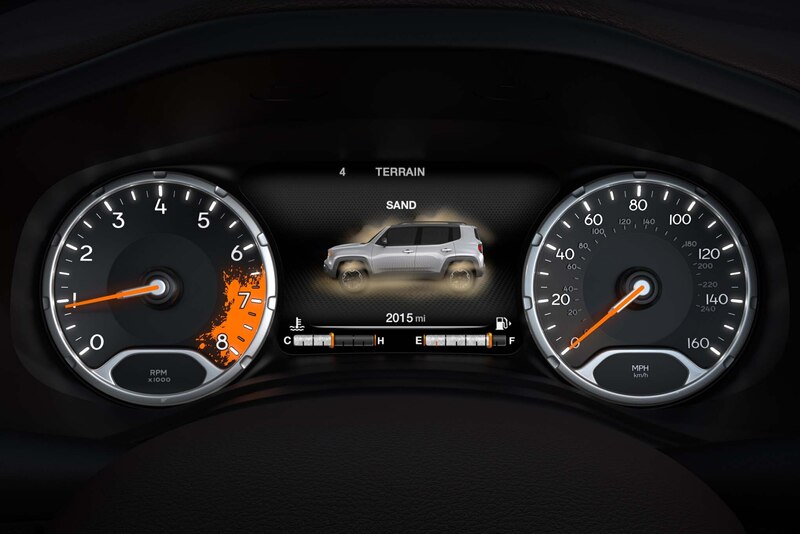 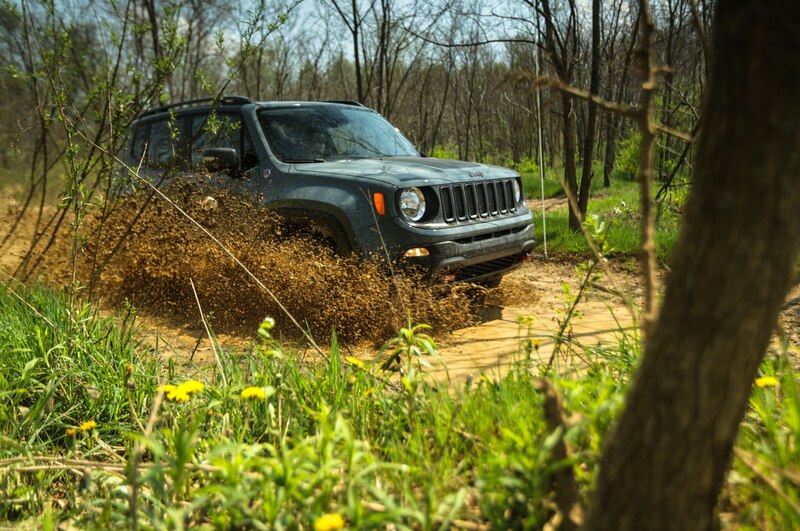 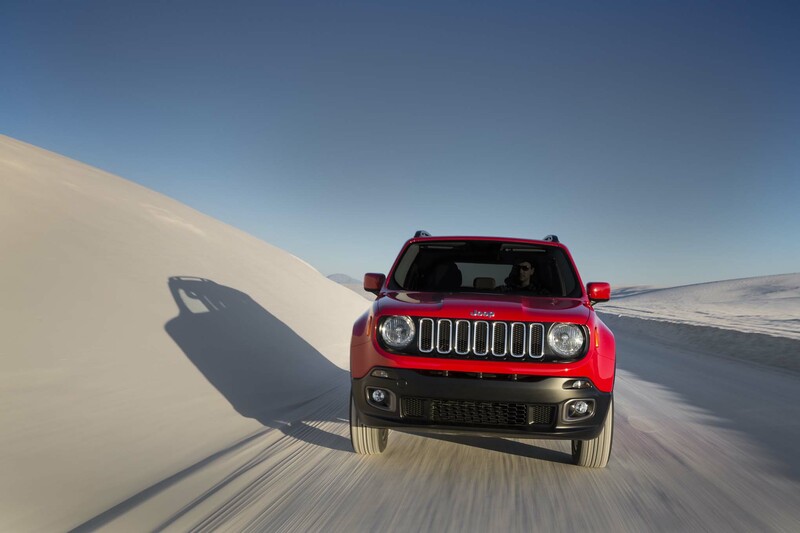 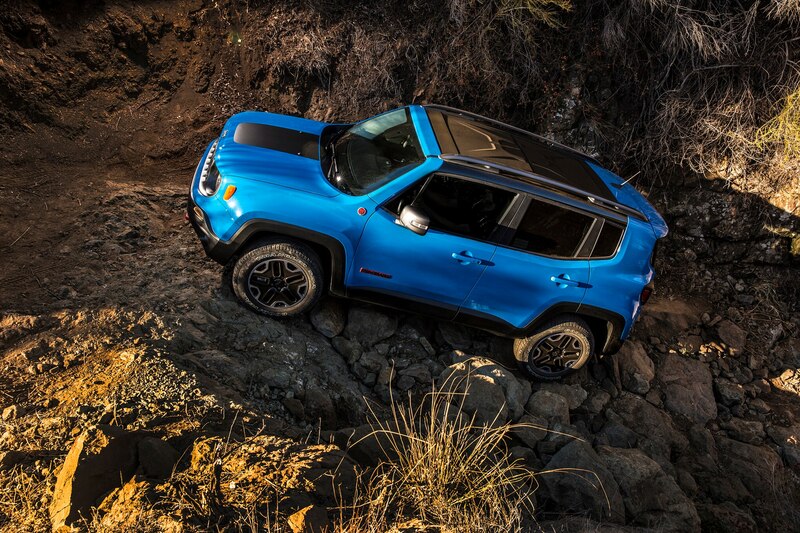 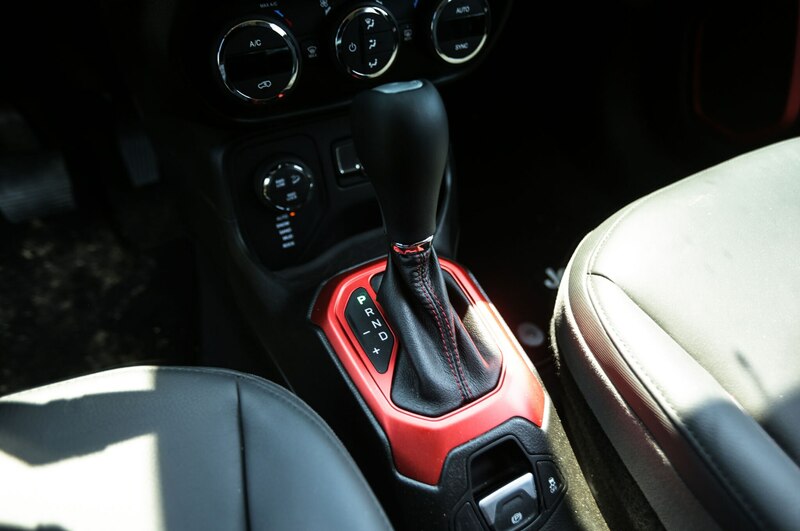 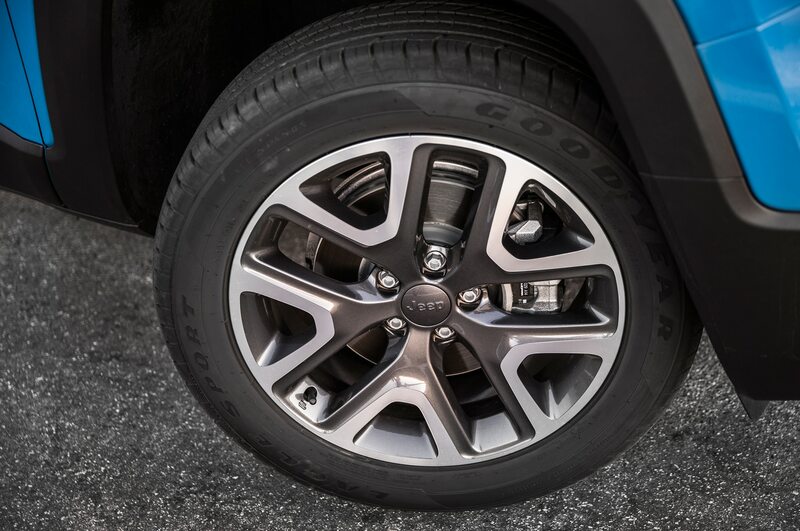 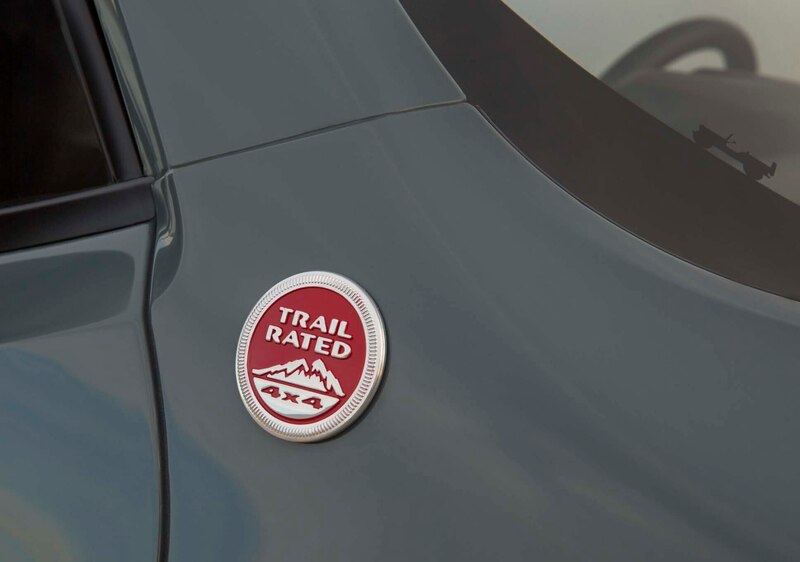 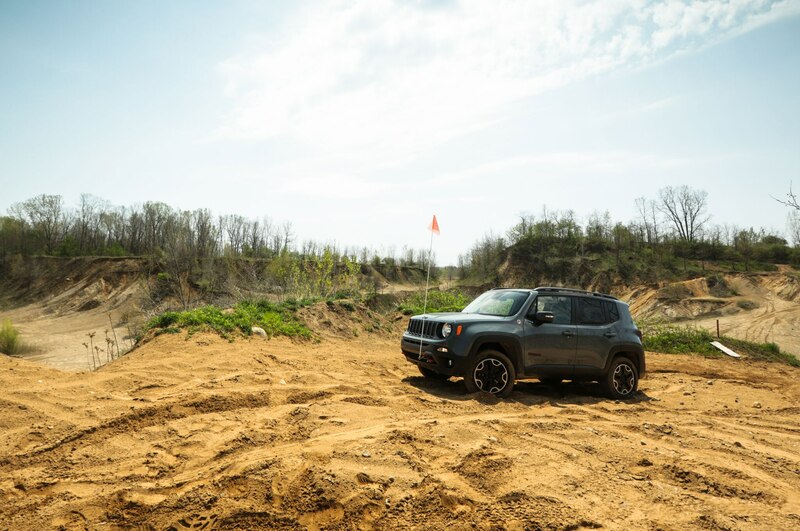 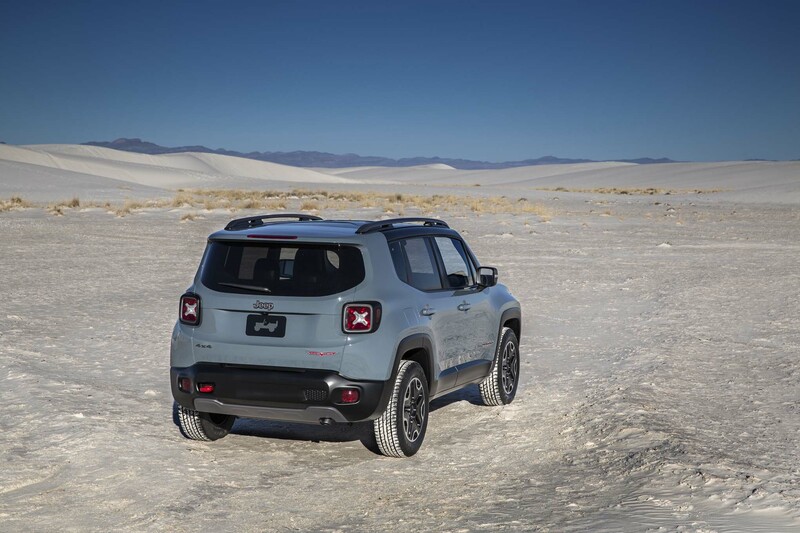 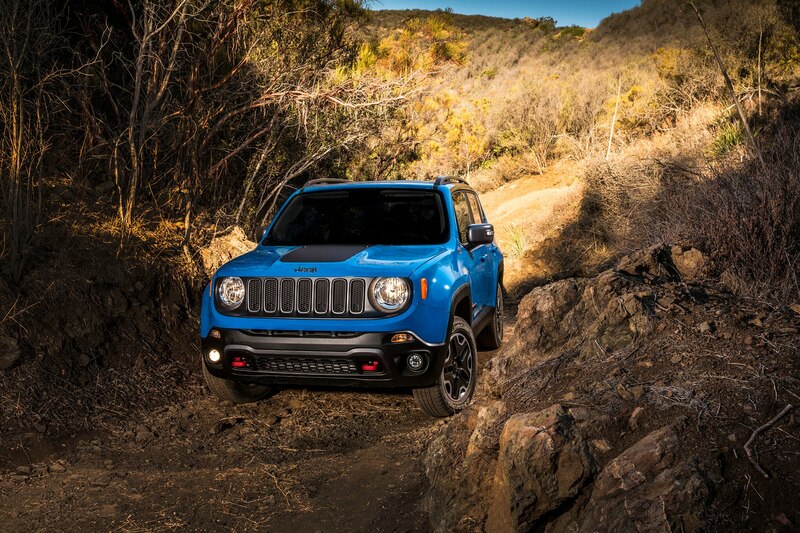 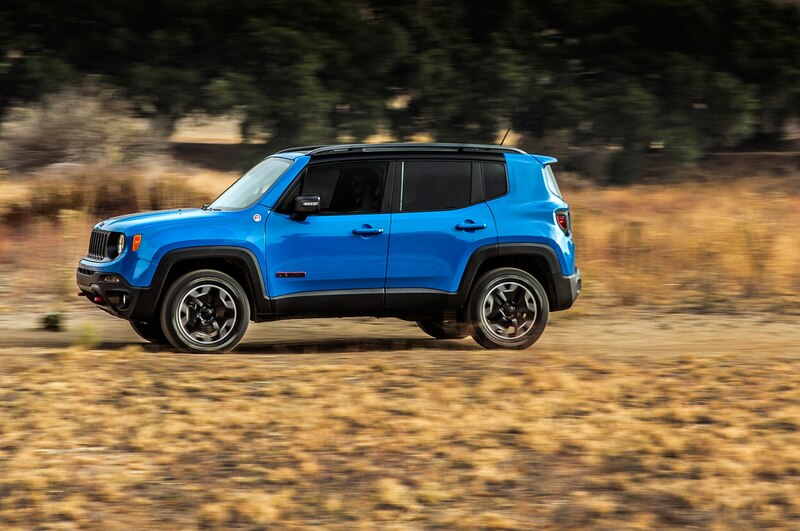 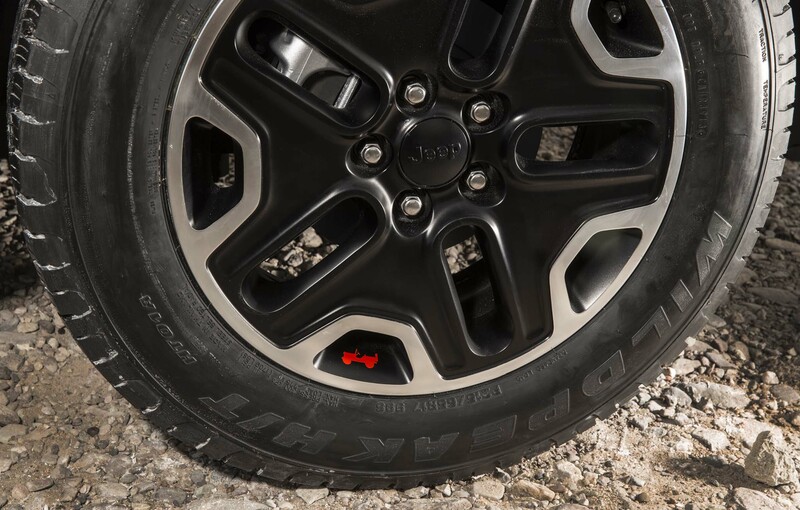 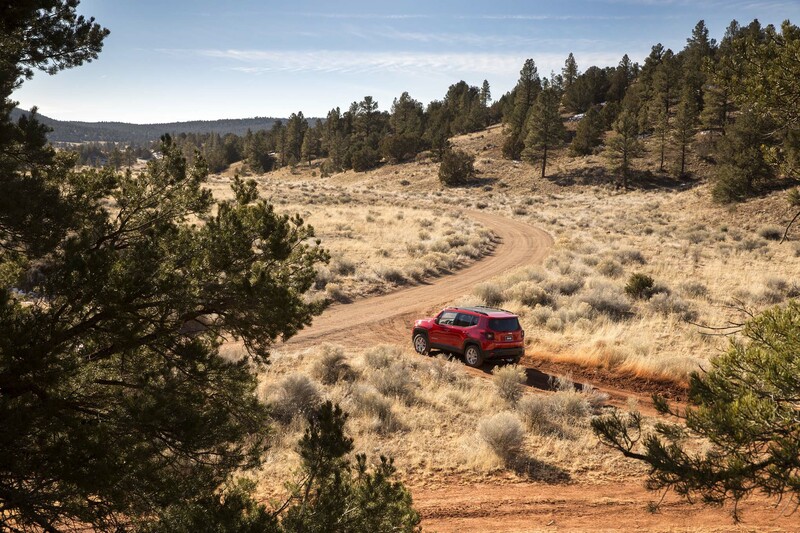 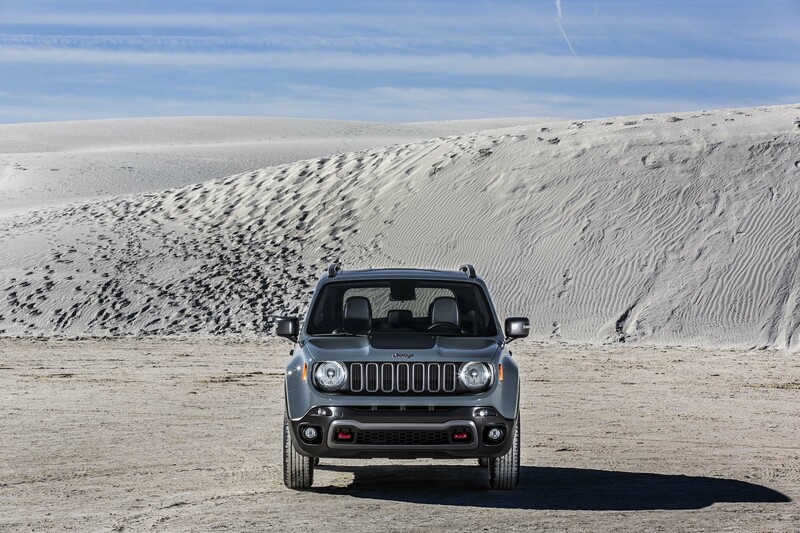 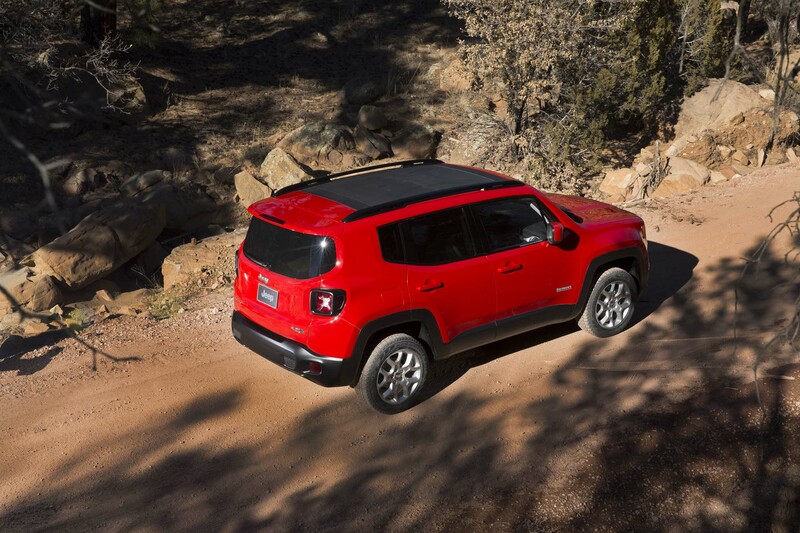 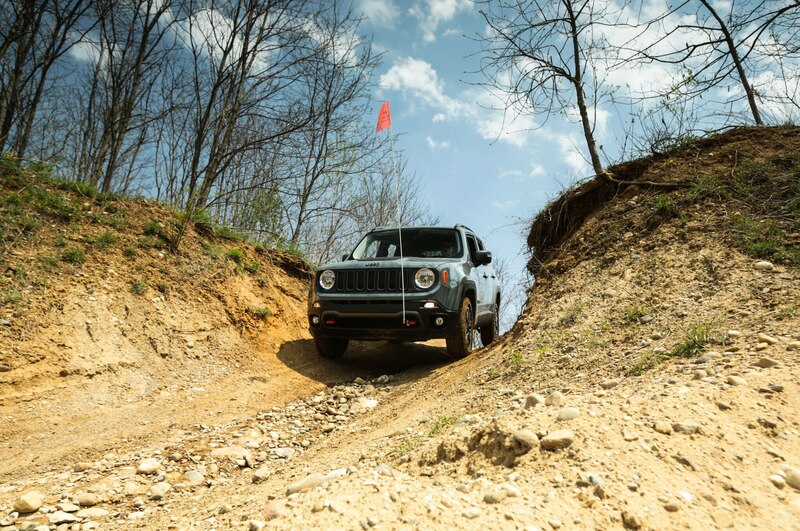 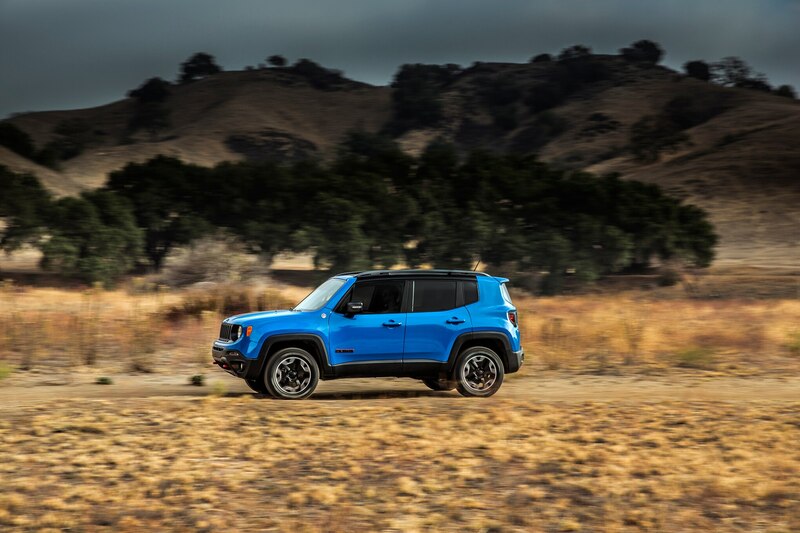 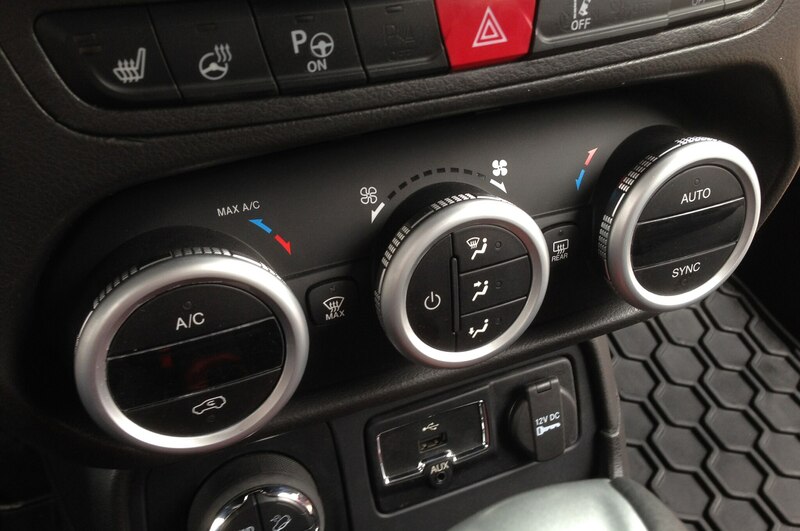 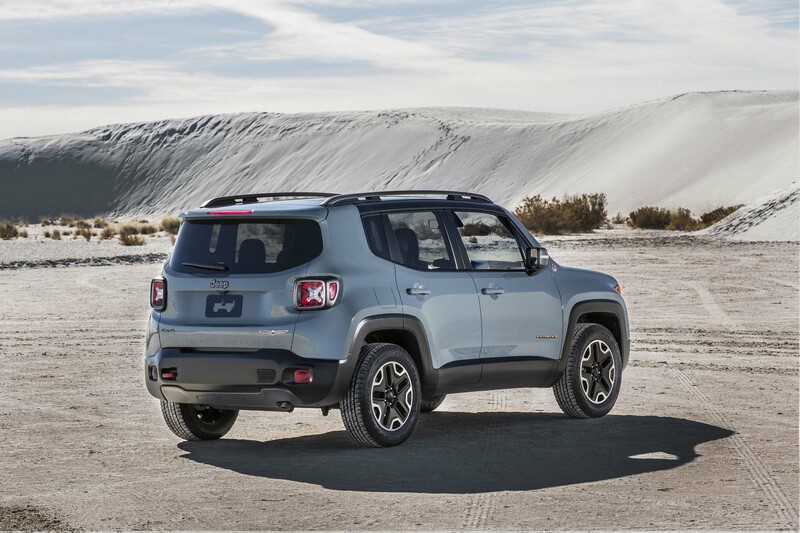 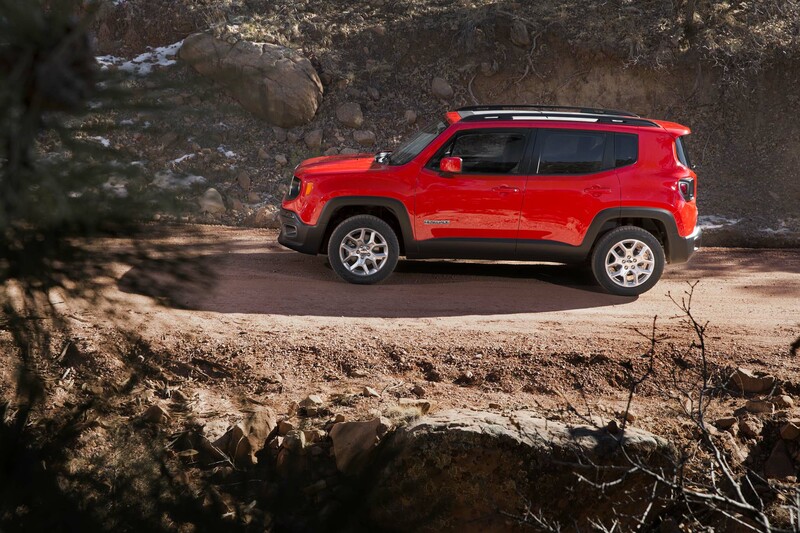 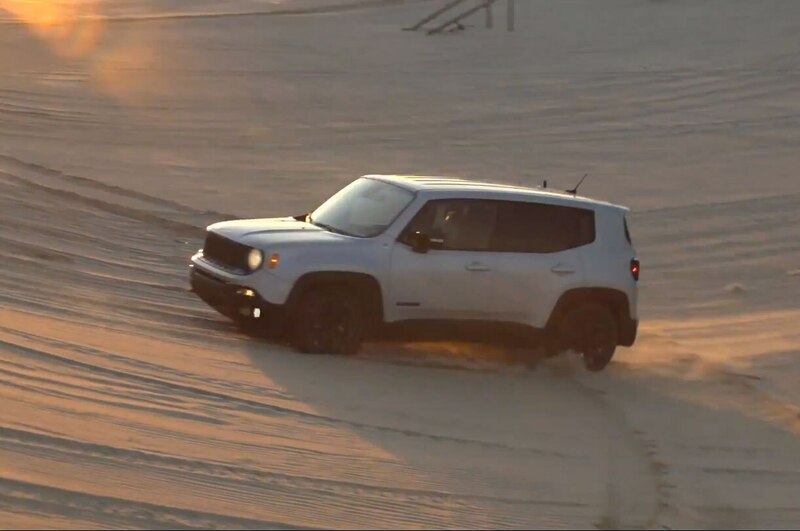 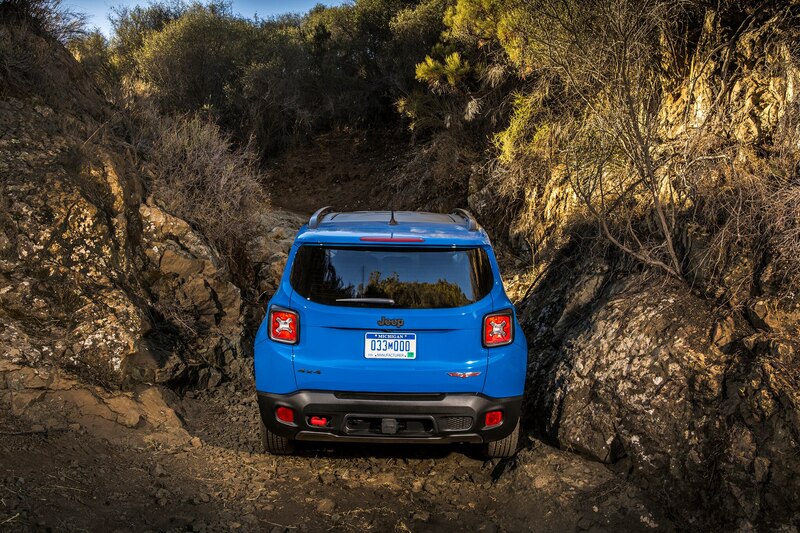 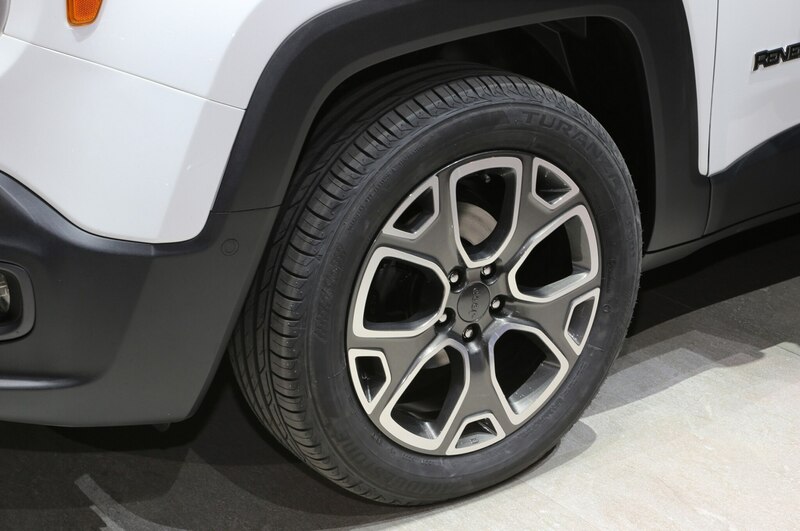 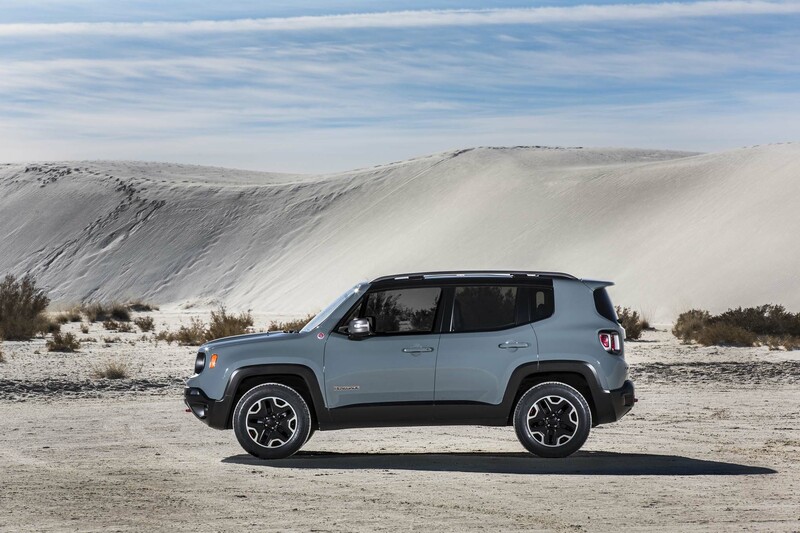 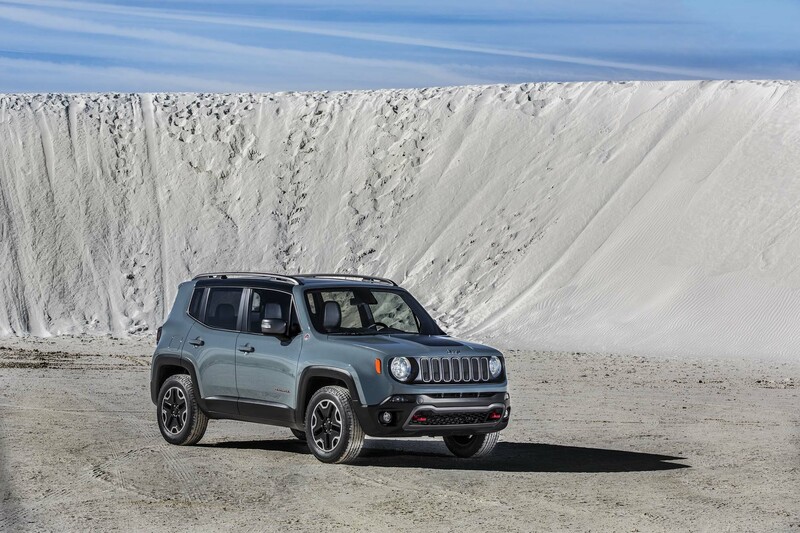 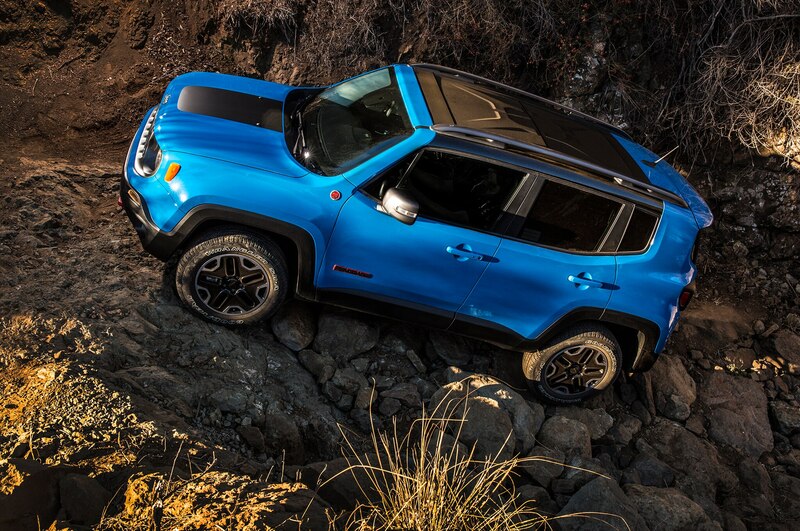 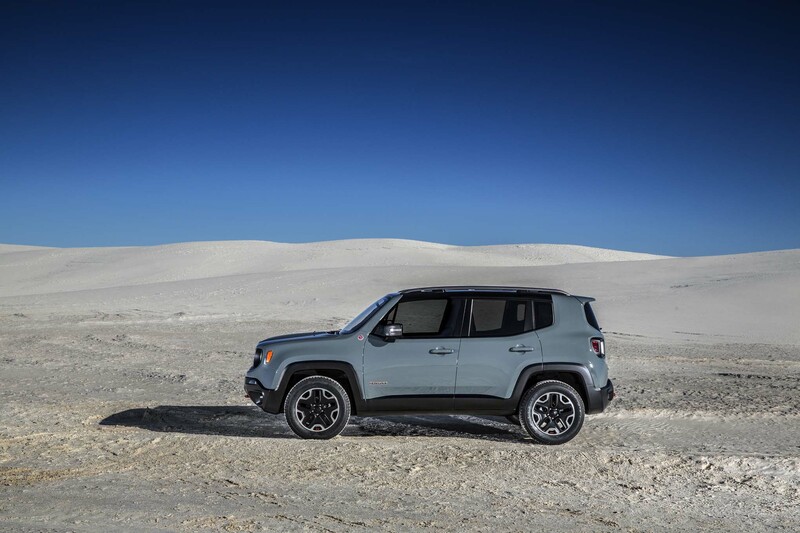 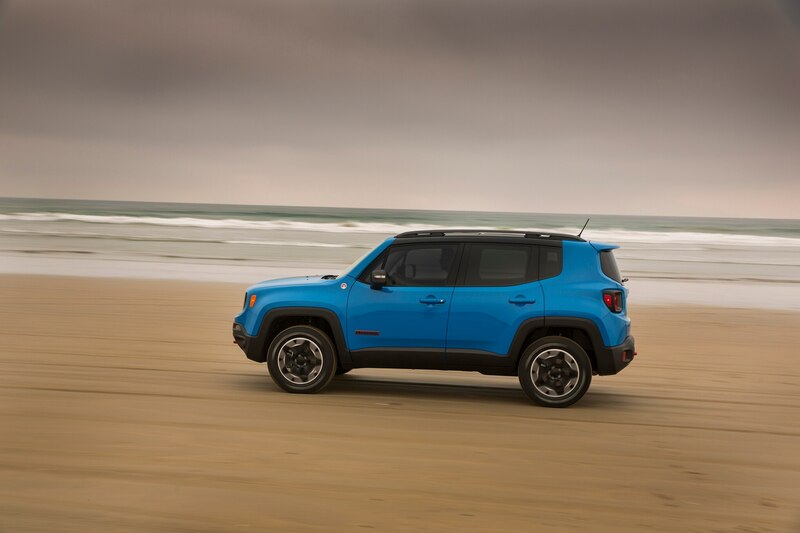 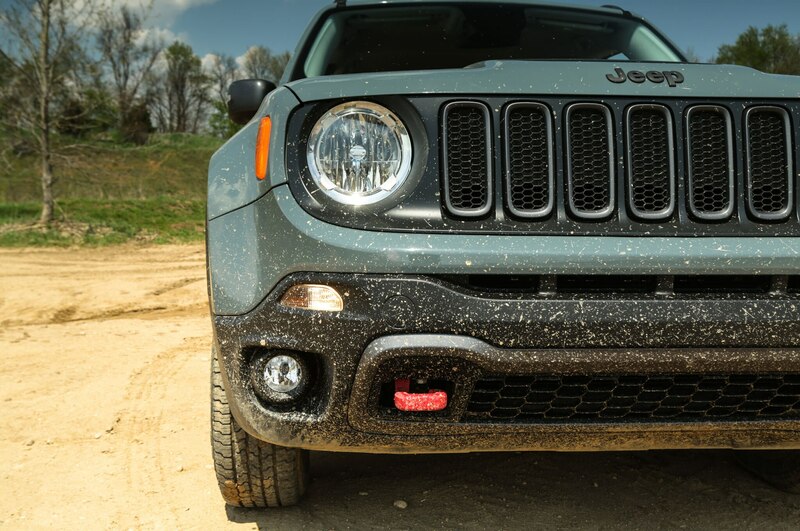 The Active Drive and Active Drive Low systems come with Selec-Terrain, a traction control system with Sand, Snow, Mud, and Automatic settings and, on Trailhawk versions of the Renegade, an added “Rock” mode. 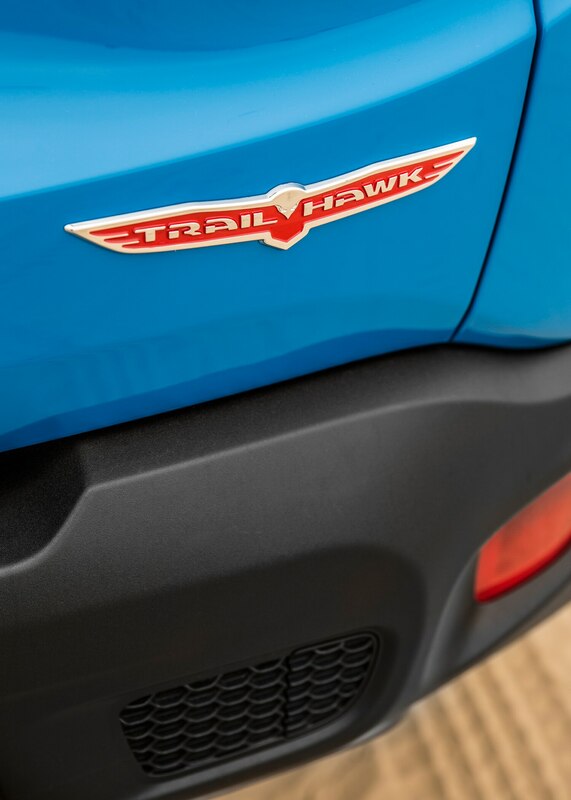 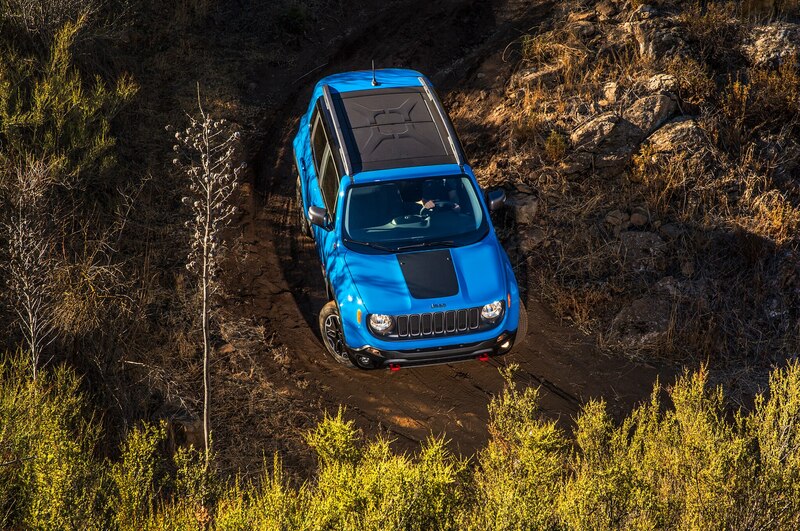 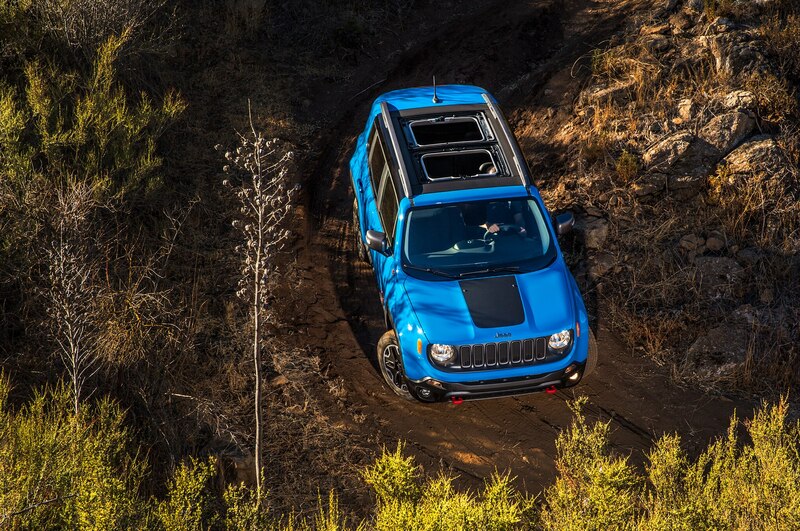 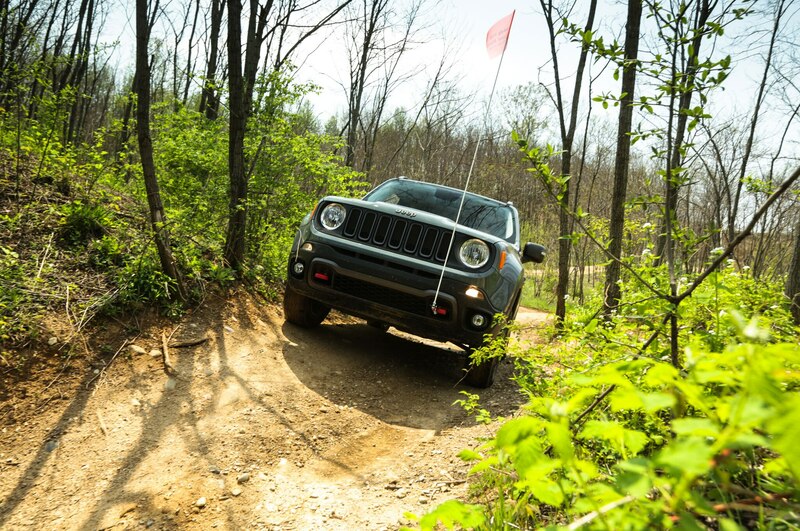 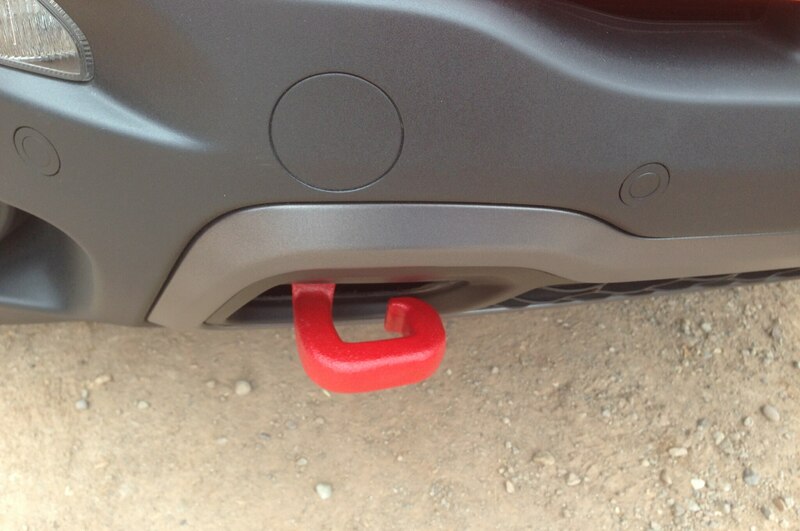 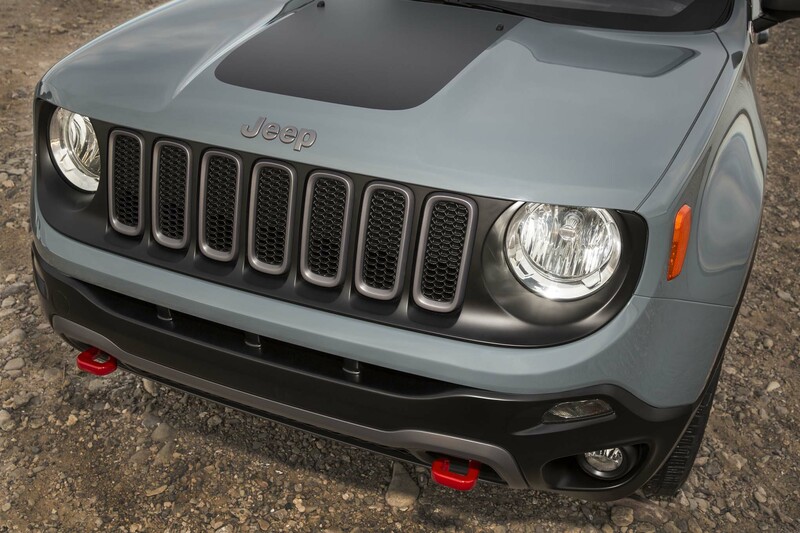 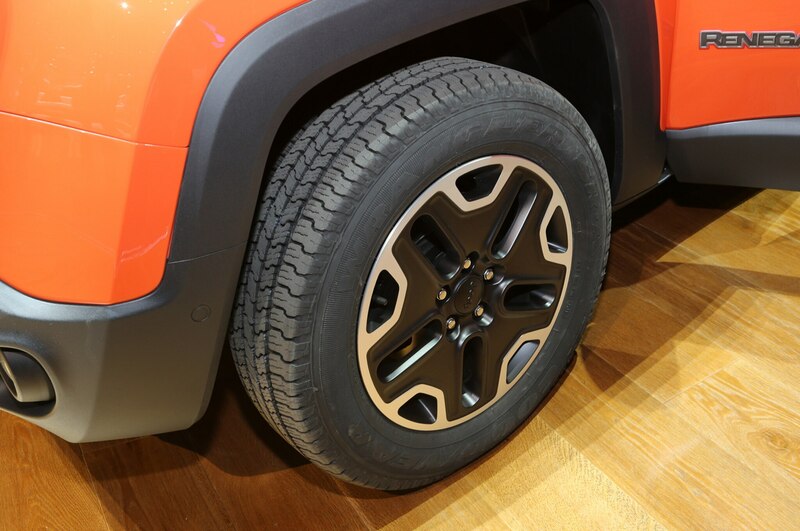 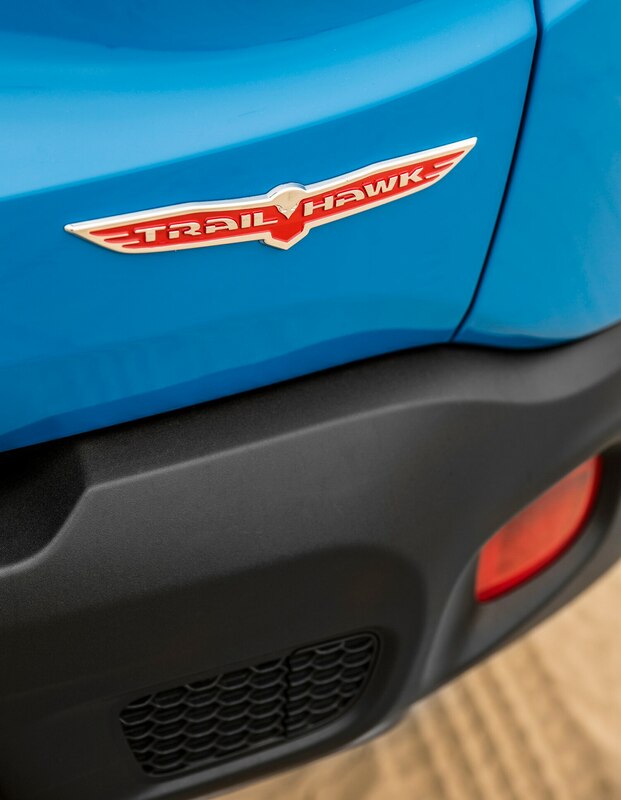 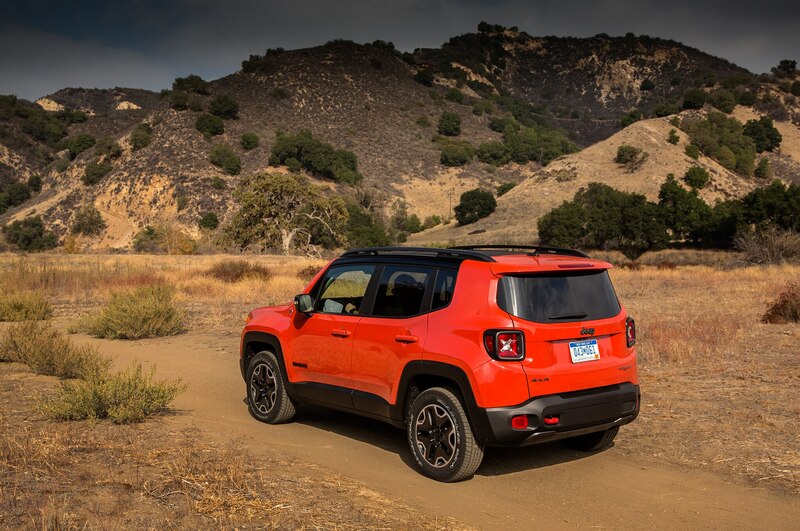 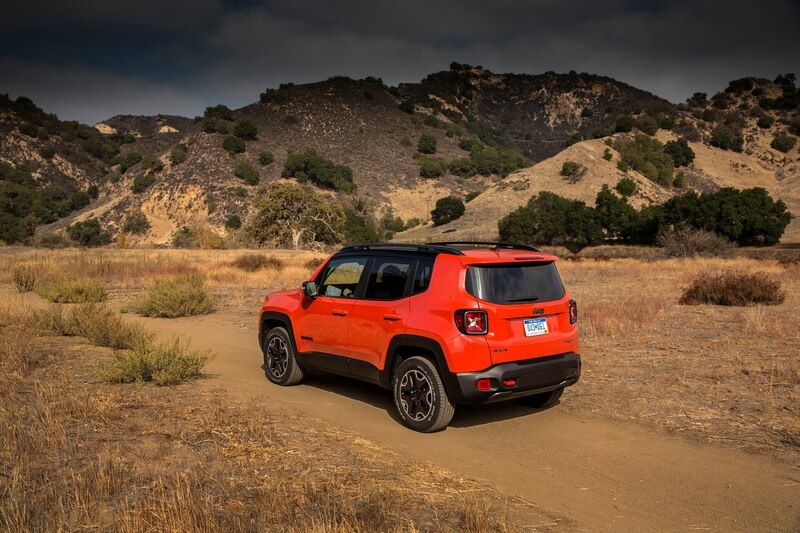 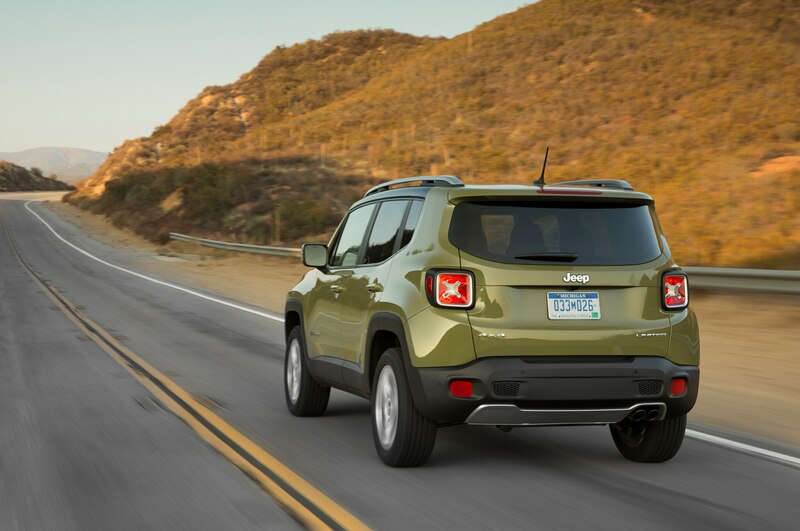 Trailhawk is Jeep-speak for “most off-road capable” trim level, and in the Renegade it includes the Active Drive Low system and Rock mode plus 0.8-inch higher ride height; skid plates with red front and rear tow hooks; unique fascias providing approach, breakover, and departure angles of 30.5, 25.7 and 34.3 degrees; 17-inch all-terrain tires; up to 8.1 inches of wheel articulation; hill-descent control; and up to 19 inches of water fording. 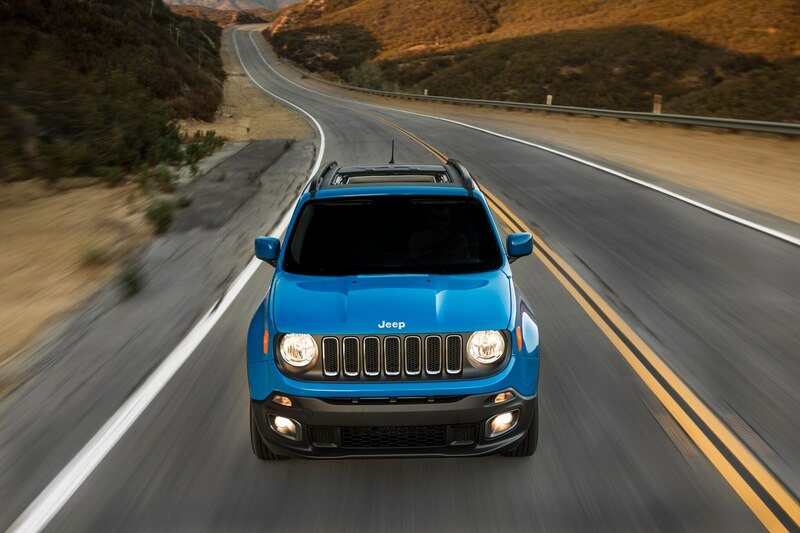 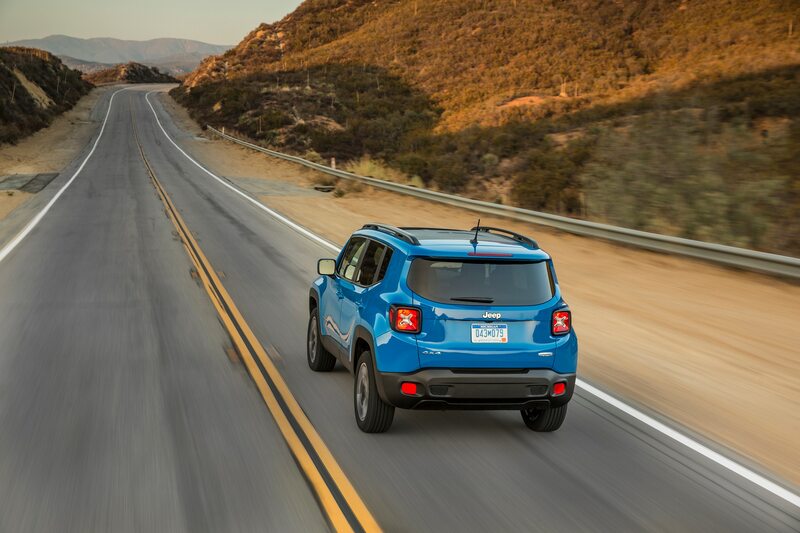 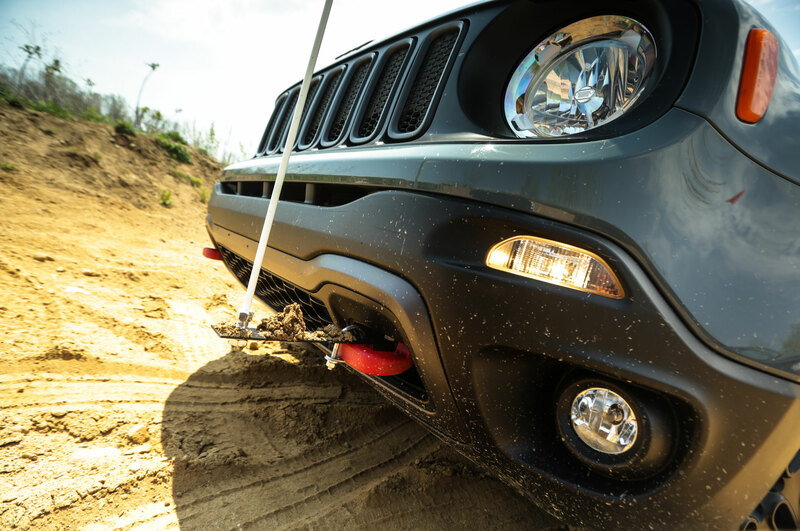 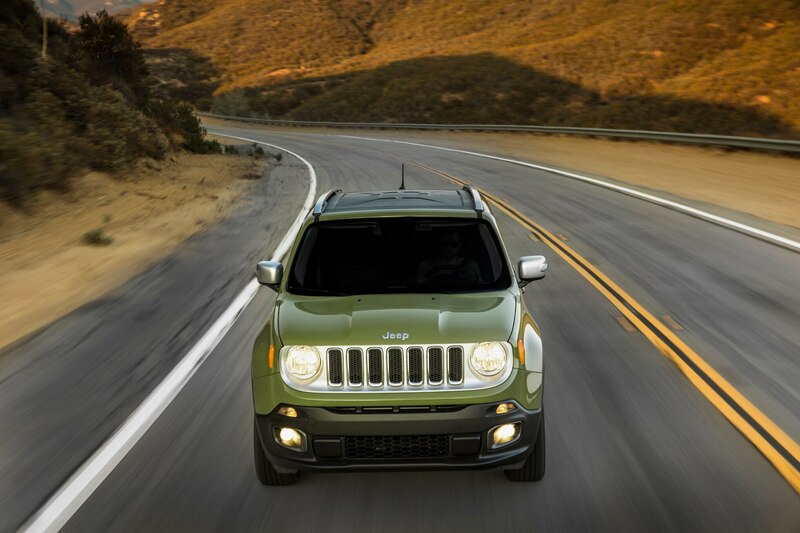 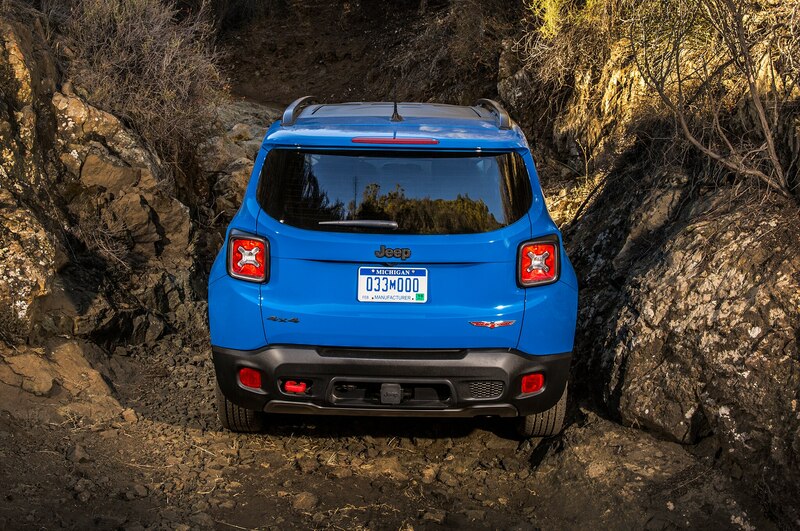 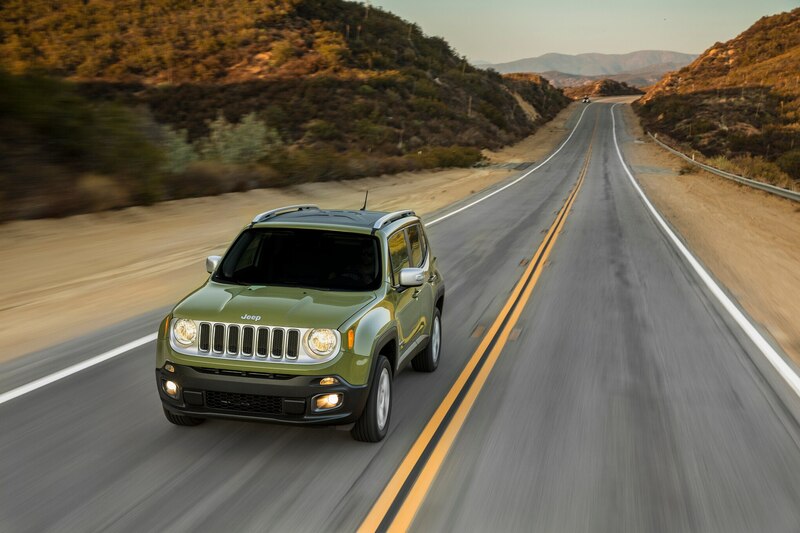 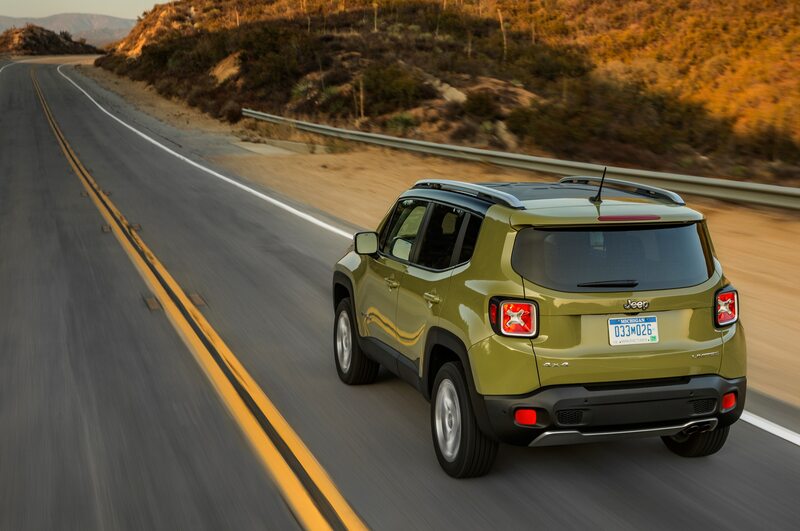 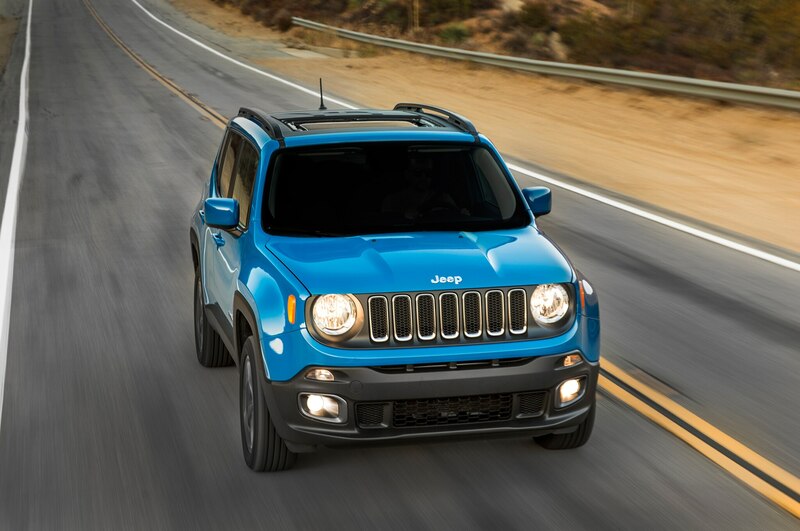 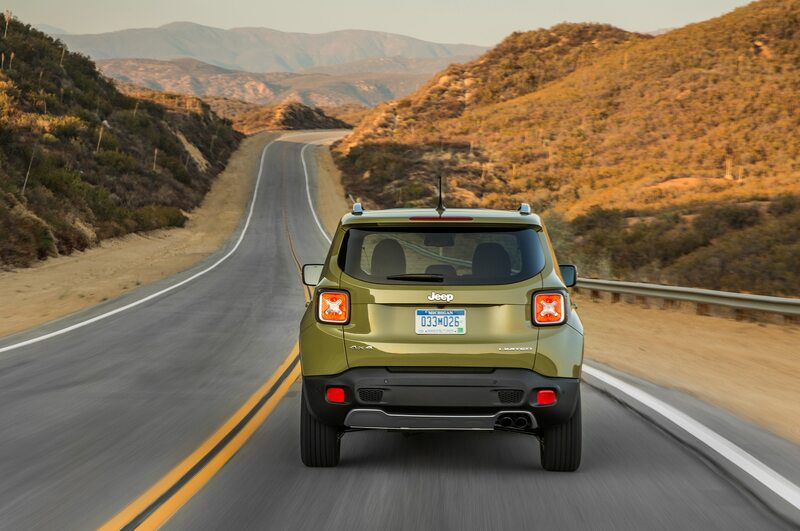 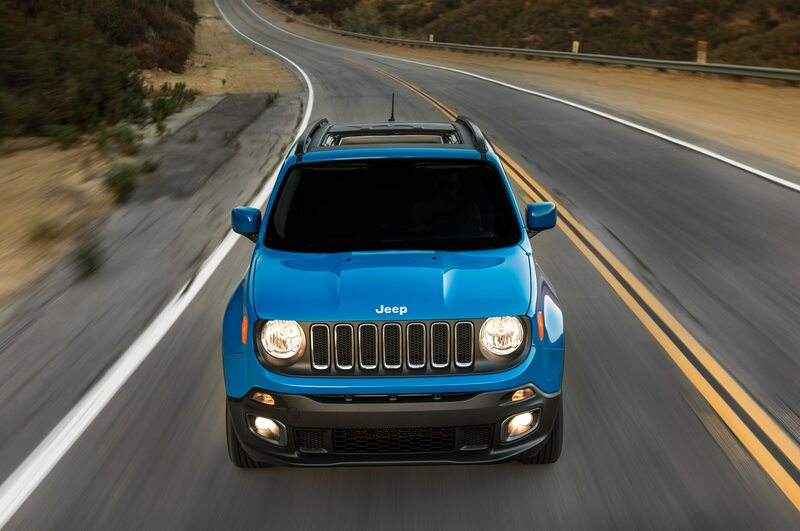 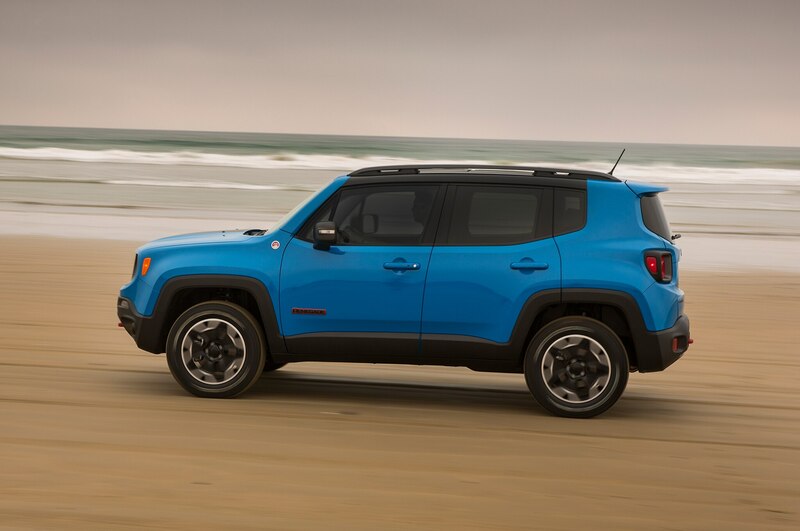 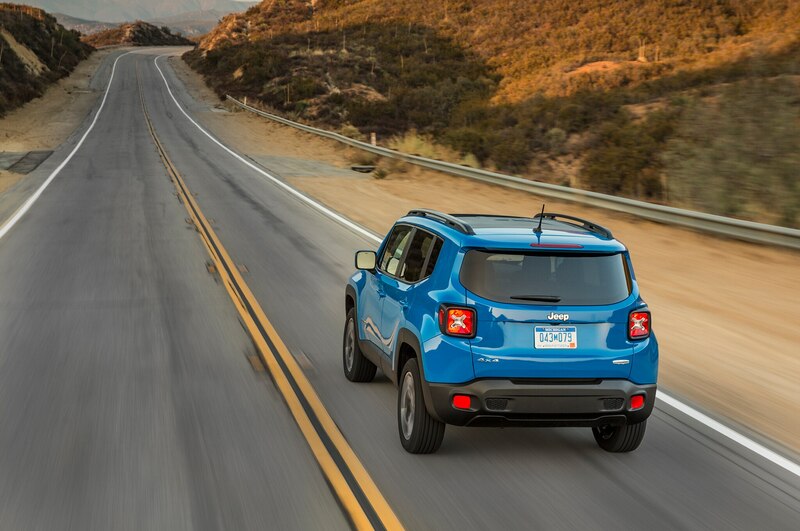 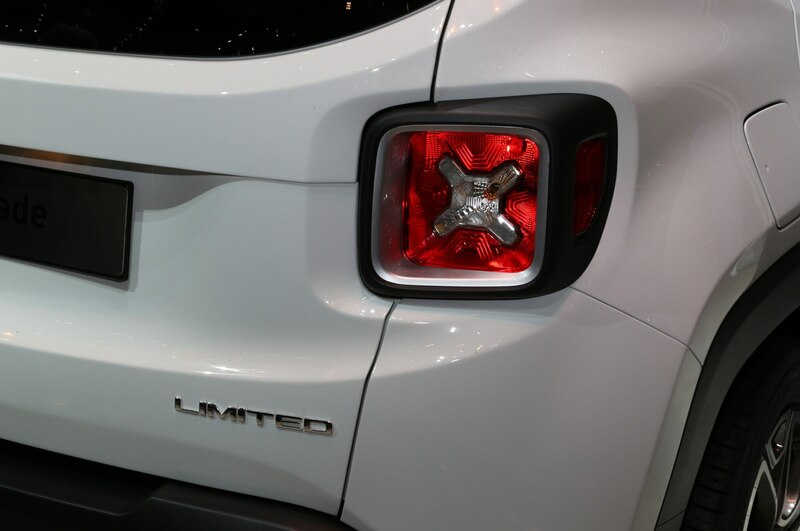 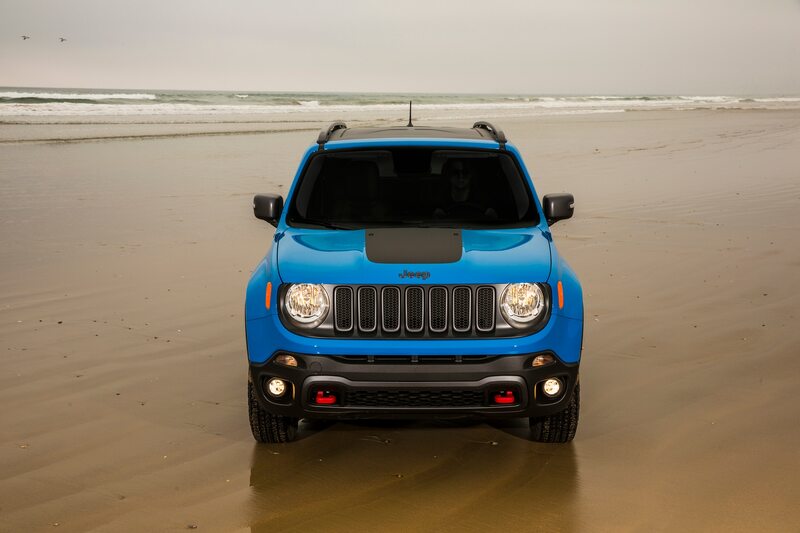 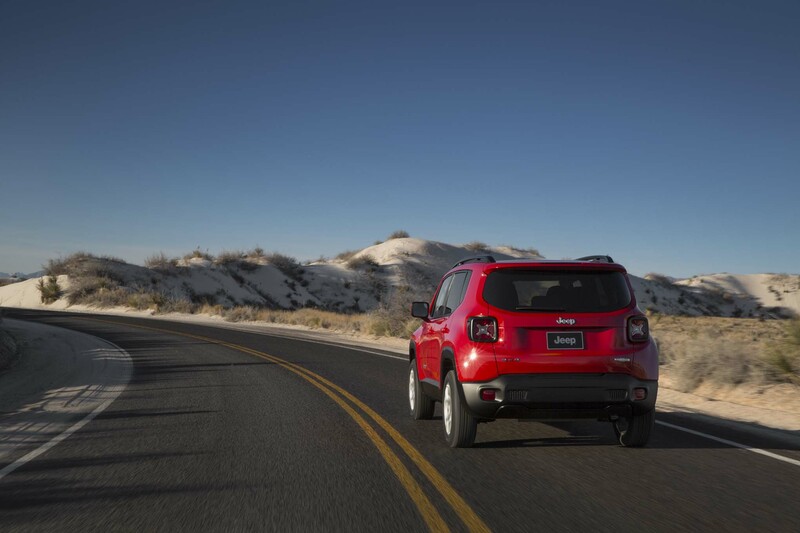 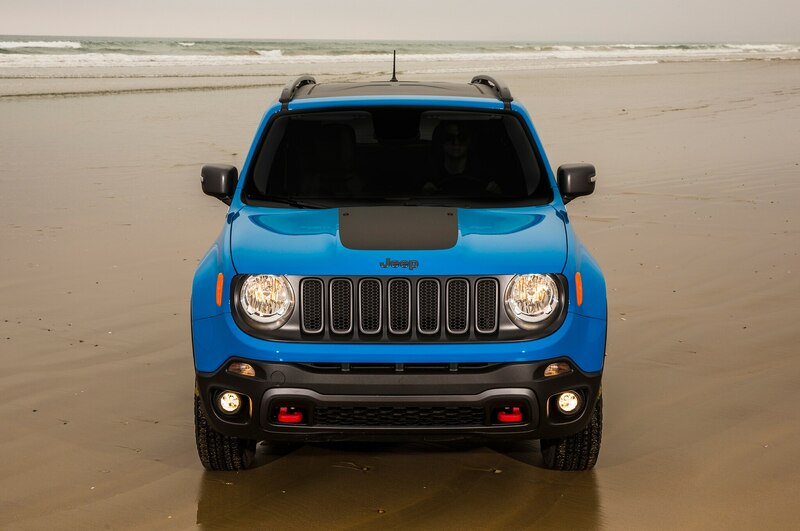 With the optional 2.4-liter Tigershark I-4 and tow package, the Renegade has a 2000-pound towing capacity. 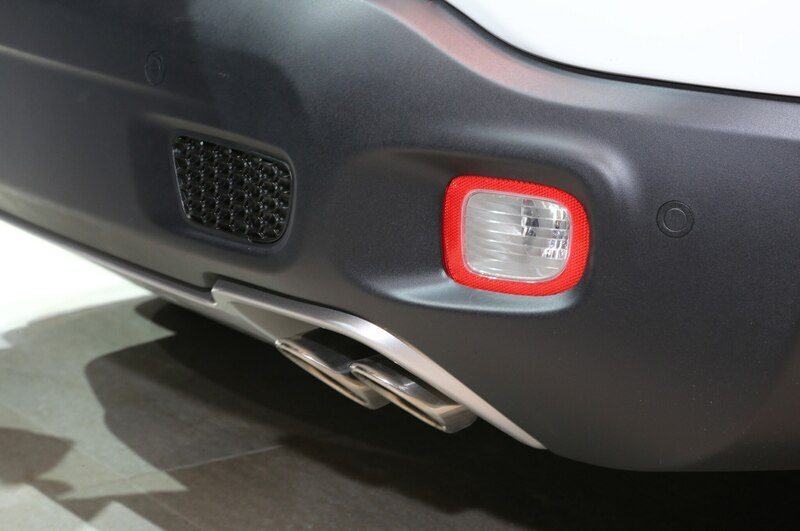 Markets outside of North America are offered a Multi-Jet II turbodiesel that can tow up to 3300 pounds. 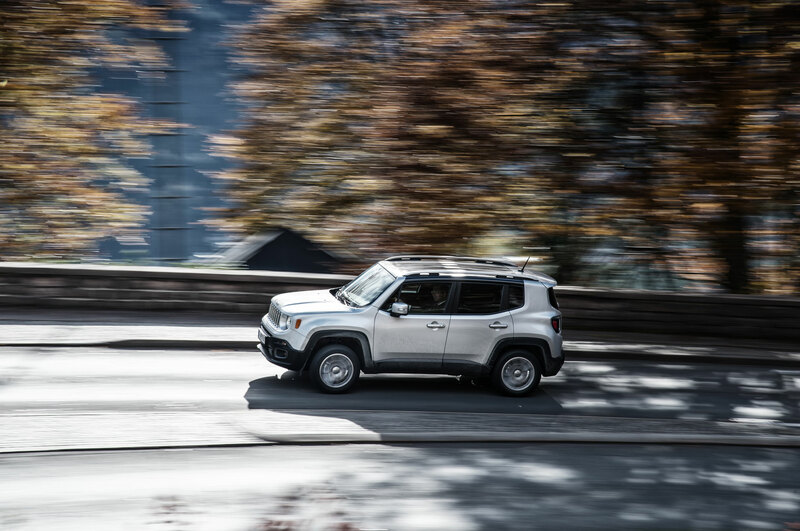 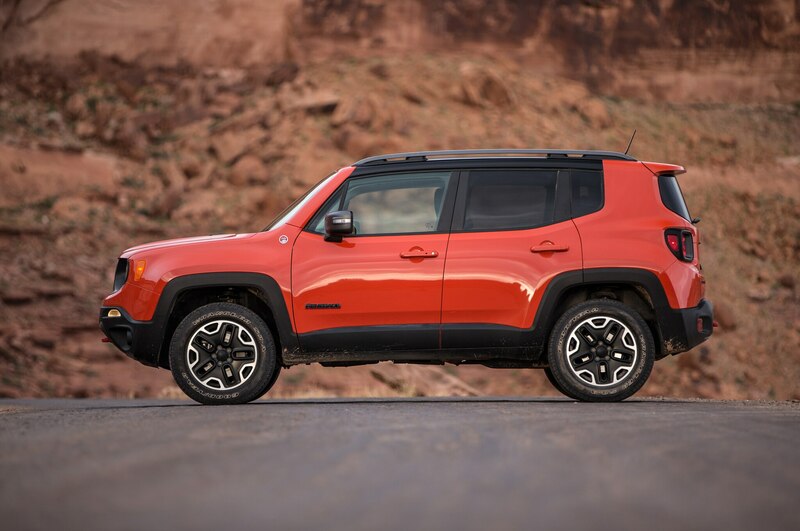 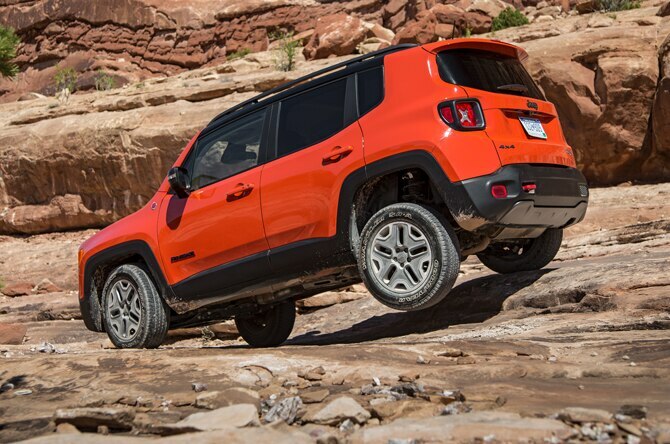 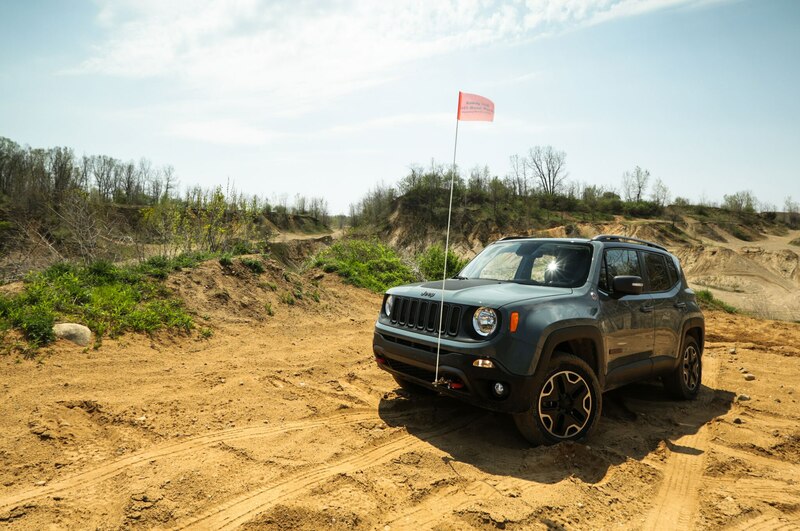 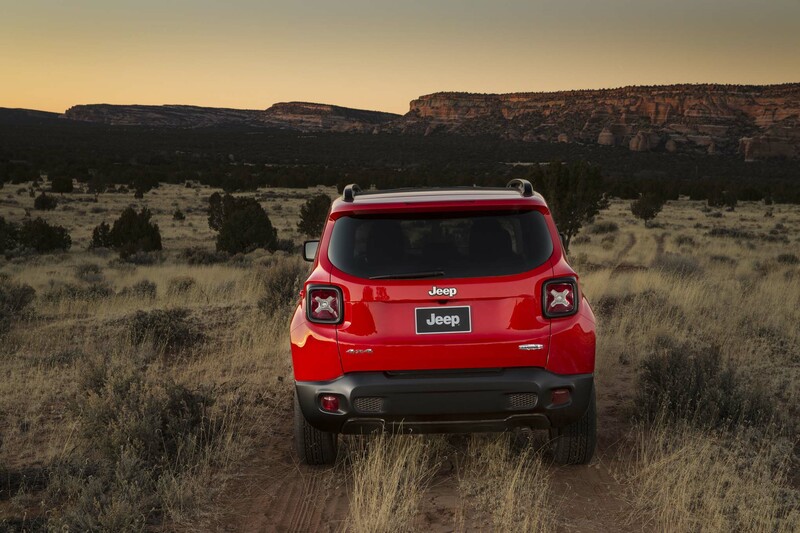 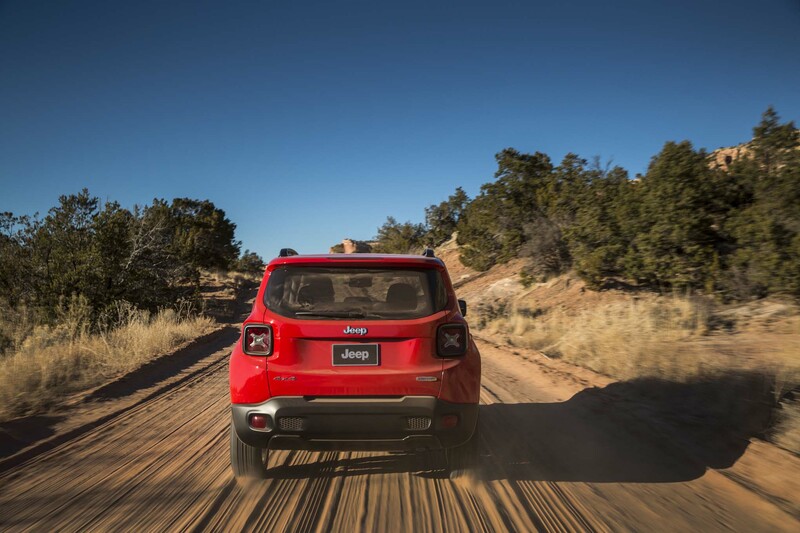 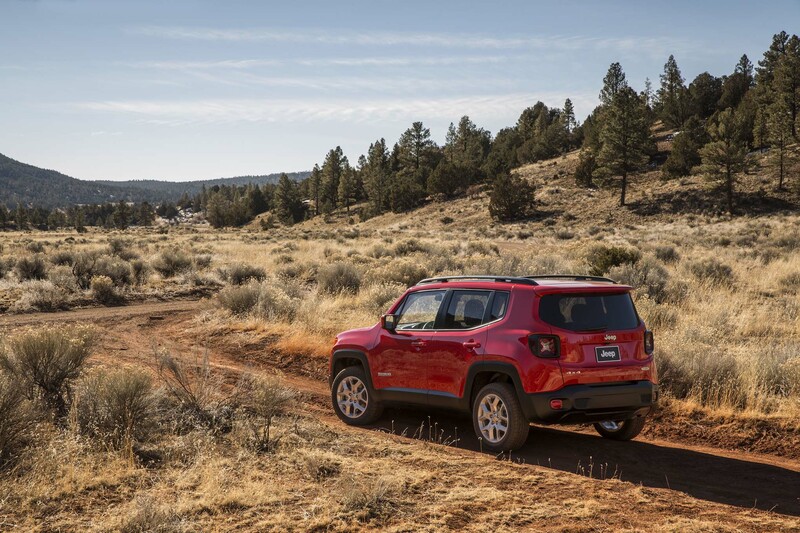 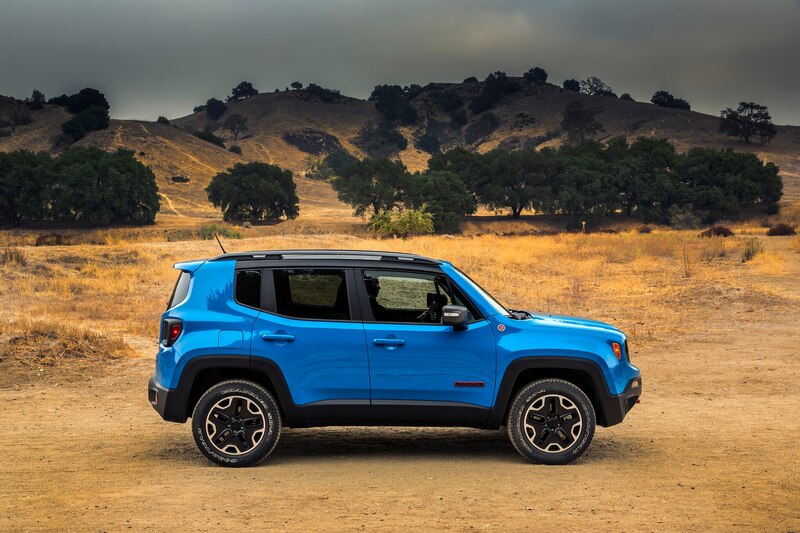 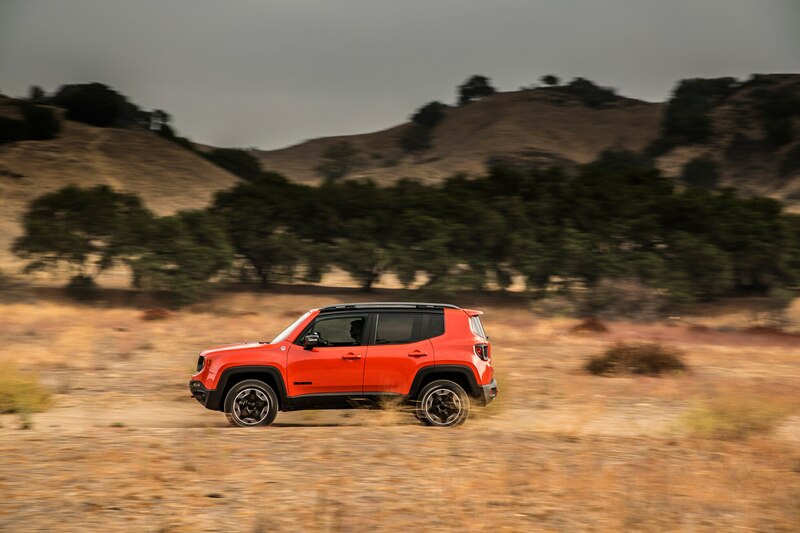 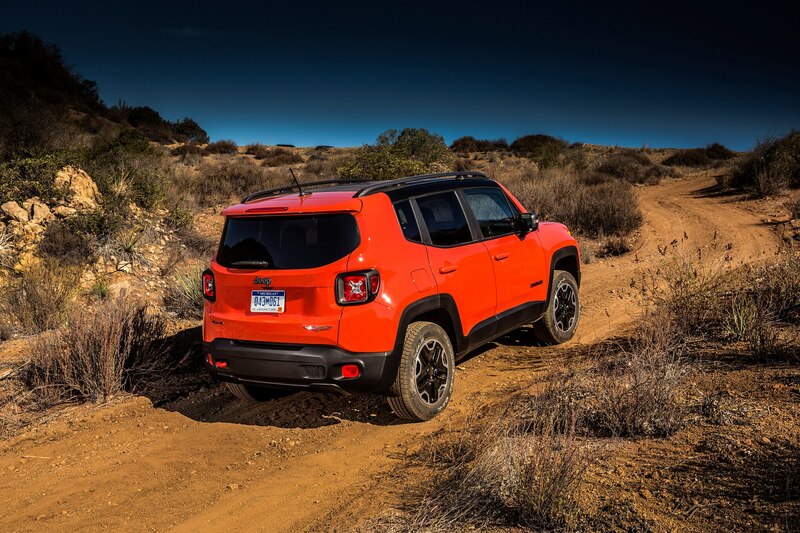 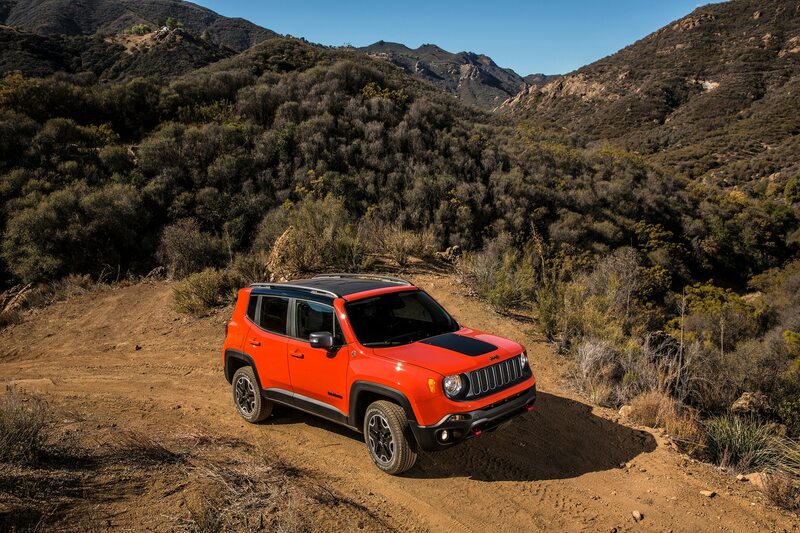 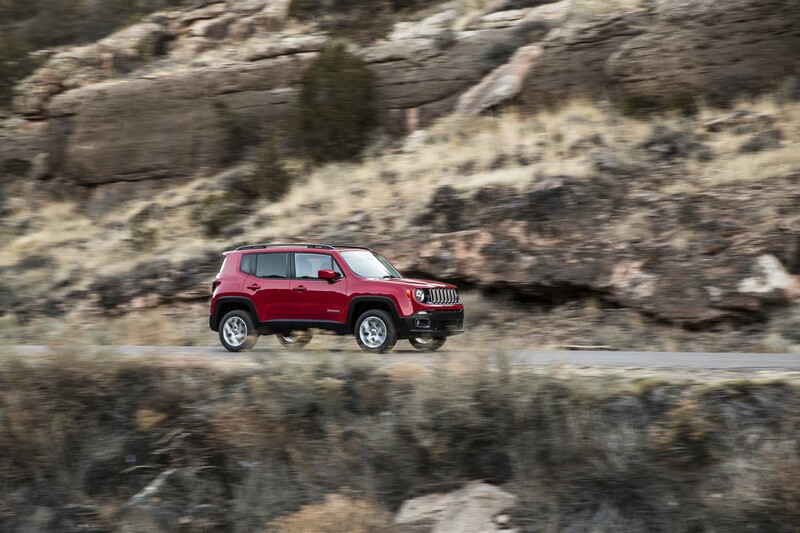 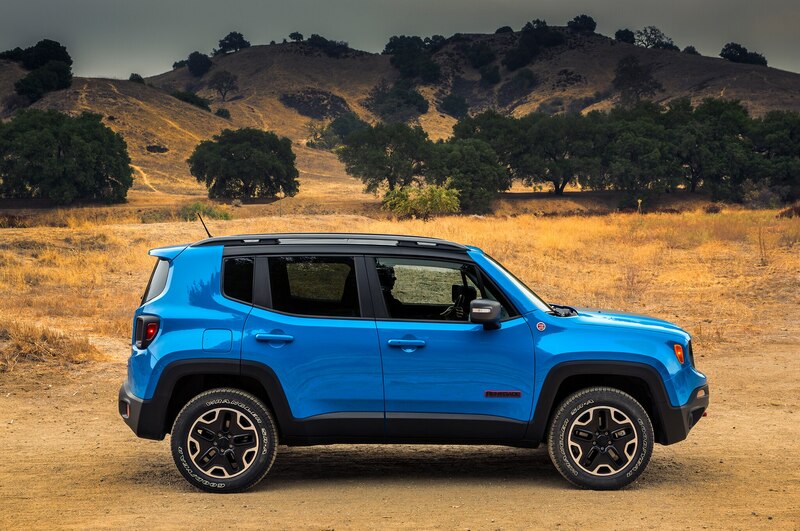 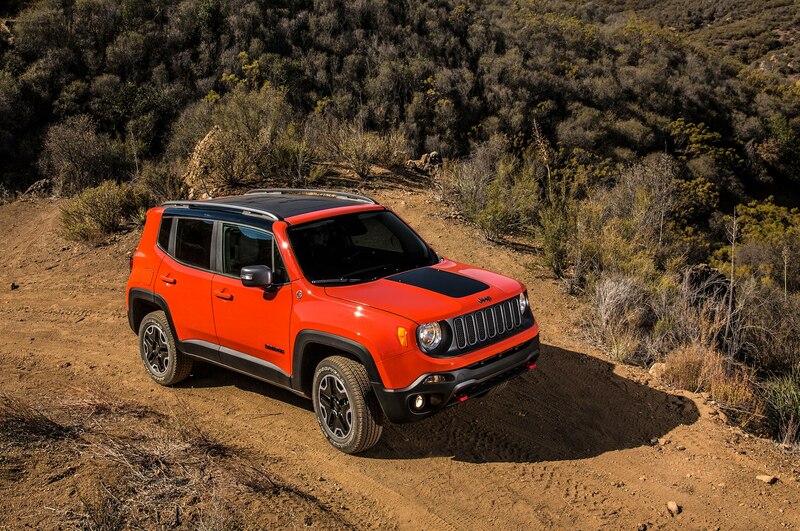 Jeep says the Renegade was designed and engineered in the United States to offer a combination of best-in-class fuel efficiency and off-road capability. 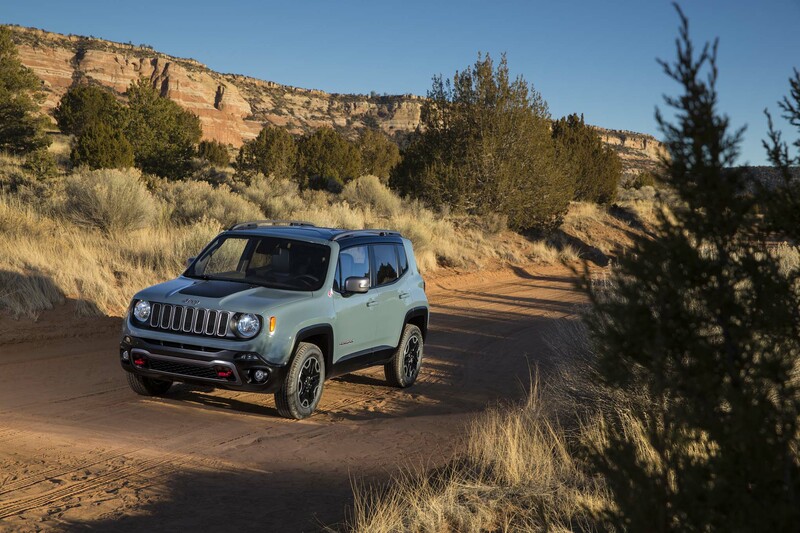 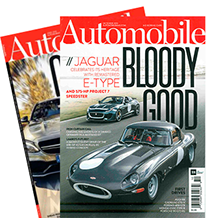 It will be offered with sixteen engines and four transmissions worldwide, though only two engines — neither of them diesels — and two transmissions will be offered in North America. 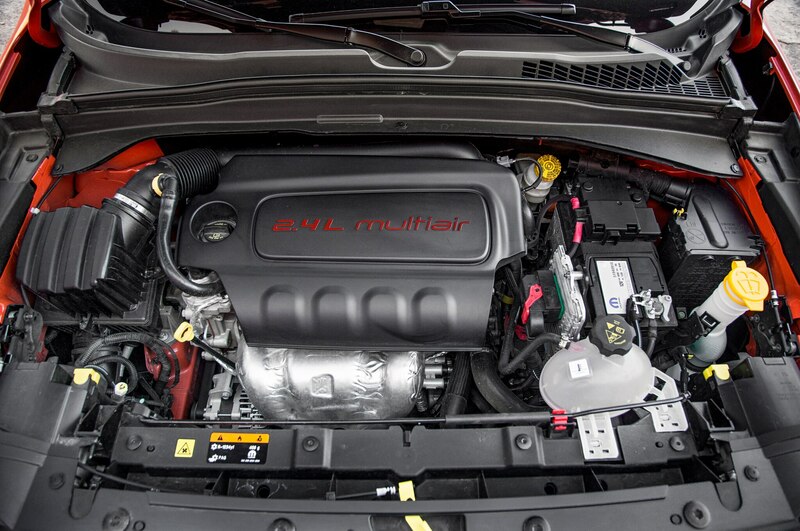 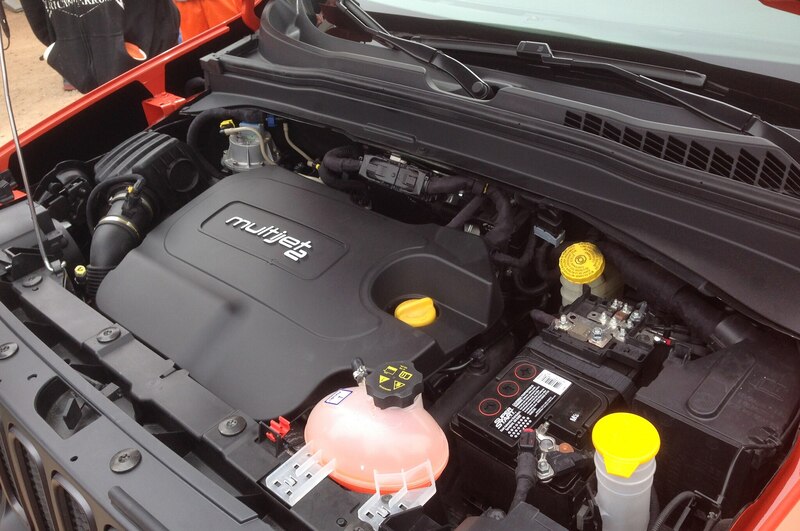 The base engine will be a 1.4-liter MultiAir turbocharged SOHC four making 160 hp and 170 lb-ft of torque. 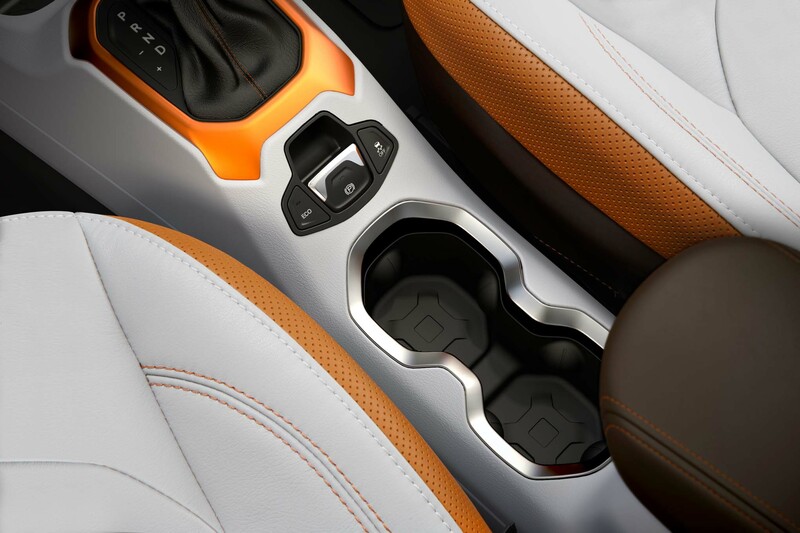 The optional engine will be the now-familiar 2.4-liter DOHC Tigershark four, with 184 hp and 177 lb-ft. 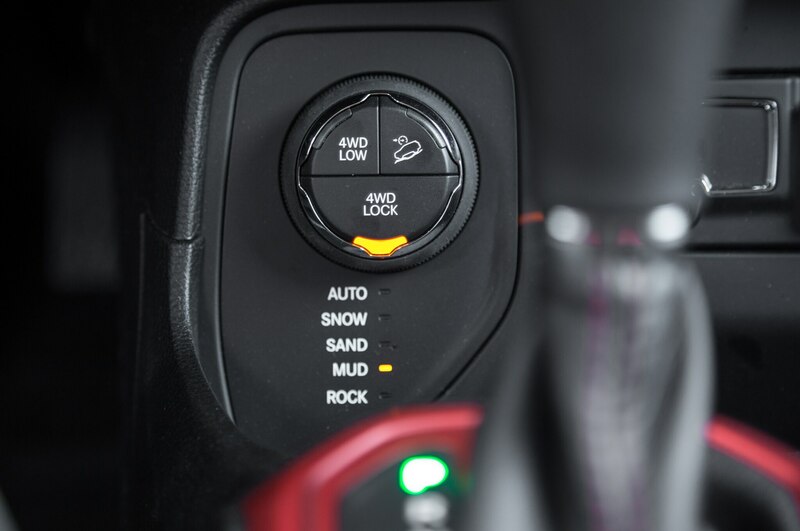 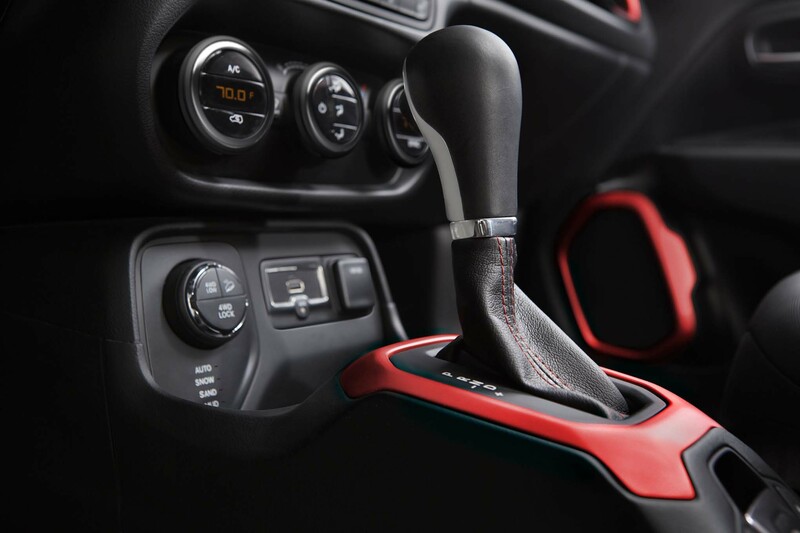 The MultiAir can be had with a six-speed manual or the nine-speed automatic; the Tigershark is only available with the nine-speed. 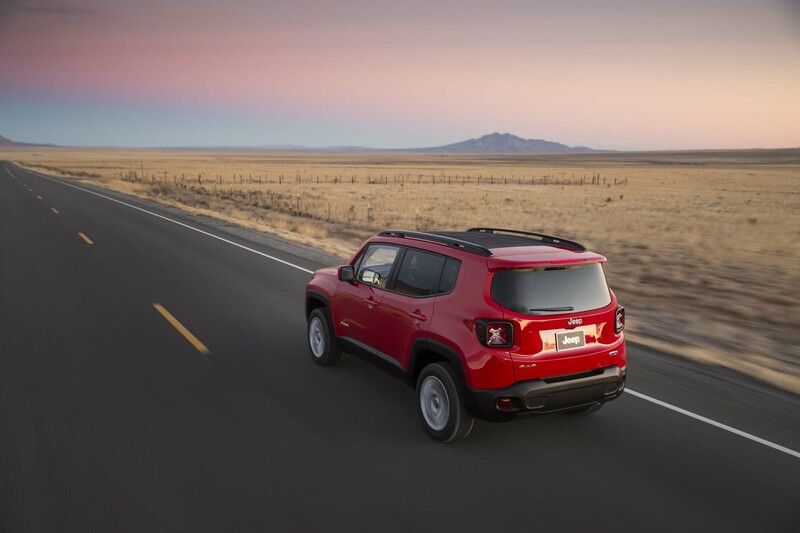 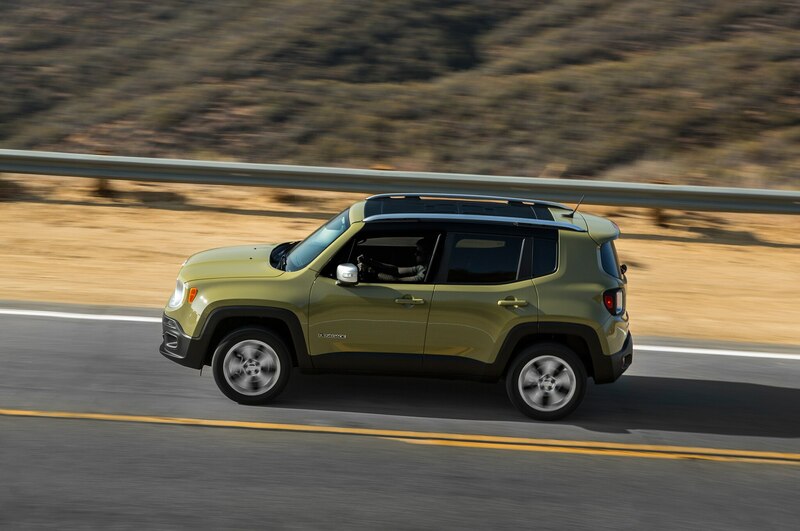 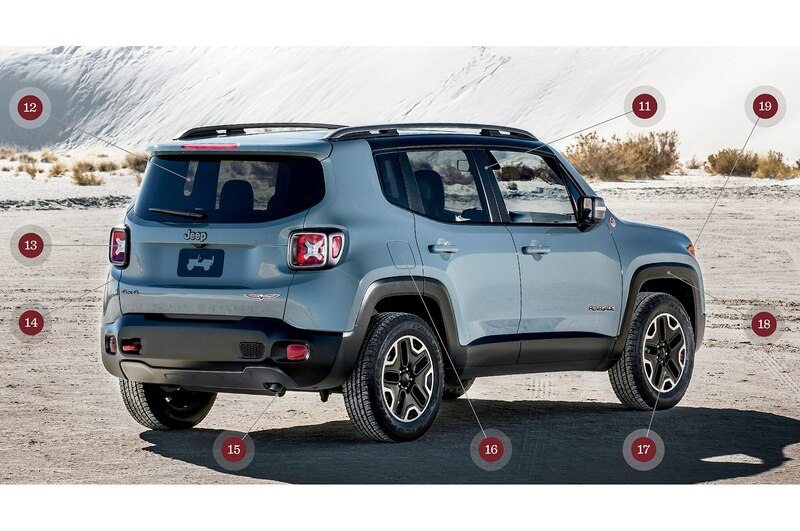 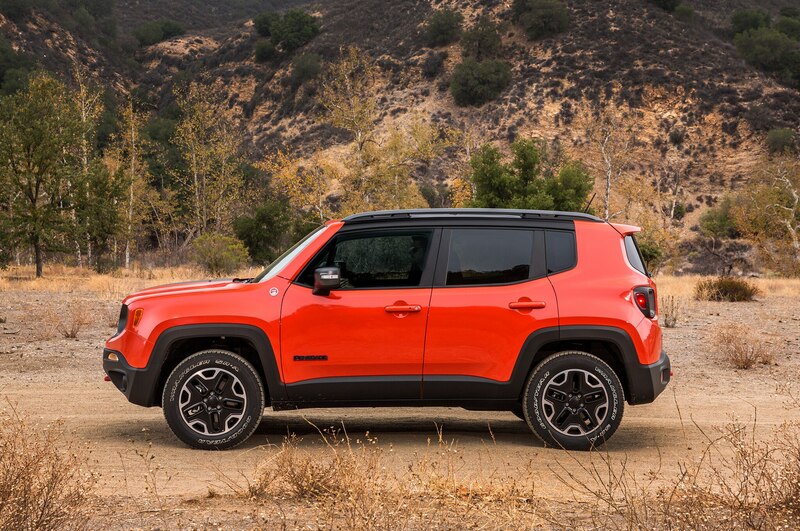 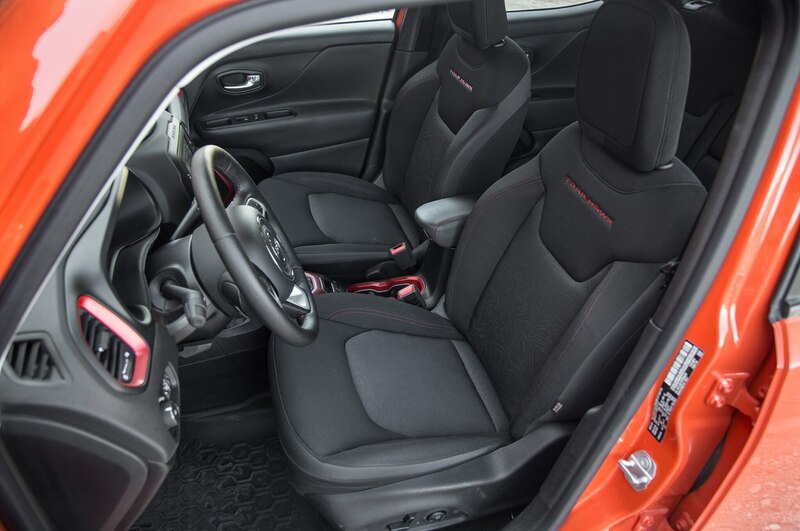 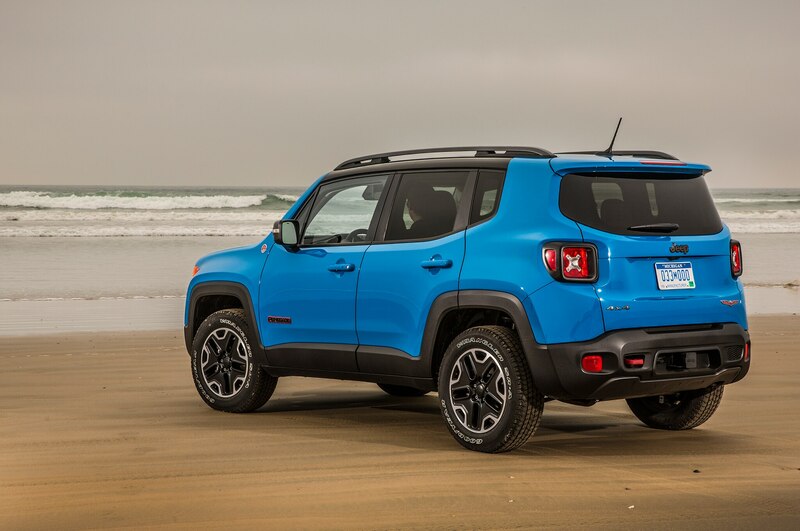 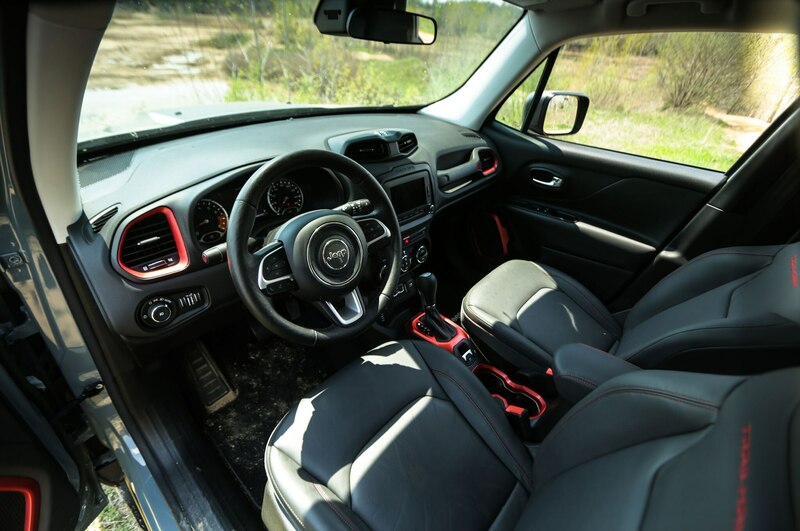 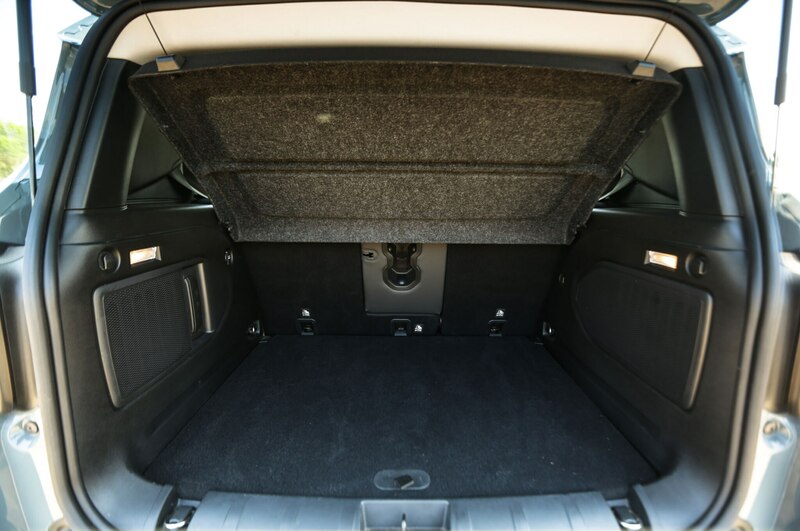 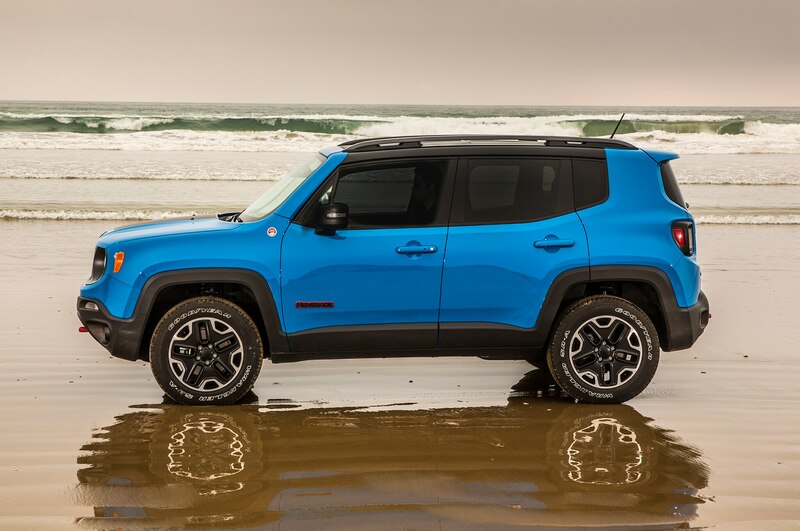 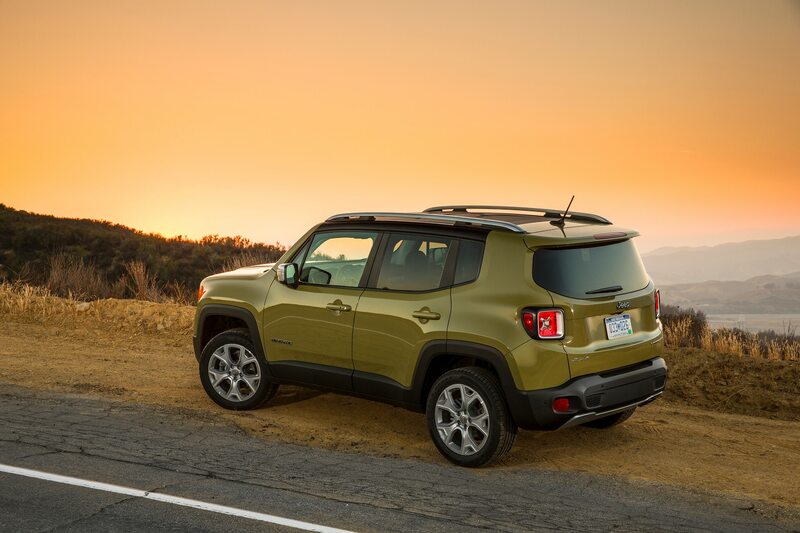 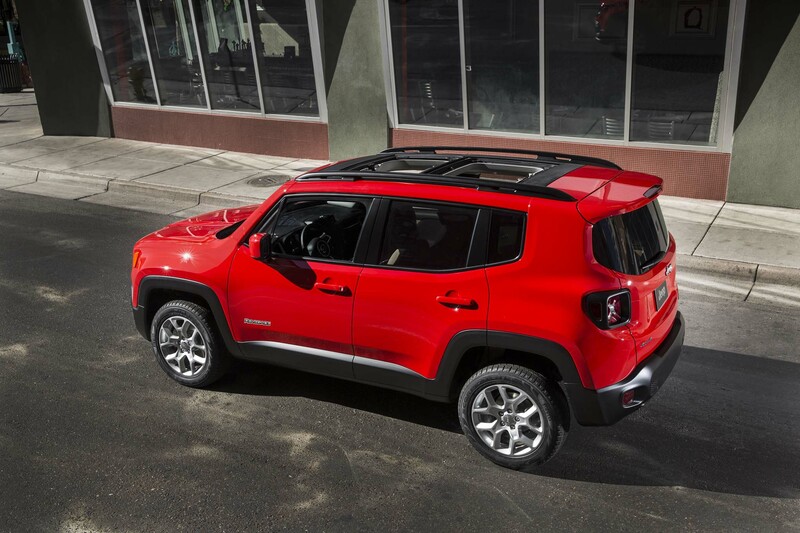 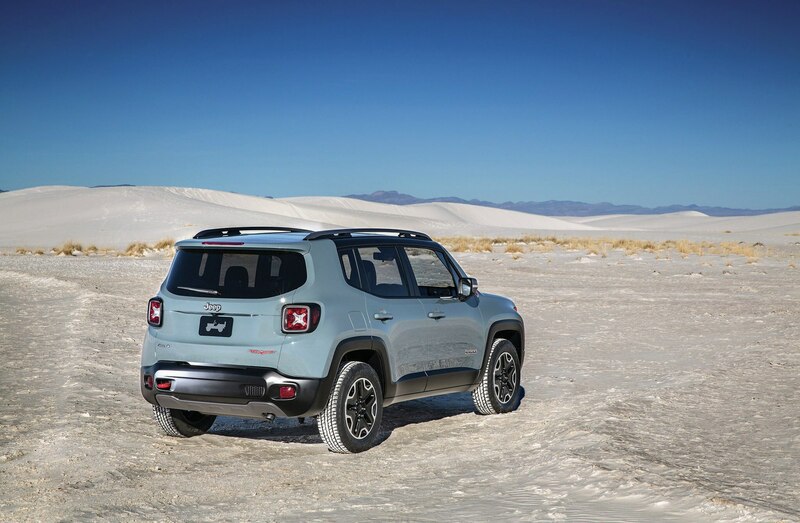 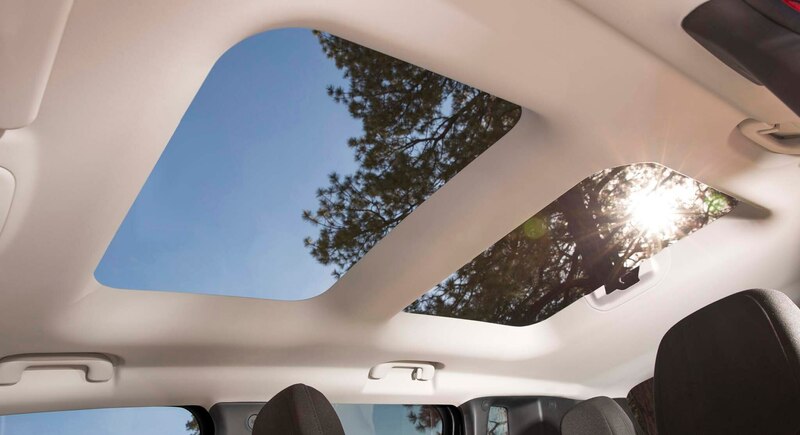 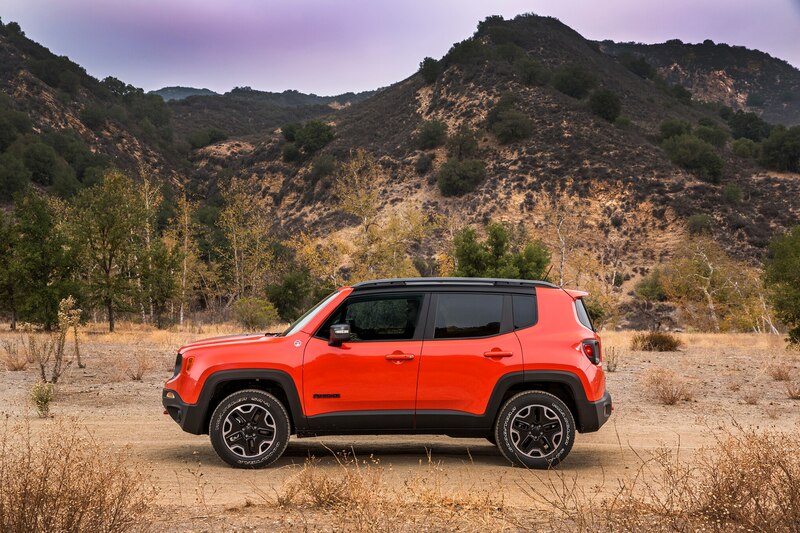 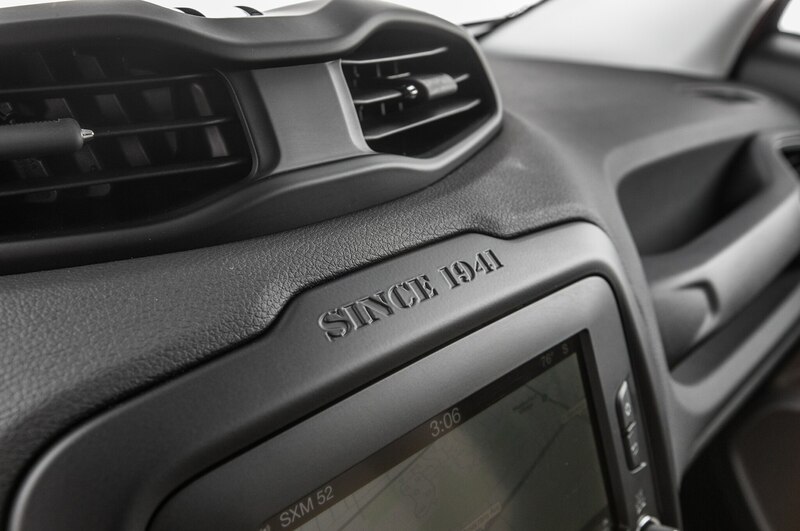 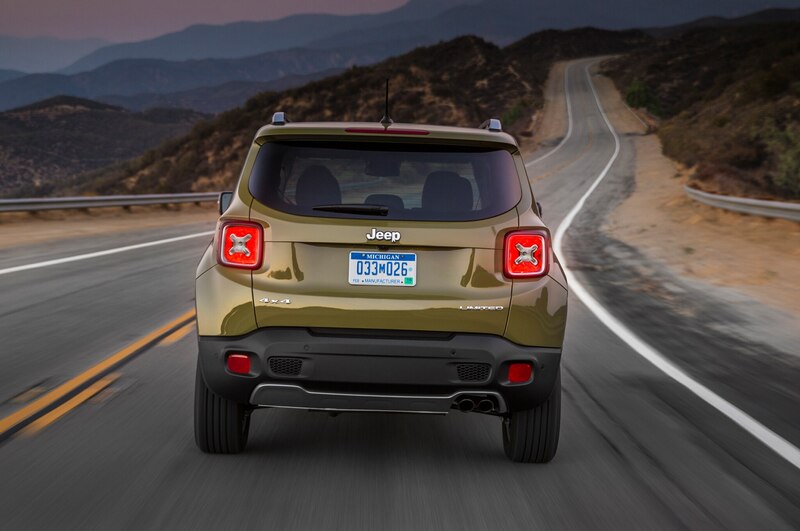 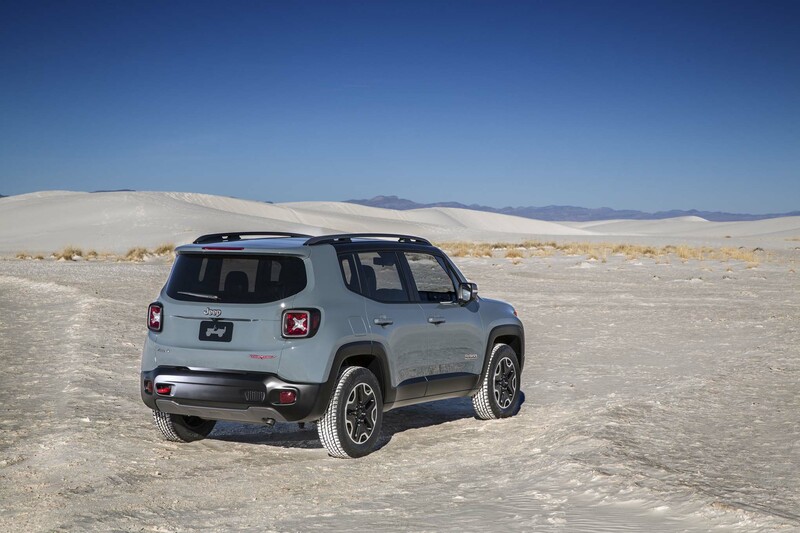 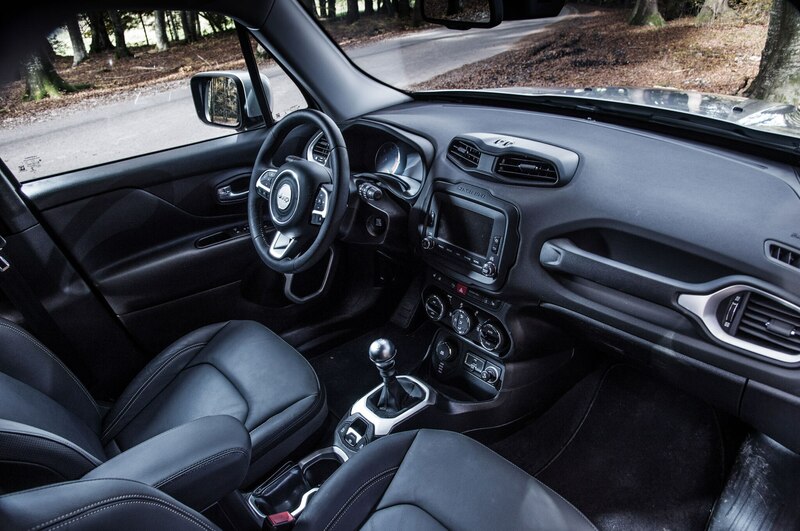 Unlike the 1941 Jeep MB, the 2015 Jeep Renegade is not an open/convertible sport utility, though it there is a choice of two optional open-air sunroofs, called My Air. 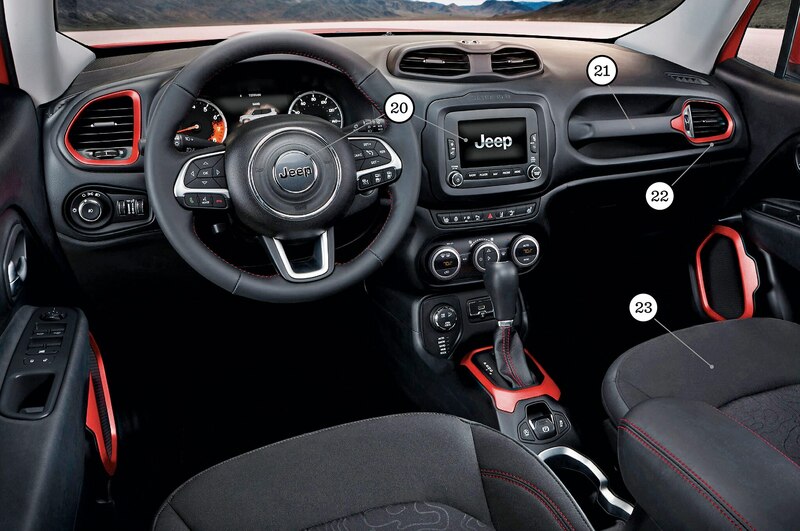 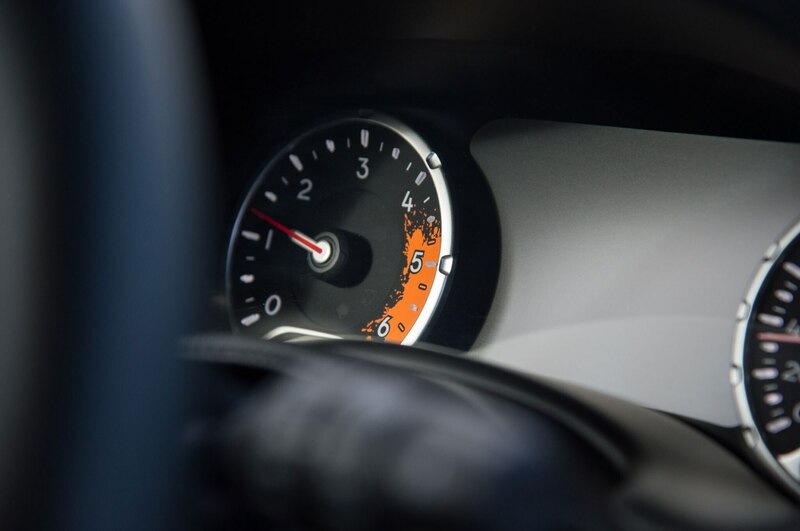 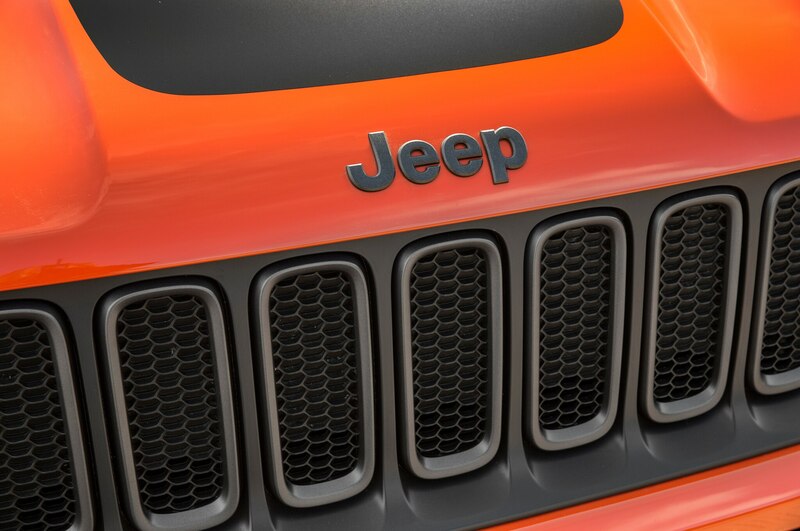 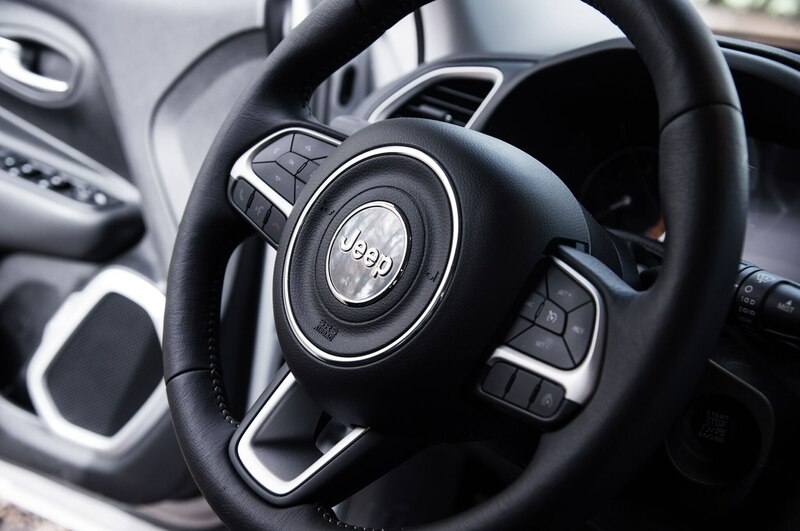 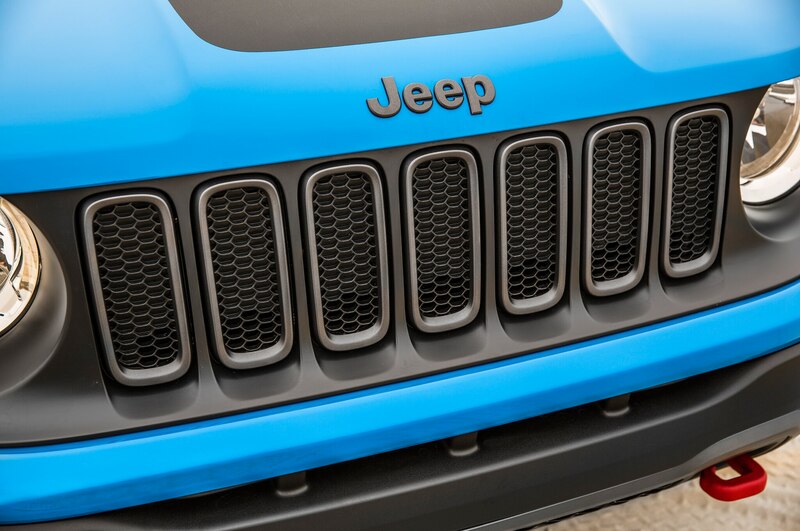 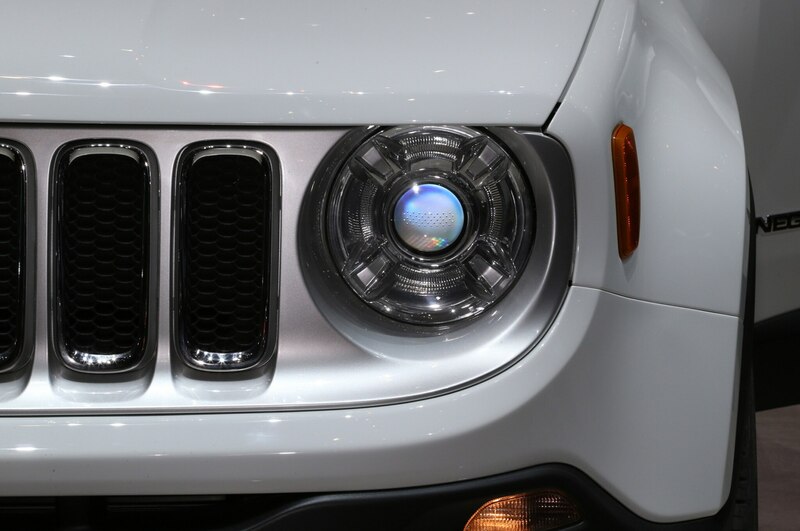 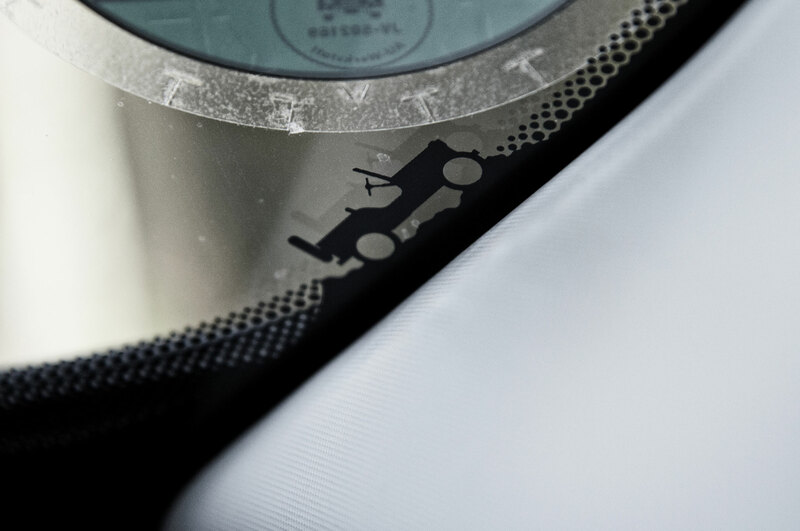 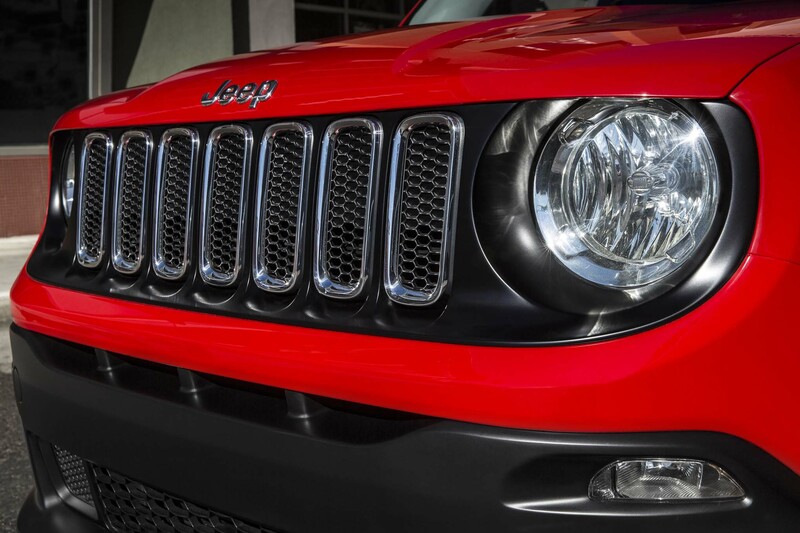 Jeep claims the segment’s largest full-color instrument cluster, at seven inches. 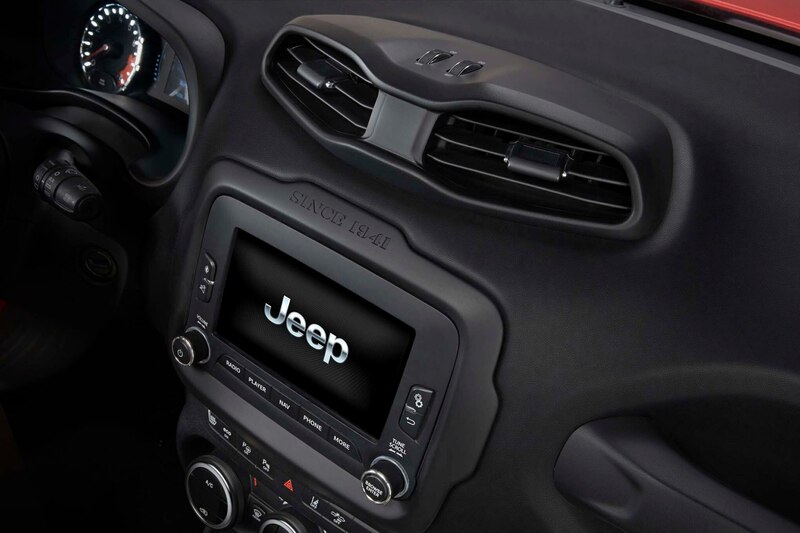 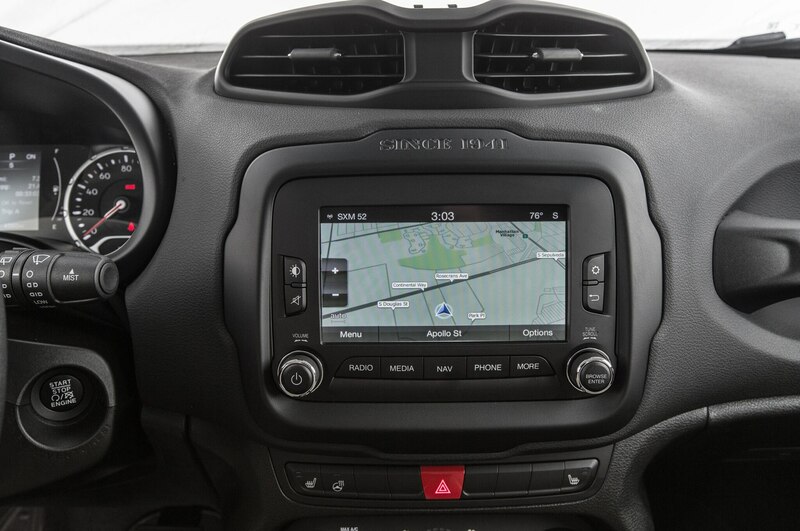 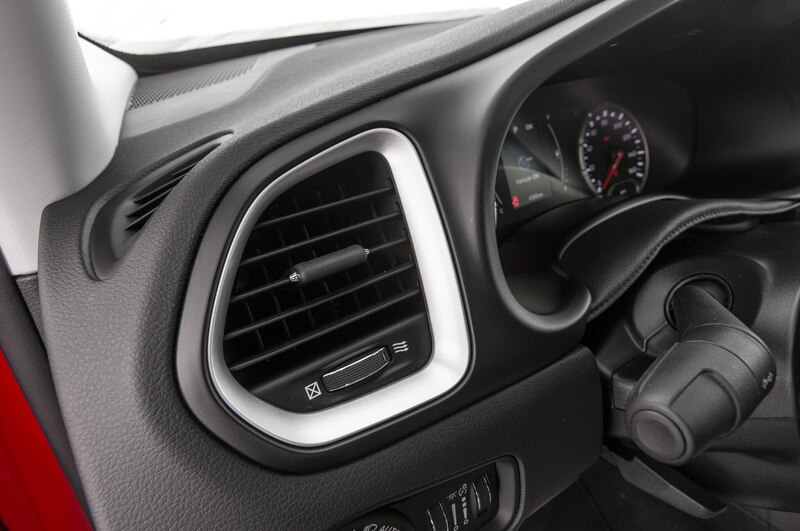 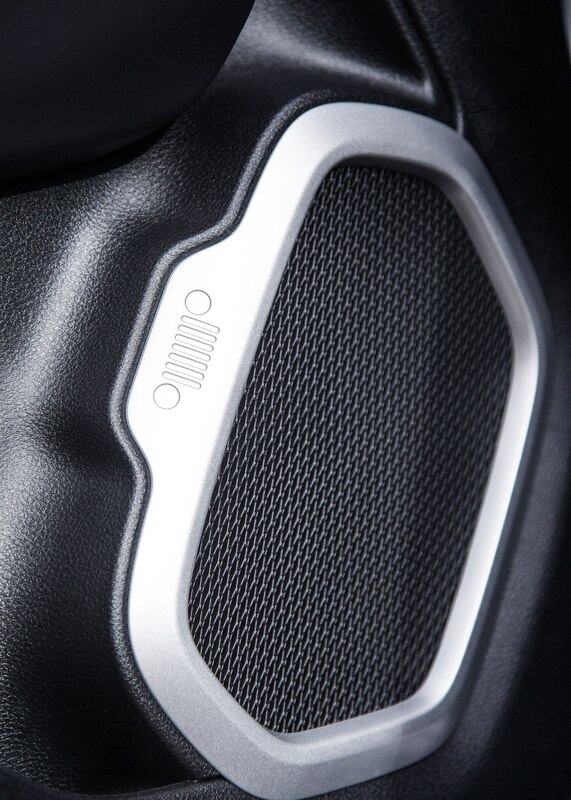 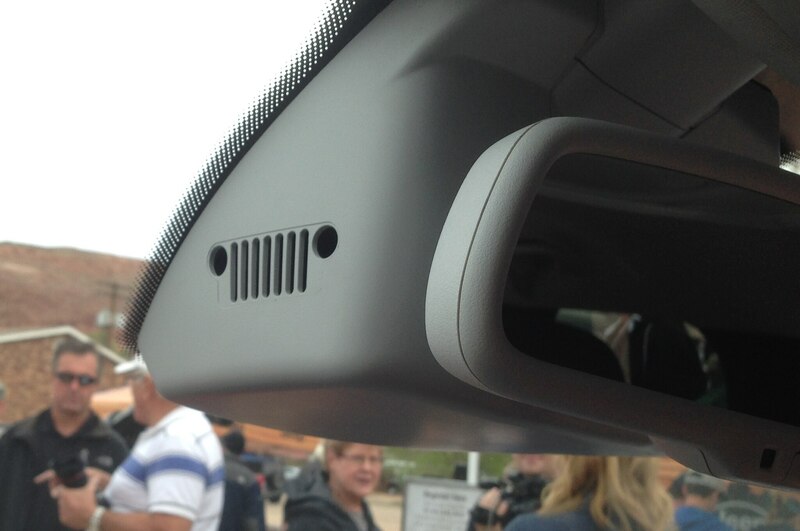 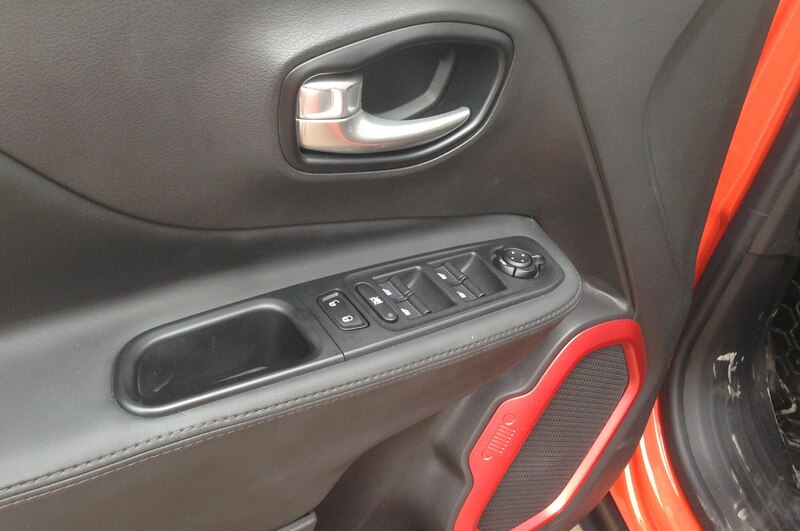 Chrysler’s Uconnect Access and touchscreen radios will also be available. 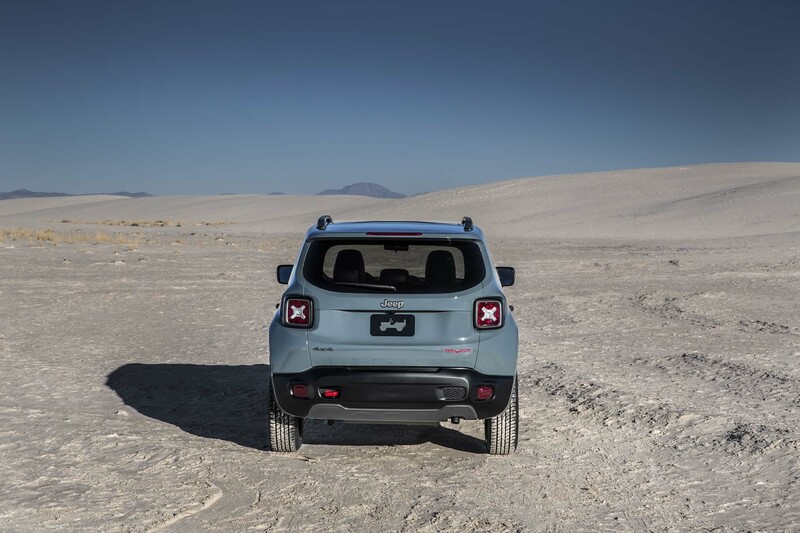 The Uconnect access, available only in U.S.-spec Renegades, includes one-touch 911 emergency service access, cloud-based voice-texting and Yelp services, and on-demand Wi-Fi hotspot connectivity. 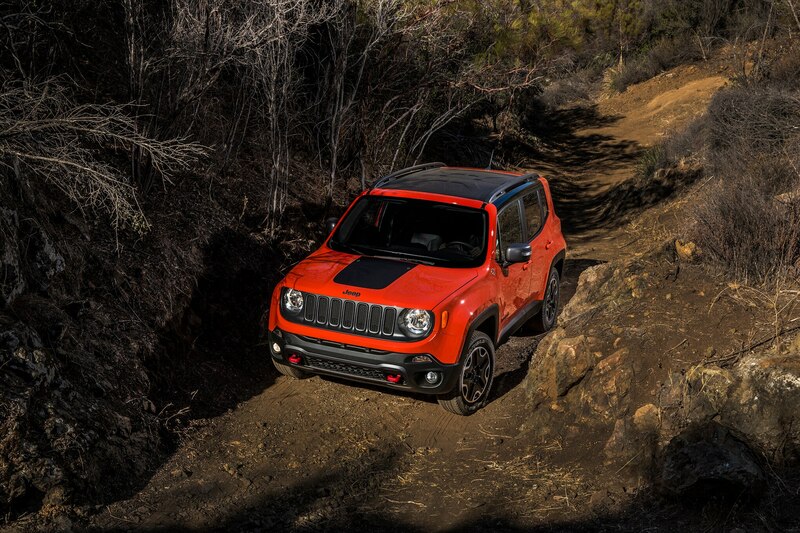 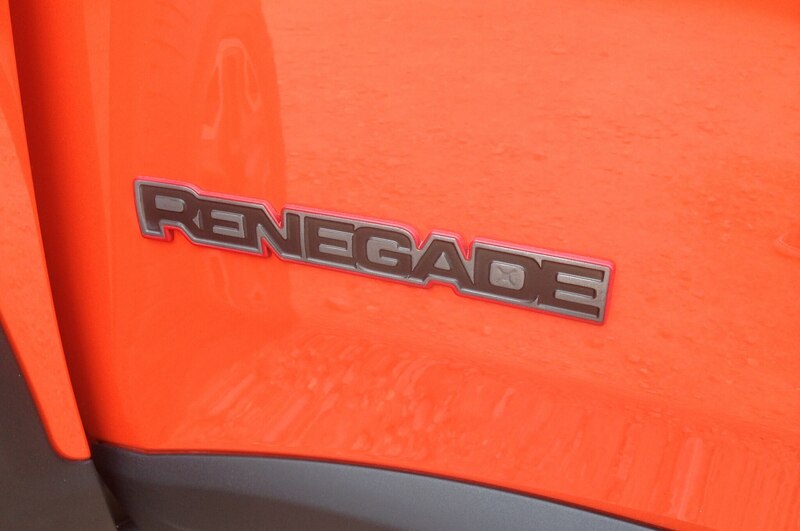 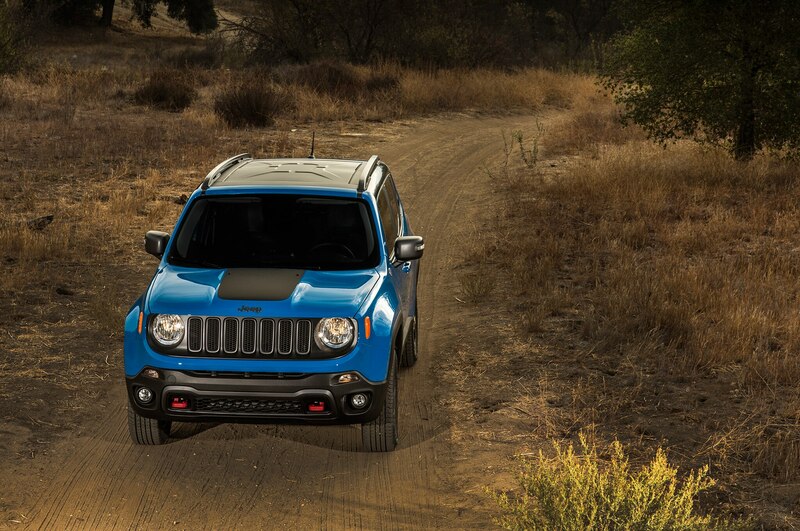 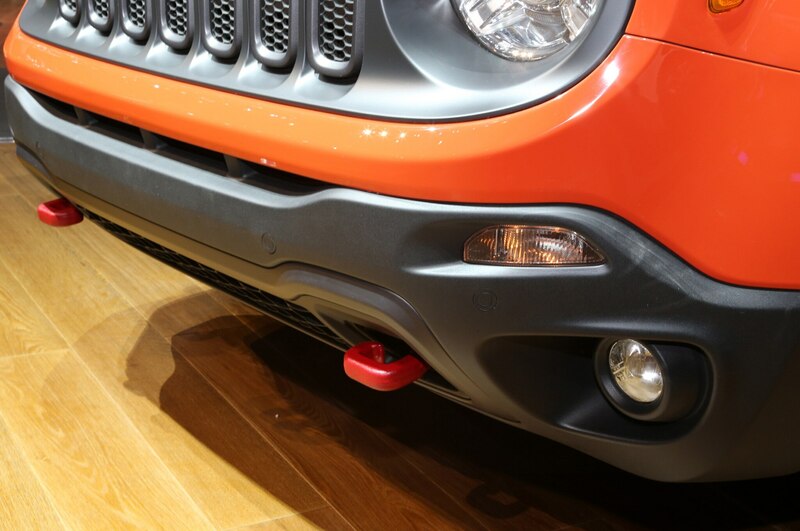 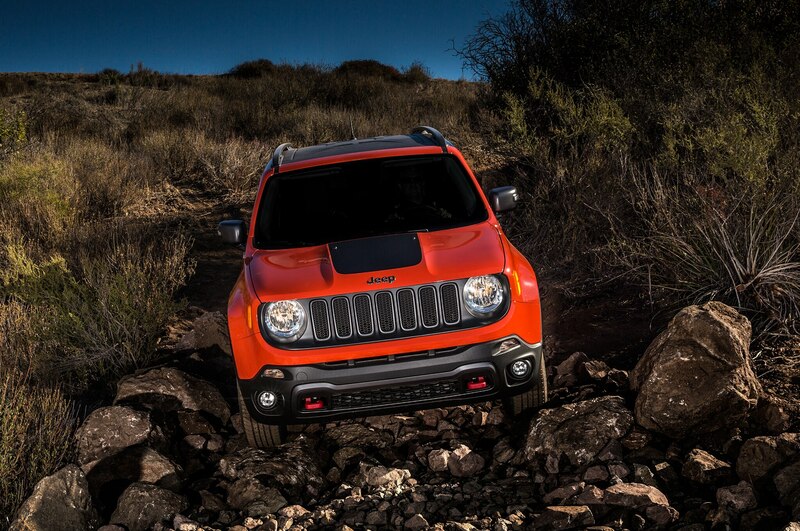 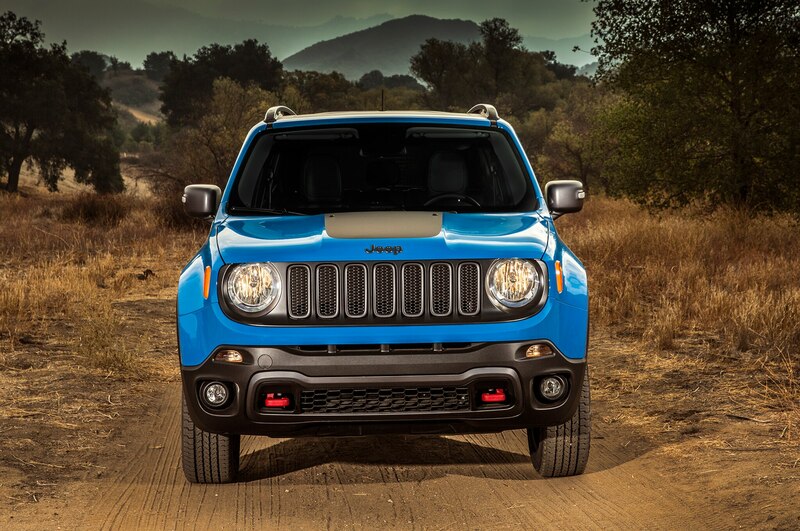 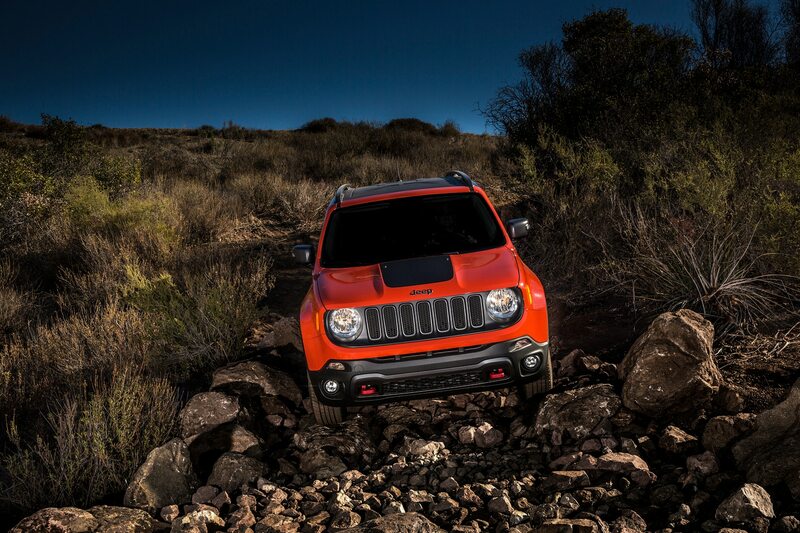 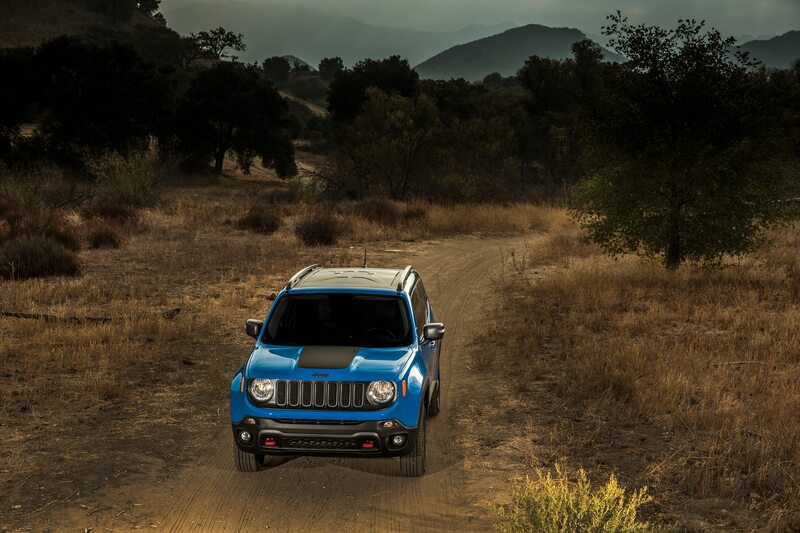 The Renegade will also be available with front-wheel drive. 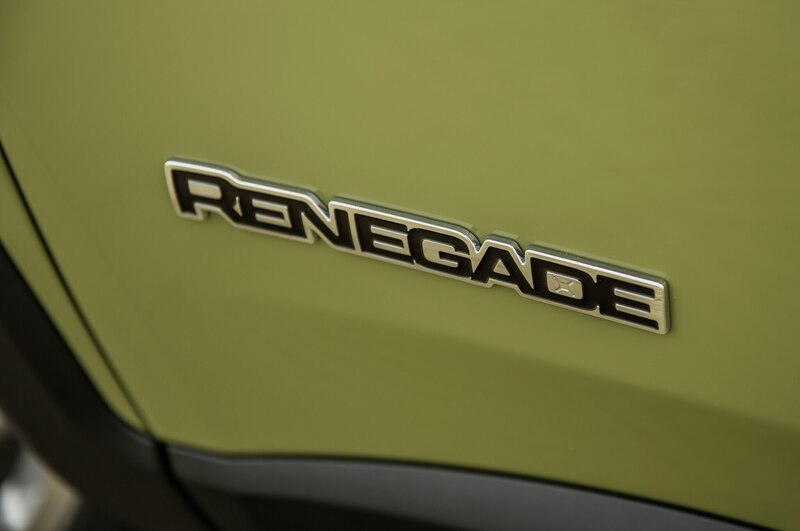 In this modern world, the belief that real SUVs have longitudinally mounted engines and body-on-frame construction is a quaint notion of the past – see Range Rover Evoque to illustrate that is no longer true. 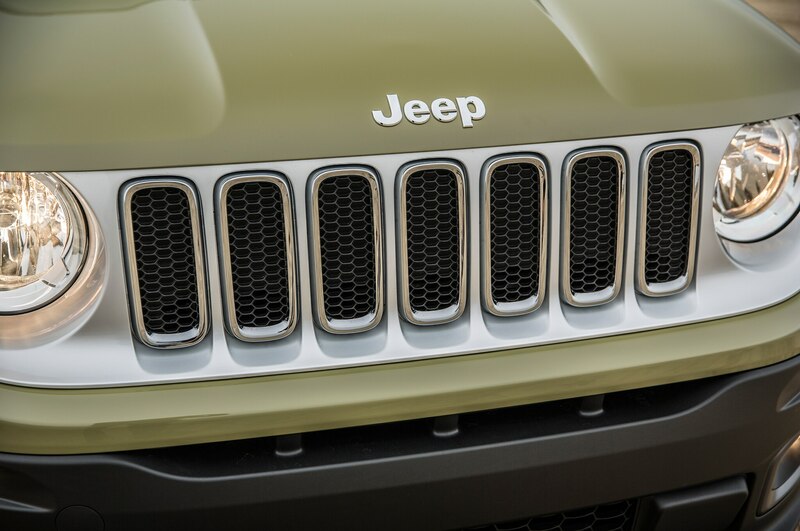 For purists, there’s still the very popular, highly profitable Wrangler/Wrangler Unlimited and Grand Cherokee. The Fiat-based Renegade — which at 166.6 inches long, 71 inches wide, and 66.5 inches tall is 36.7 inches longer, one foot wider, and 0.8 inch lower than the original WWII Jeep — is the model the brand needs to make it one of two Fiat-Chrysler divisions, with Alfa Romeo, slated to go global. 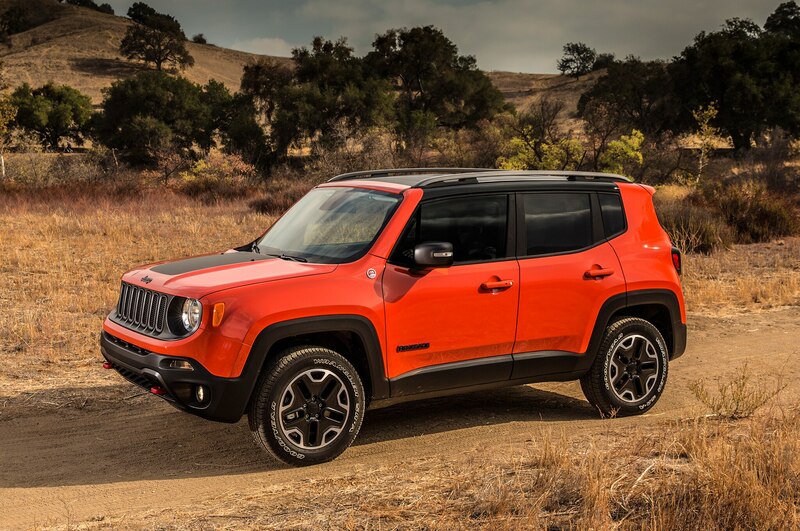 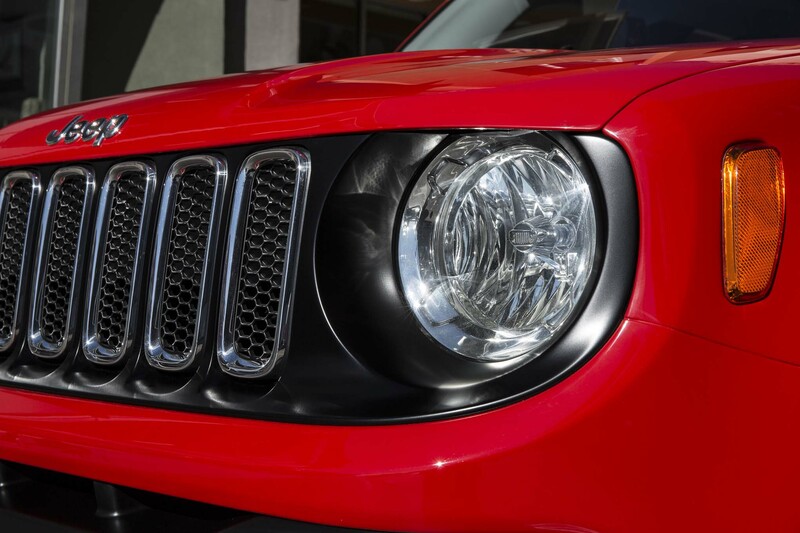 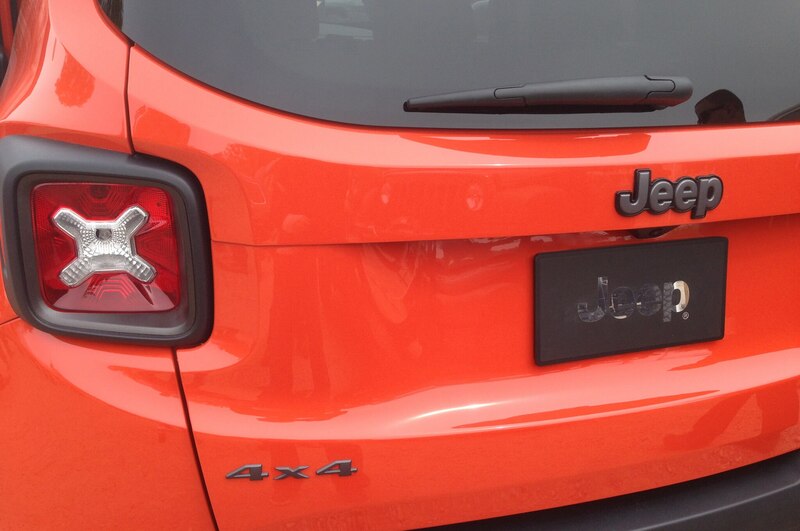 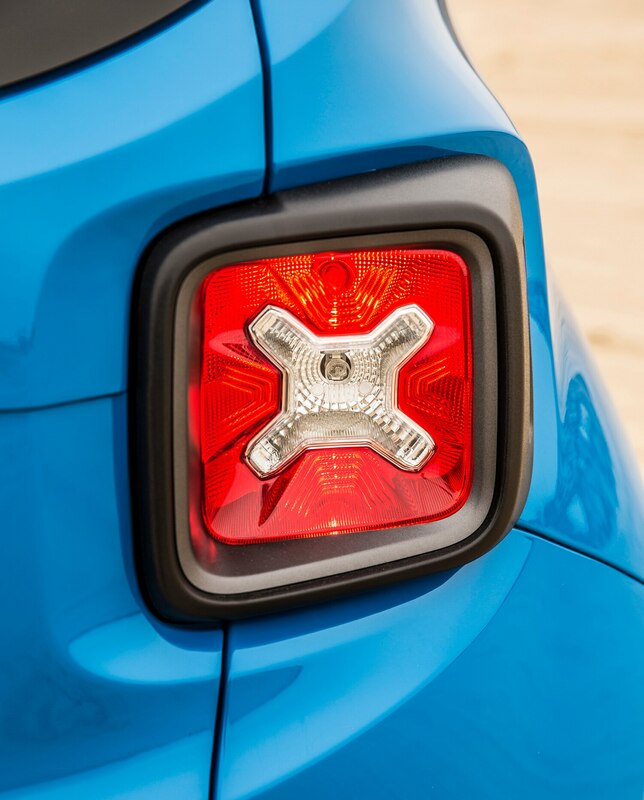 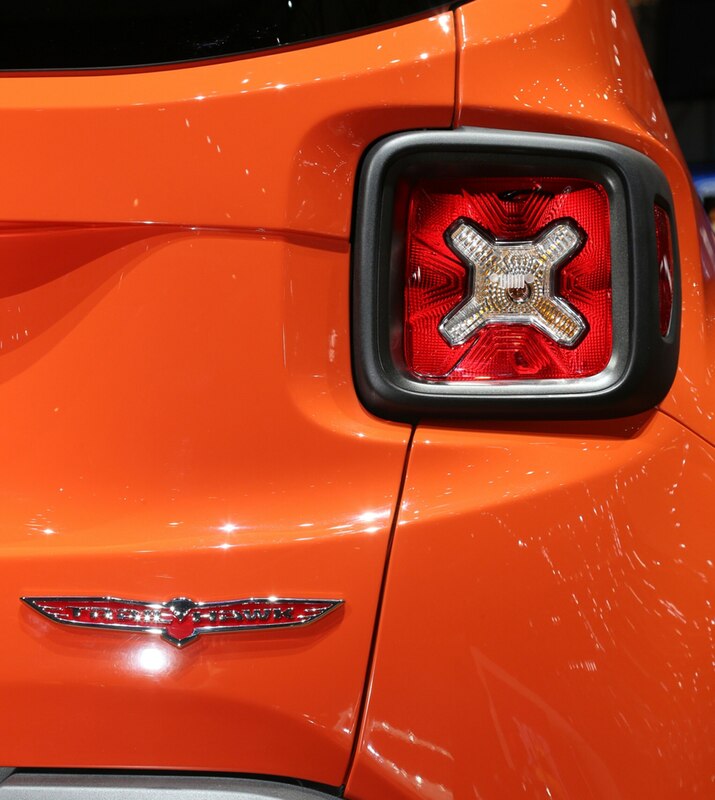 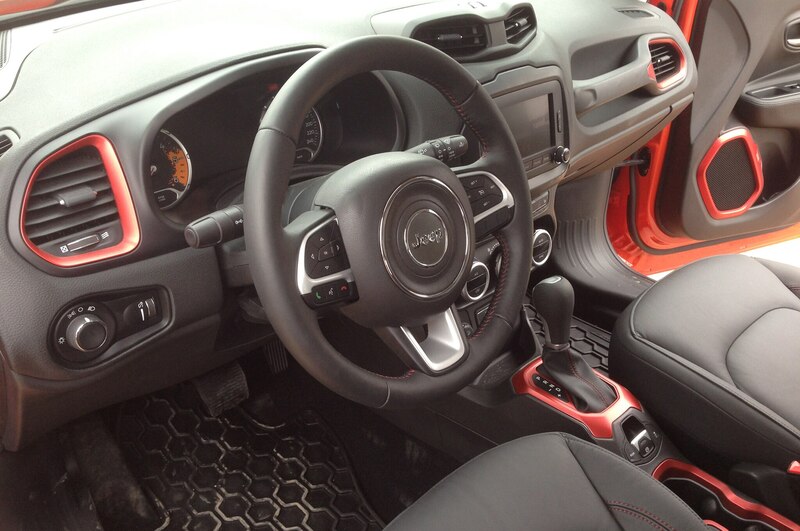 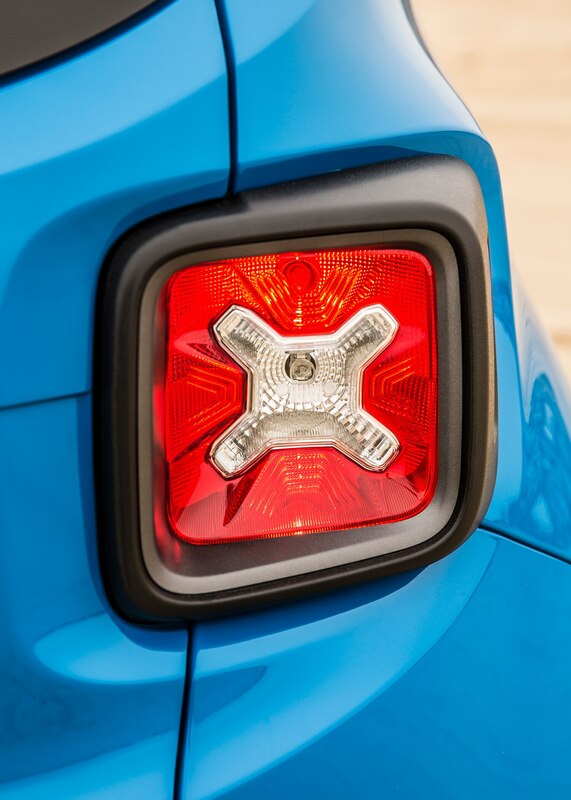 Cumberford: The Jeep Renegade is over styled. 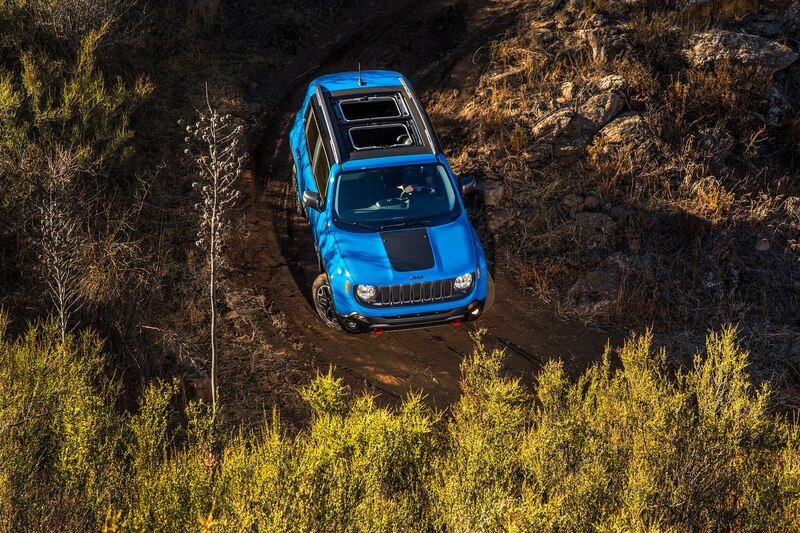 It doesn’t look like a Jeep — more a Korean Jeep.